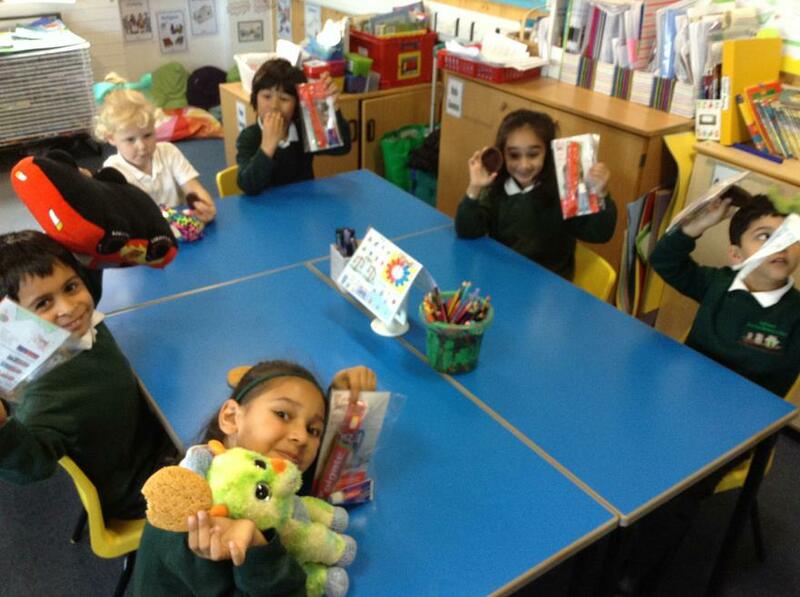 From the Spring 2 Term Guided Reading books will be changed over the course of the week rather than on a Monday. 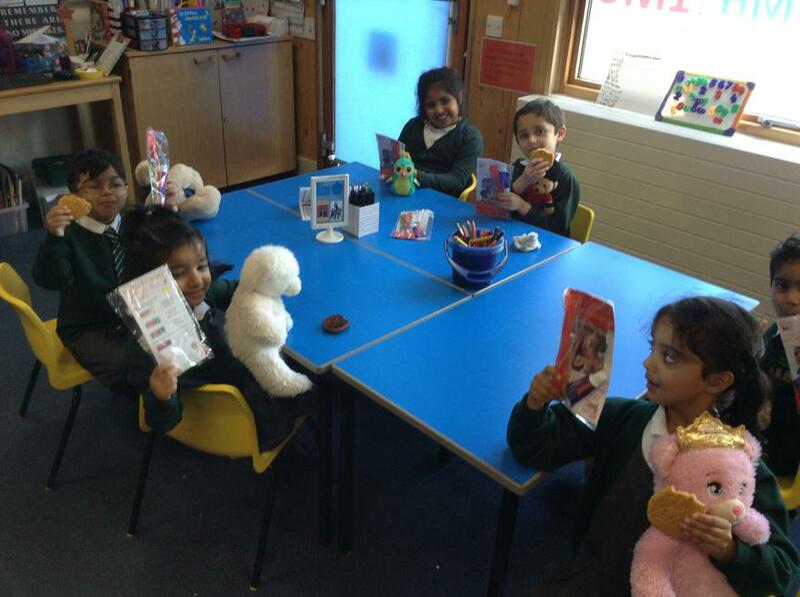 Therefore, please ensure your child's Guided Reading books are in school every day. 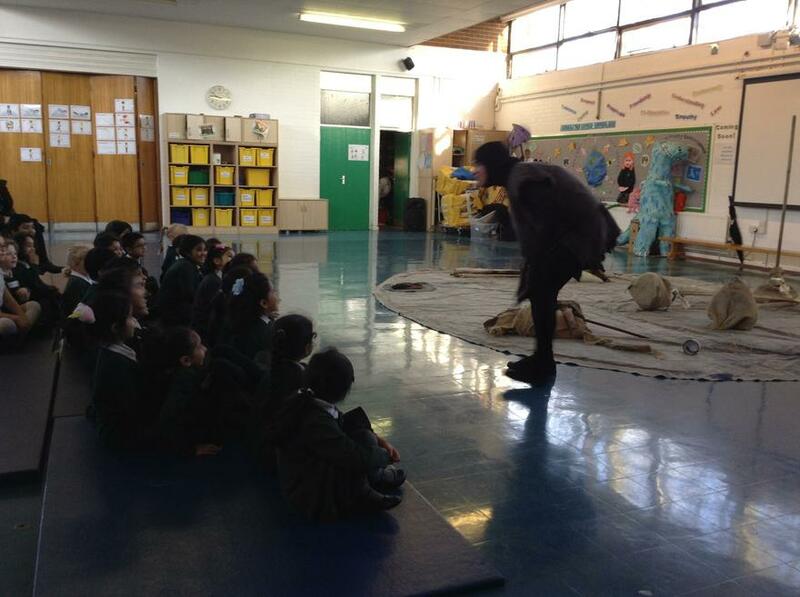 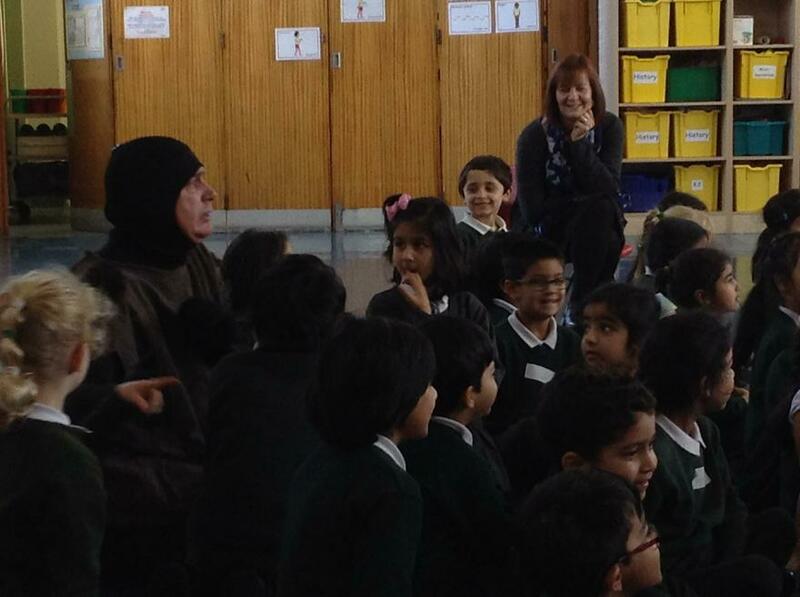 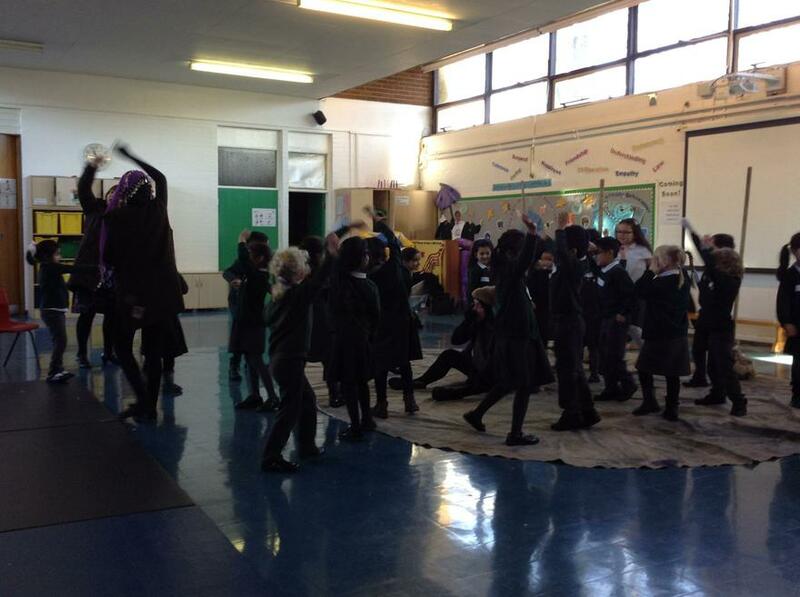 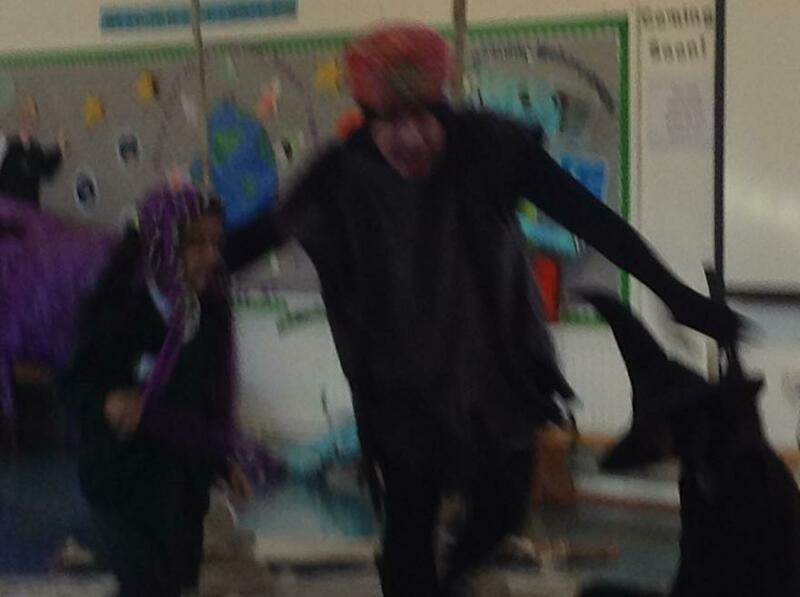 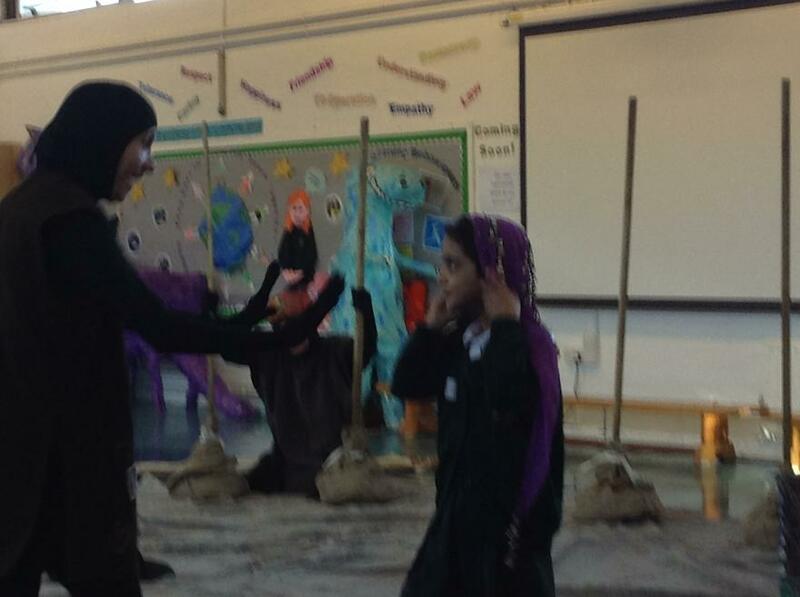 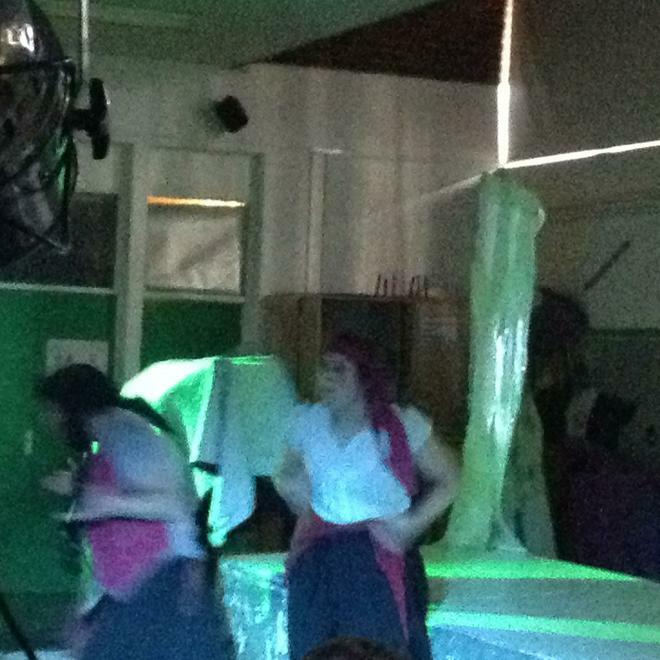 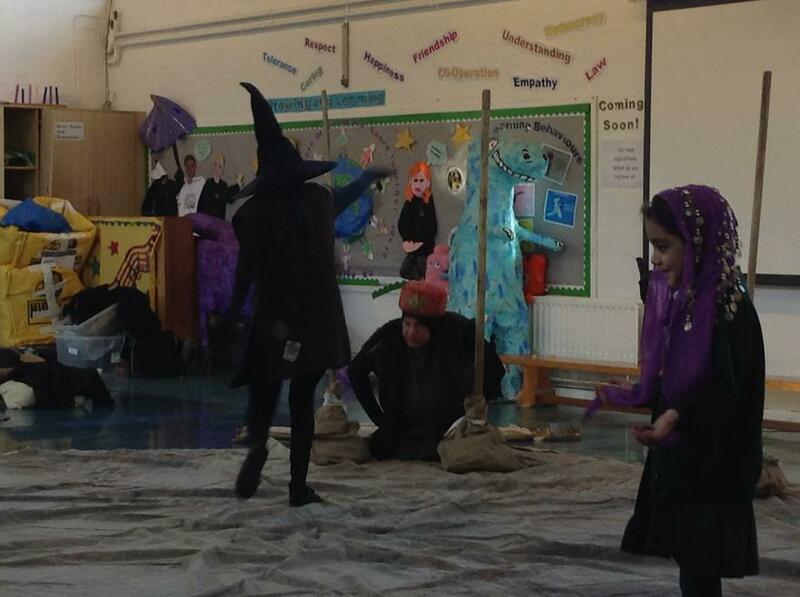 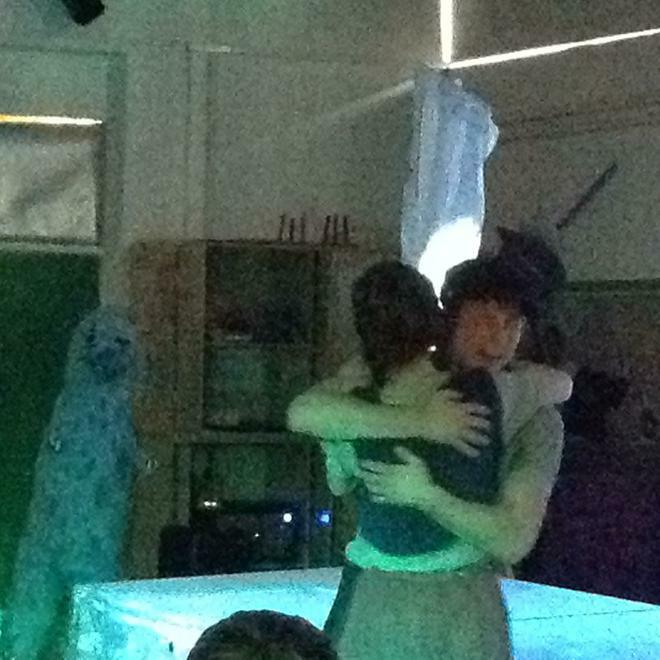 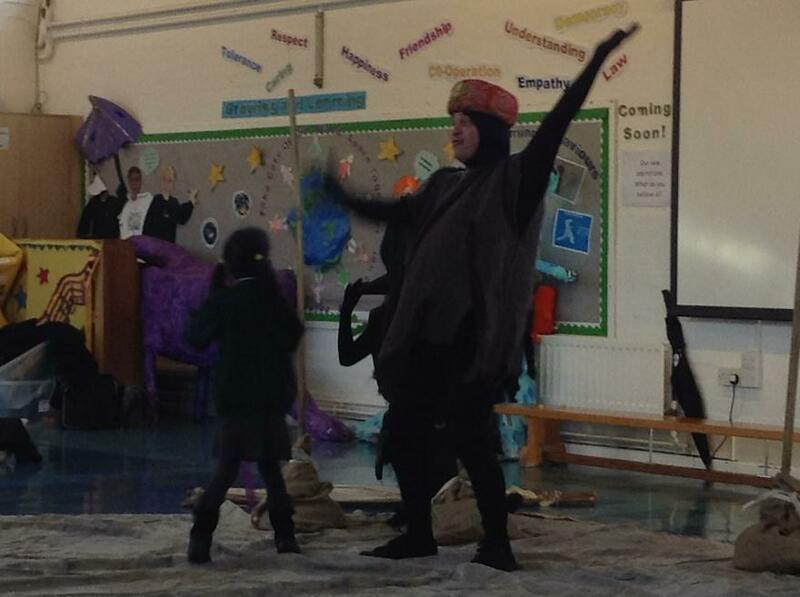 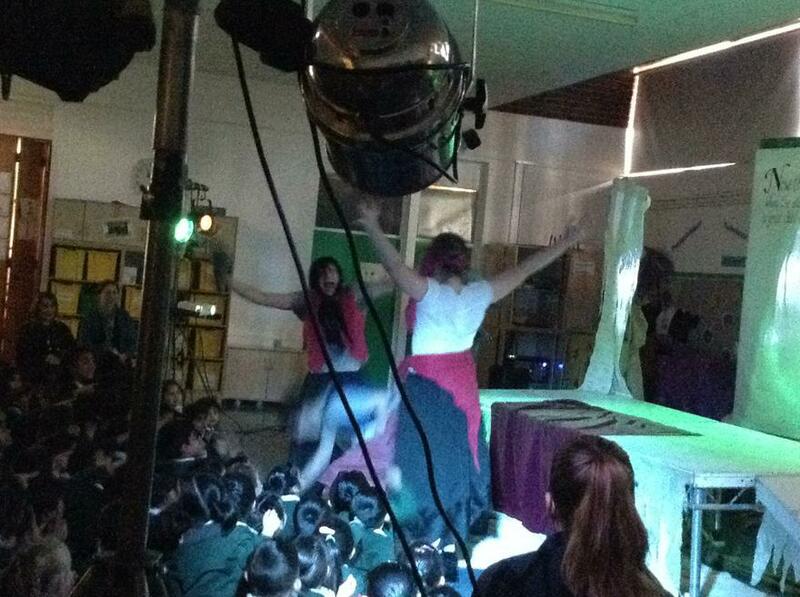 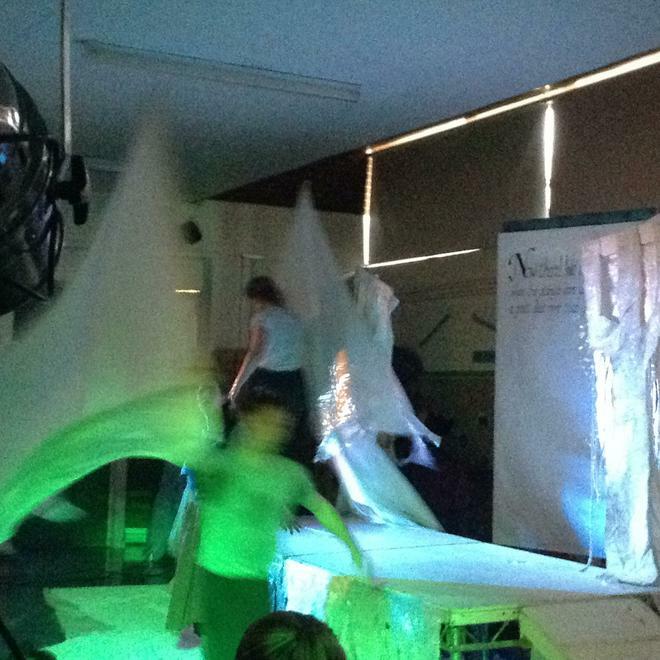 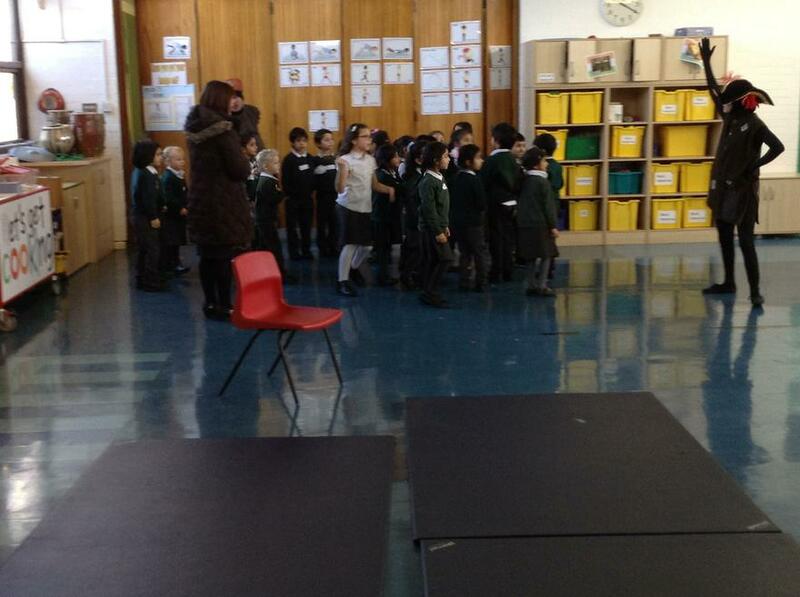 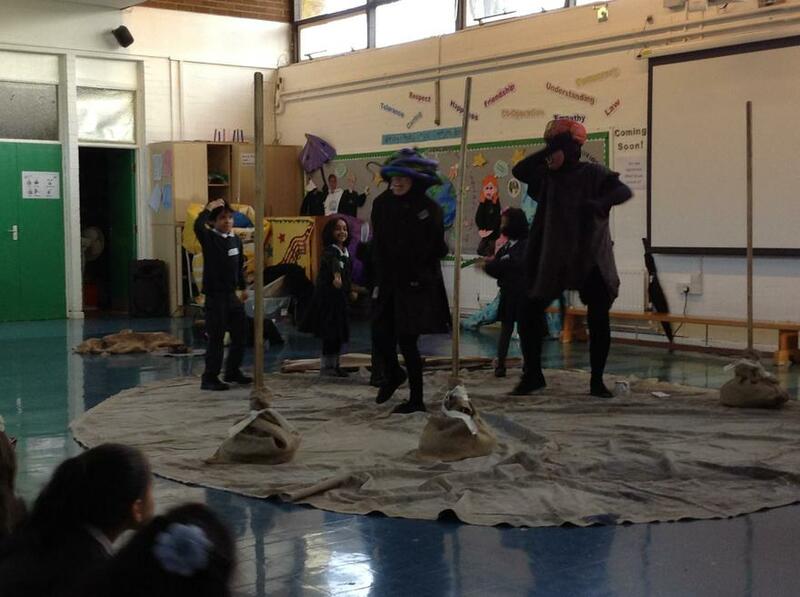 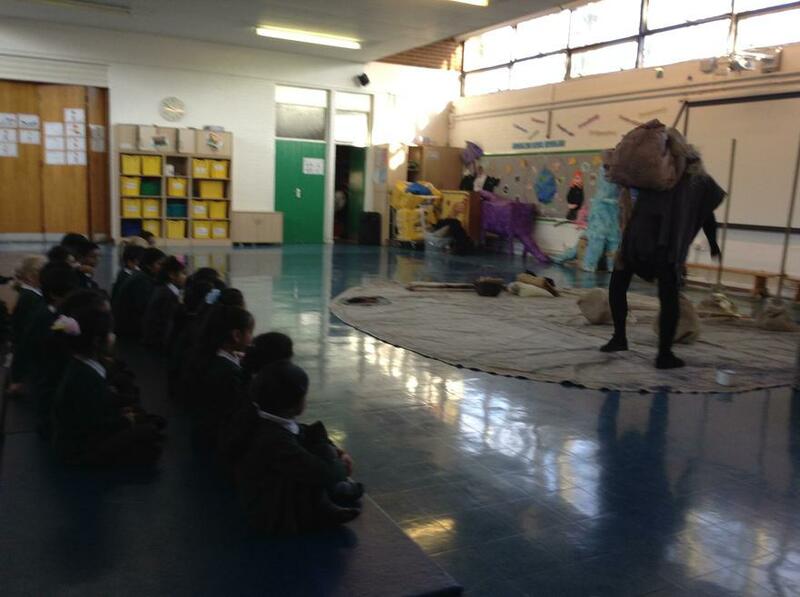 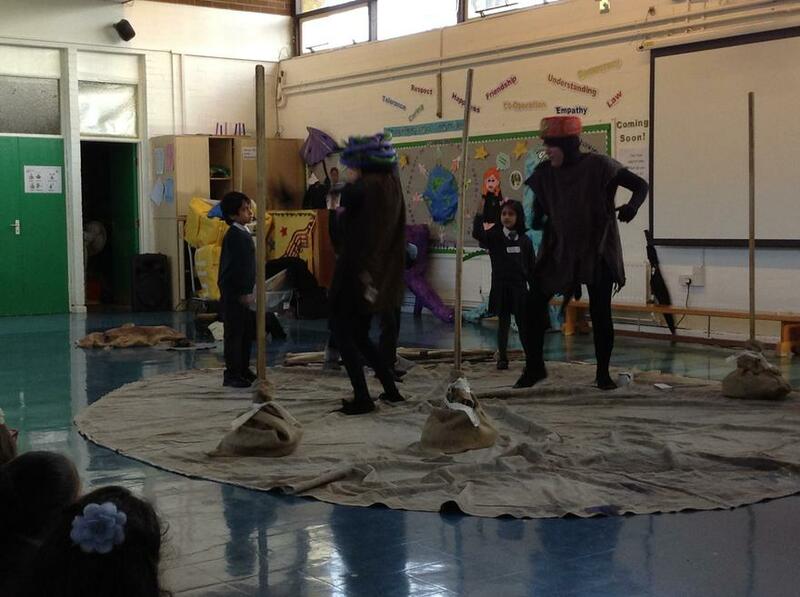 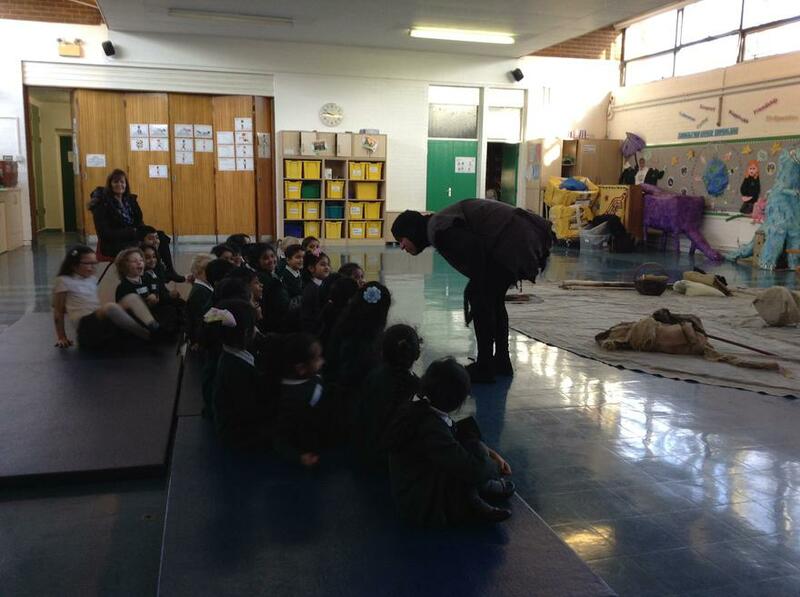 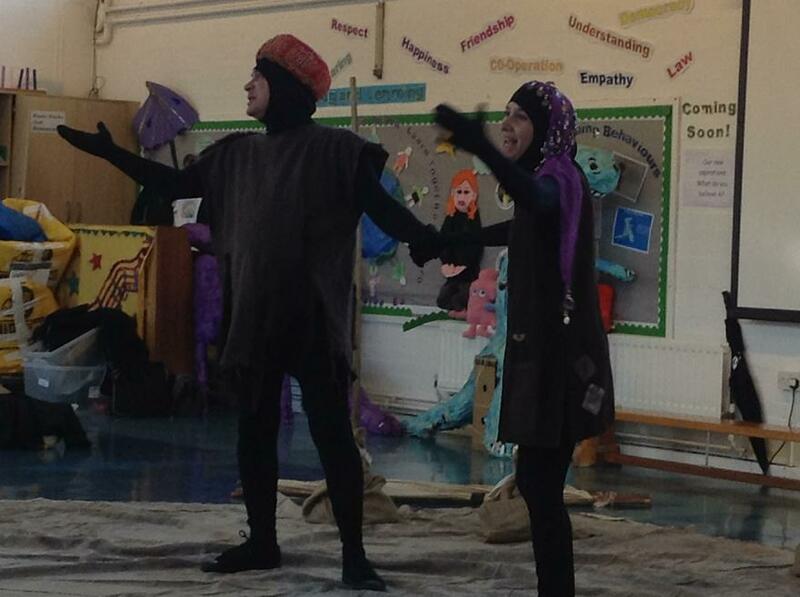 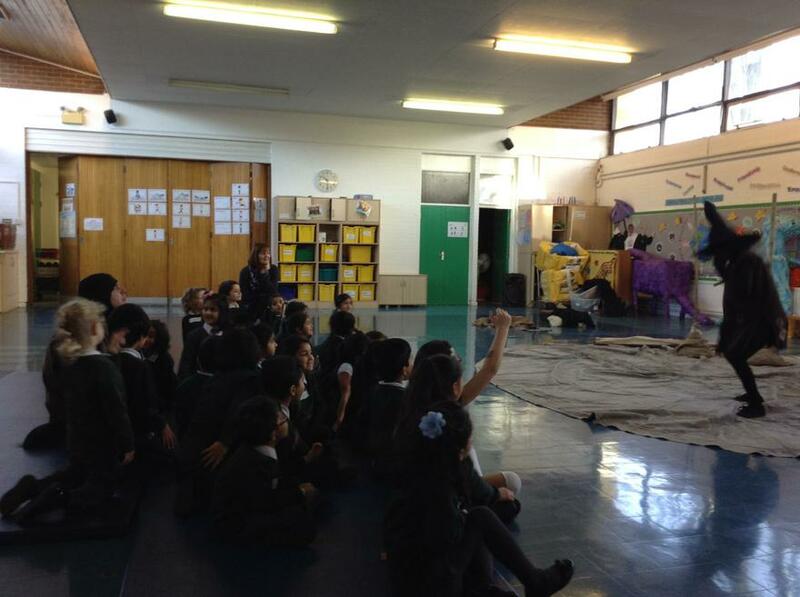 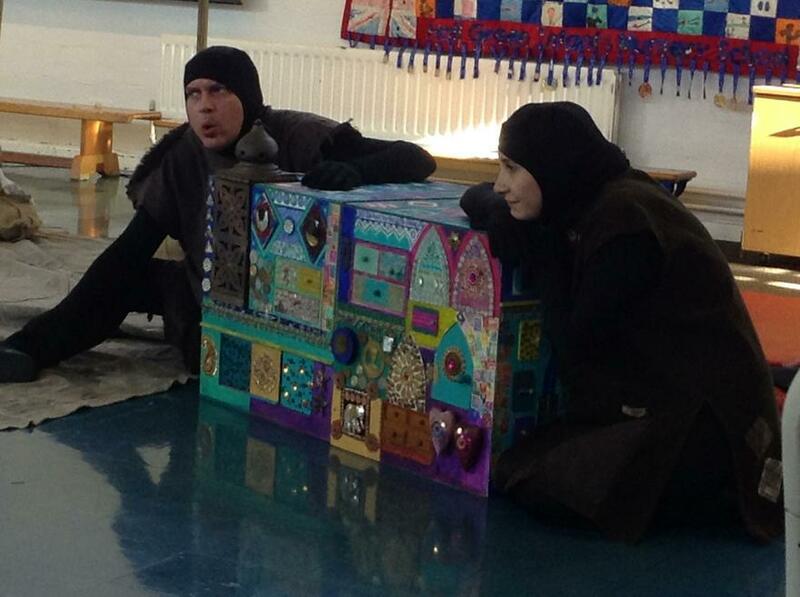 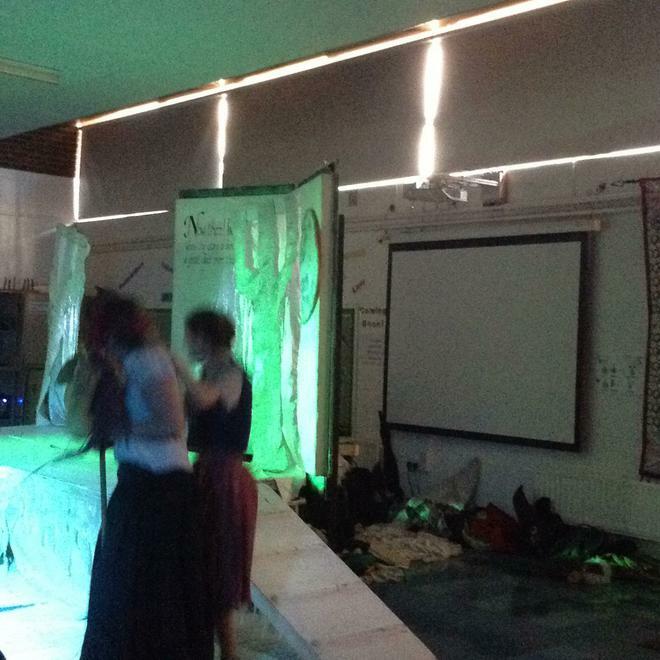 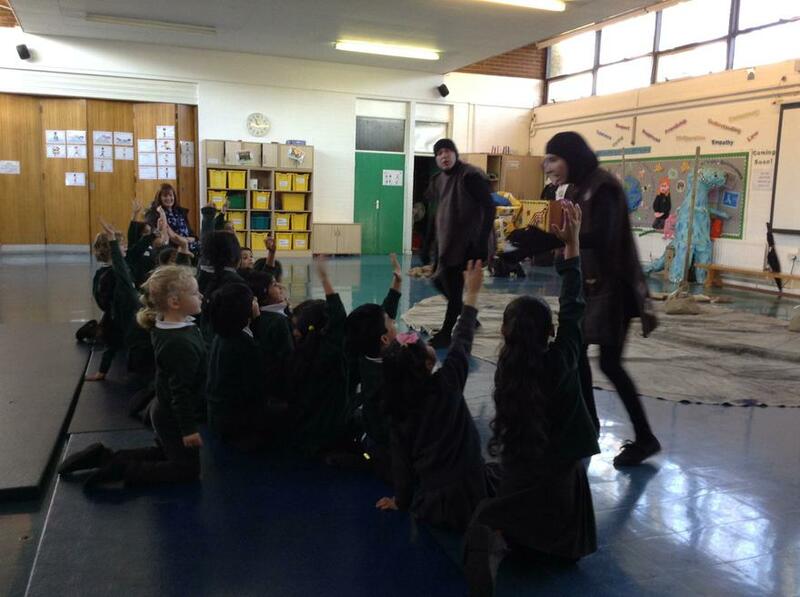 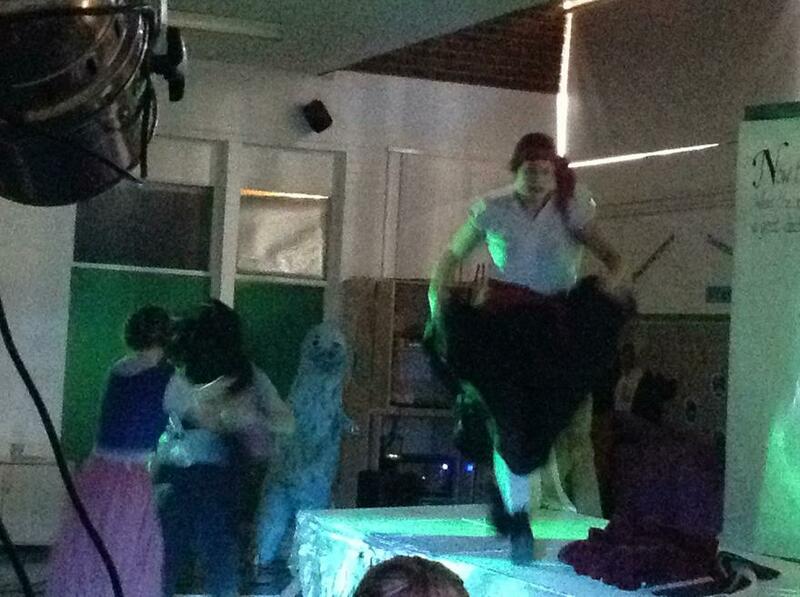 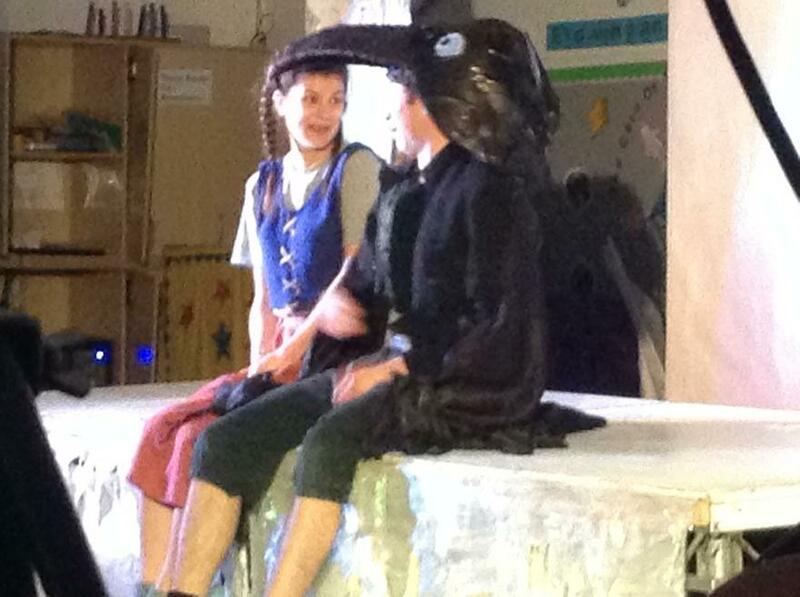 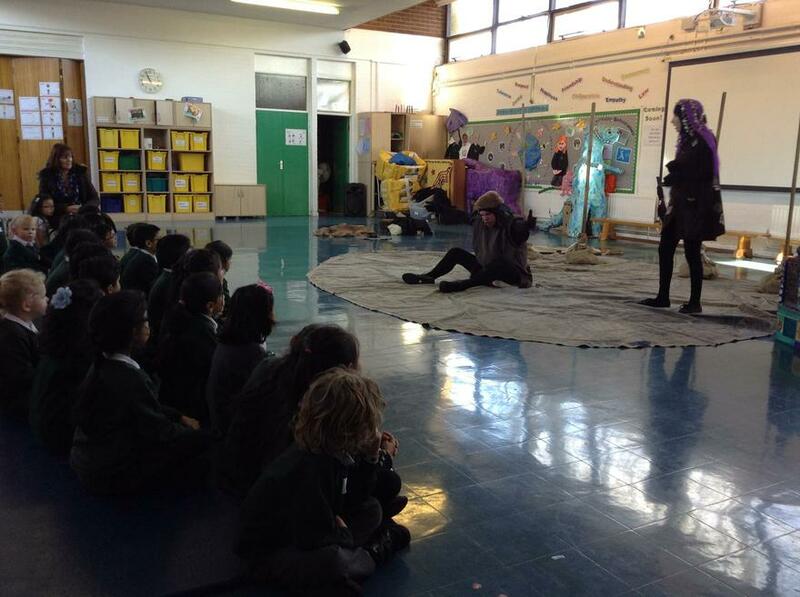 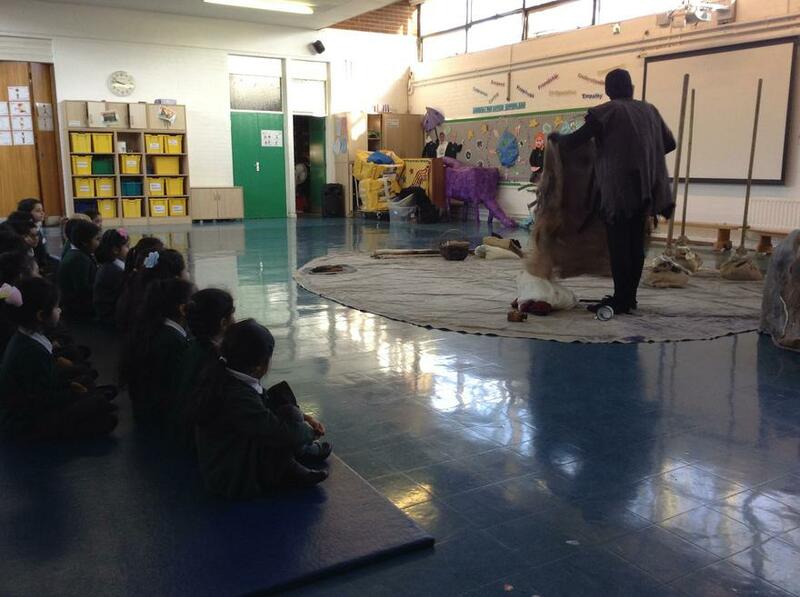 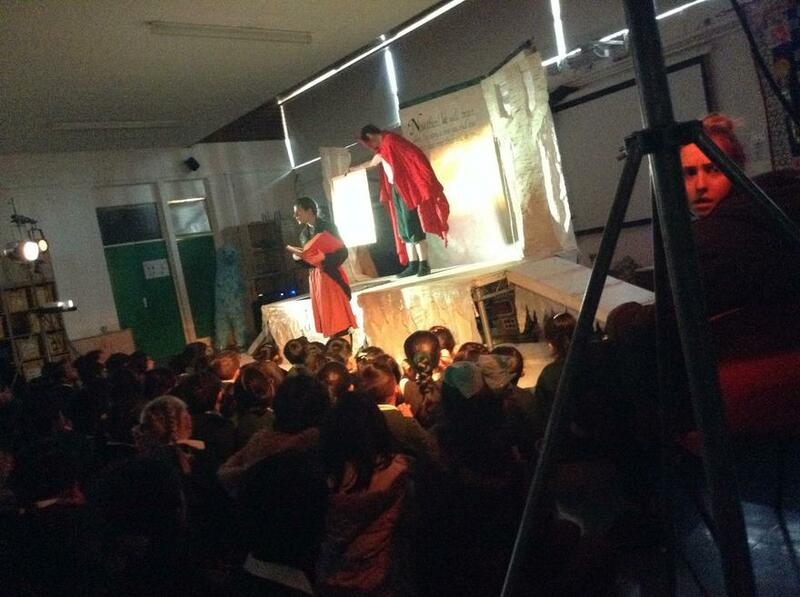 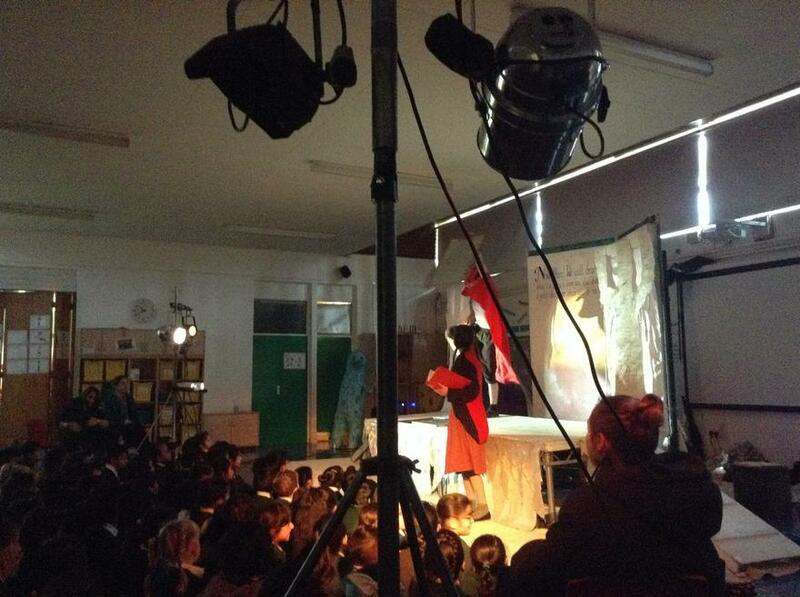 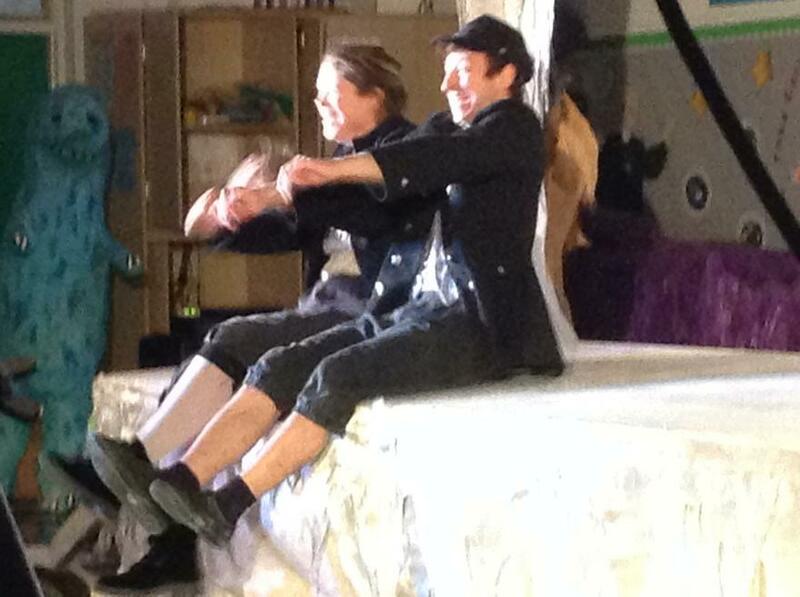 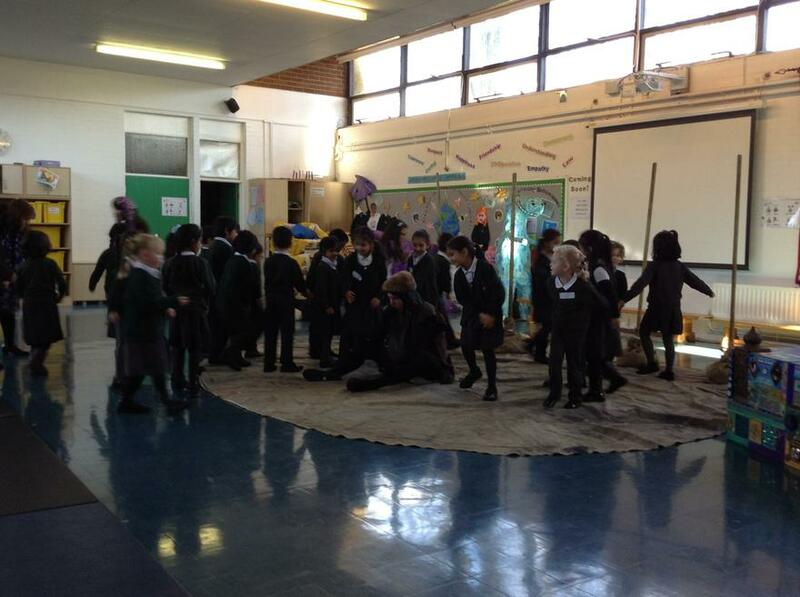 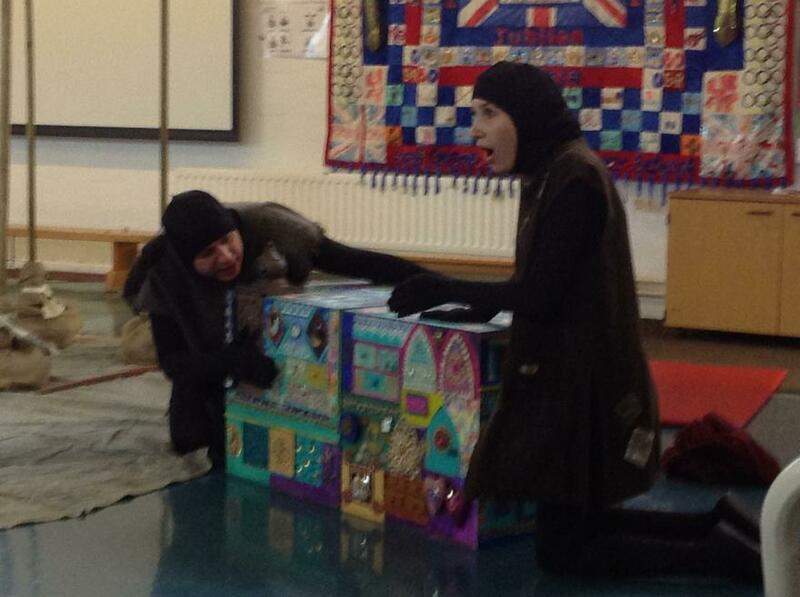 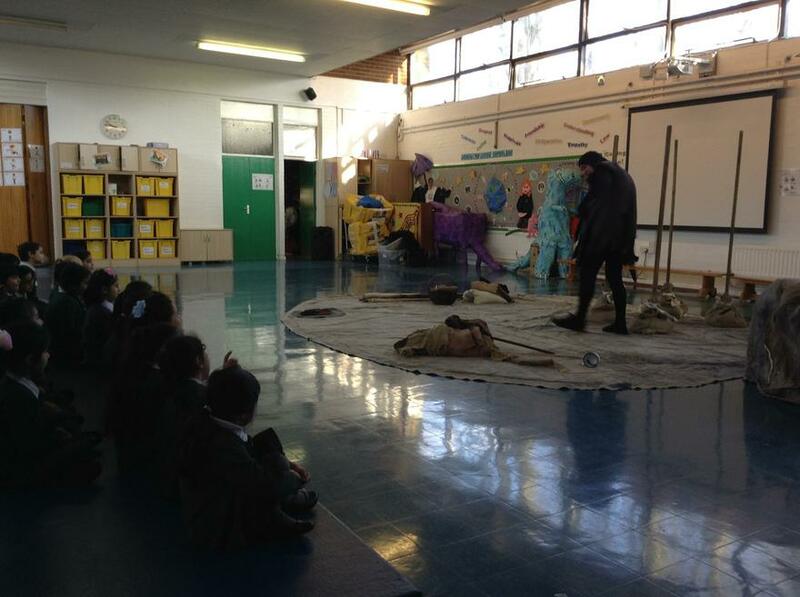 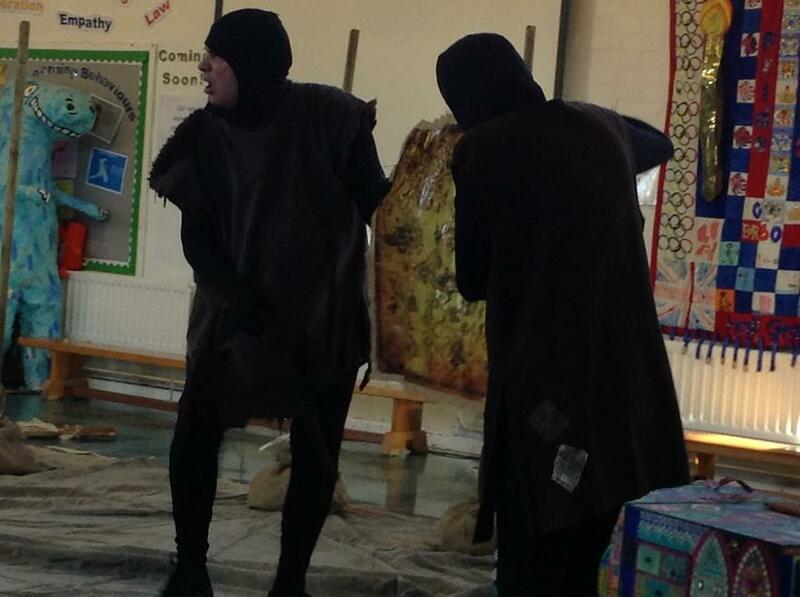 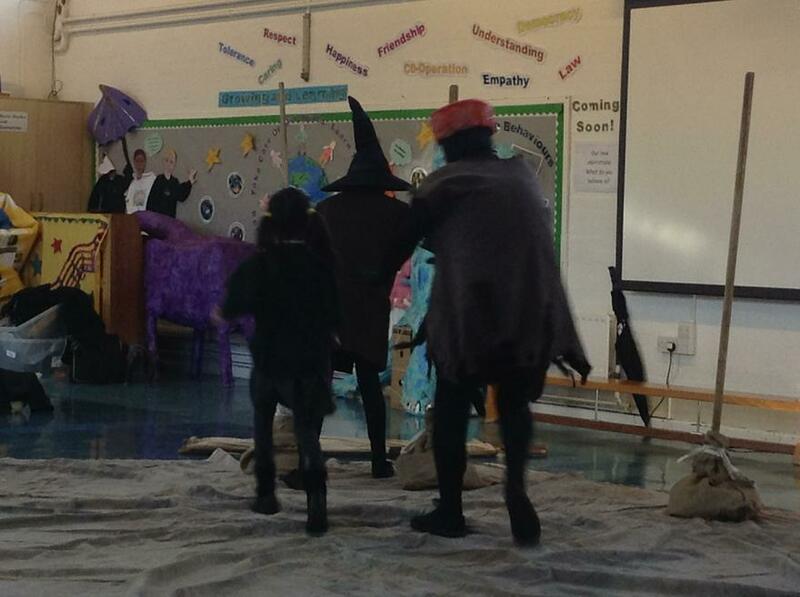 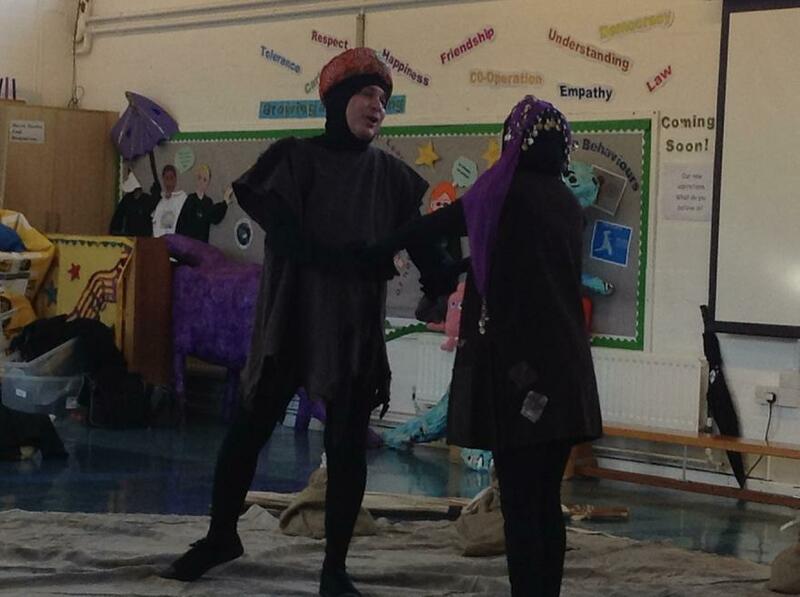 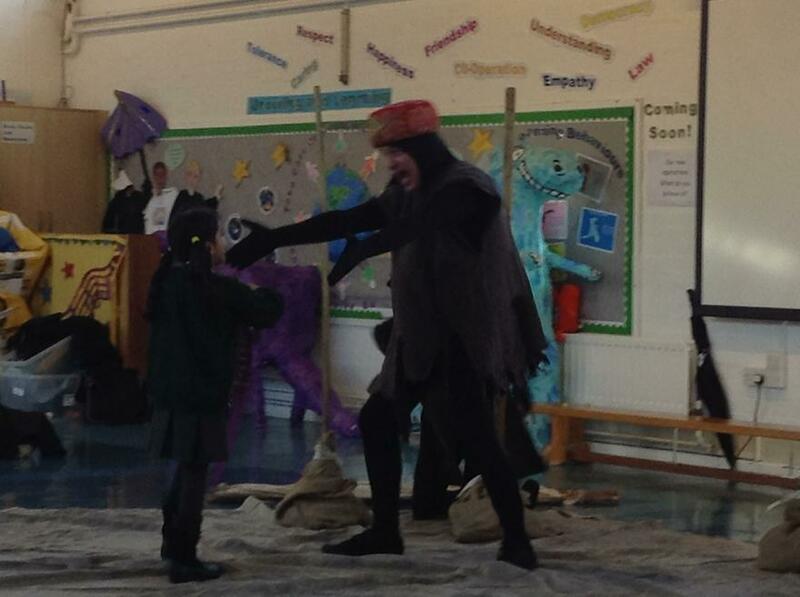 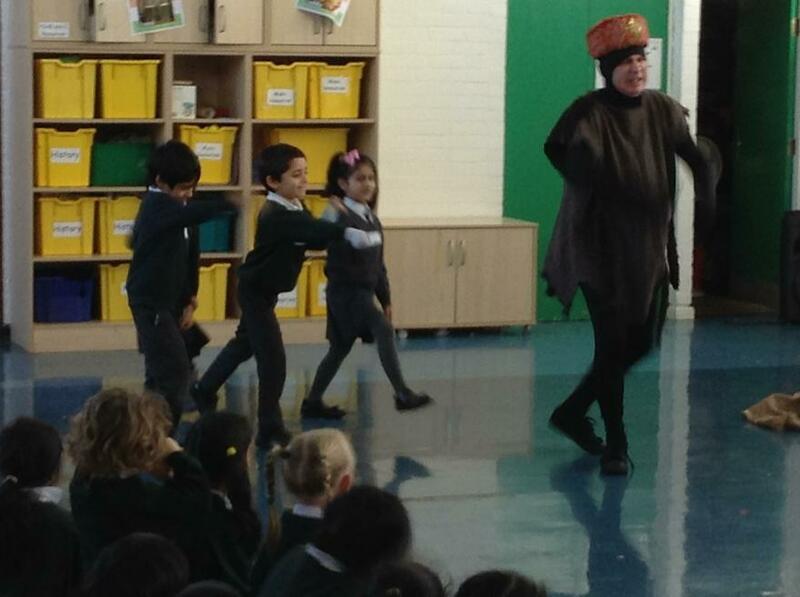 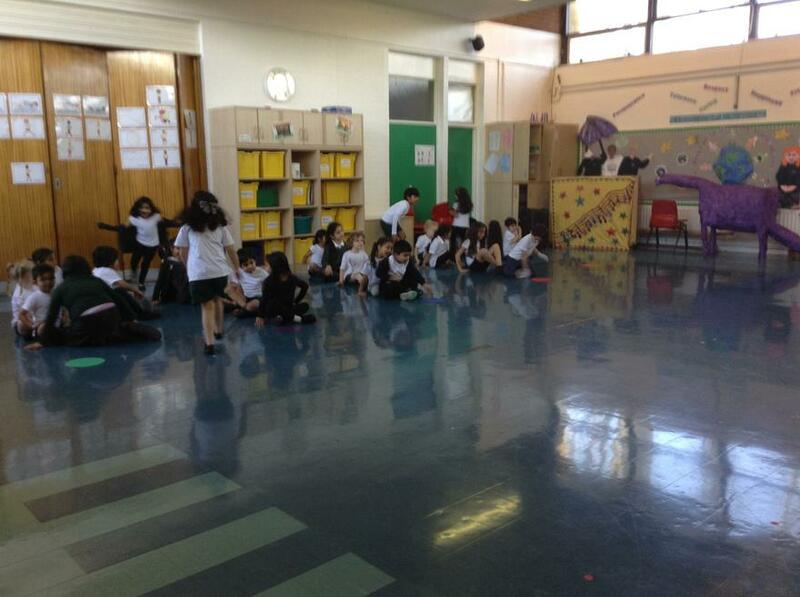 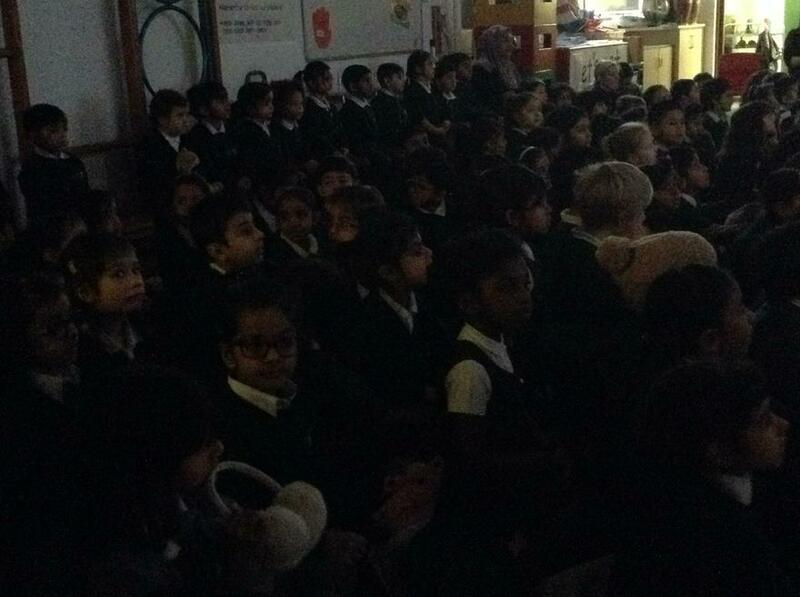 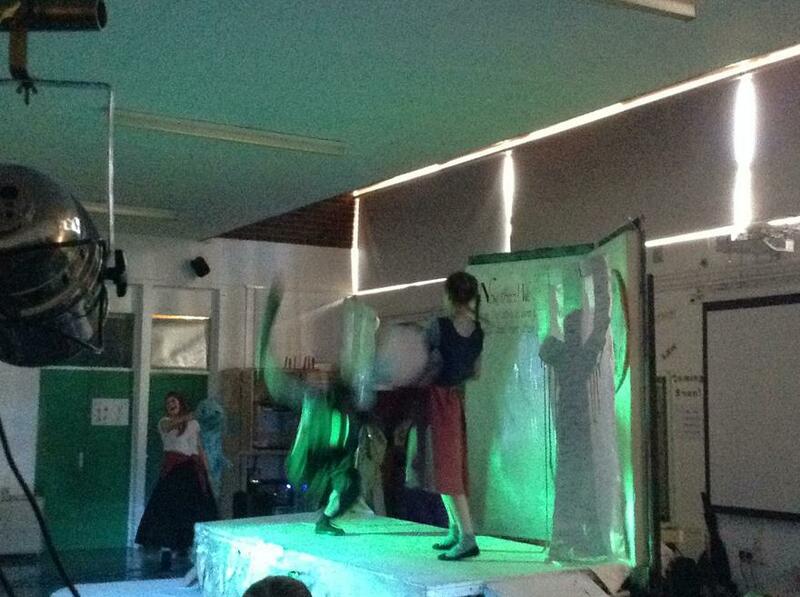 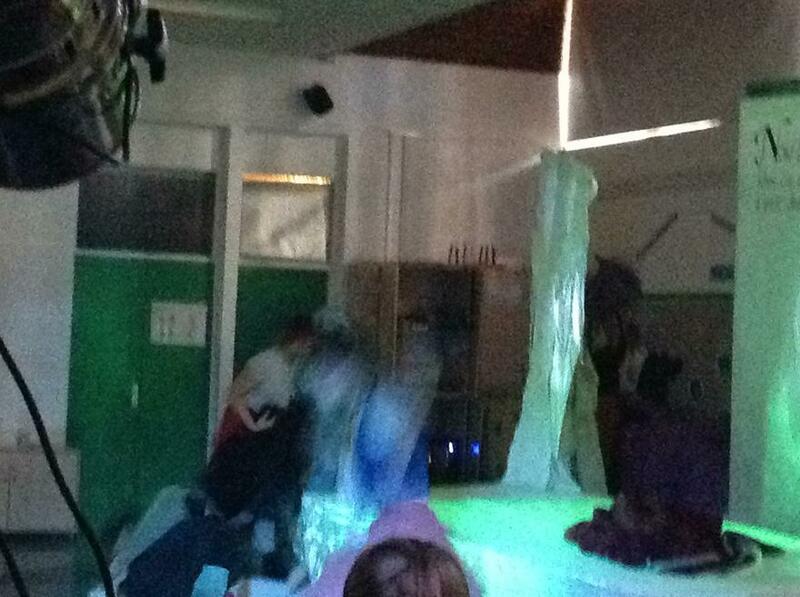 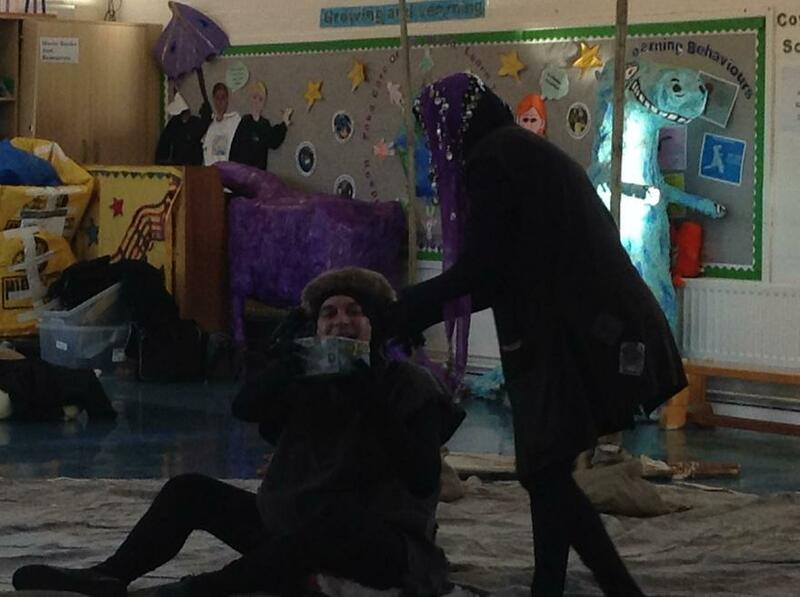 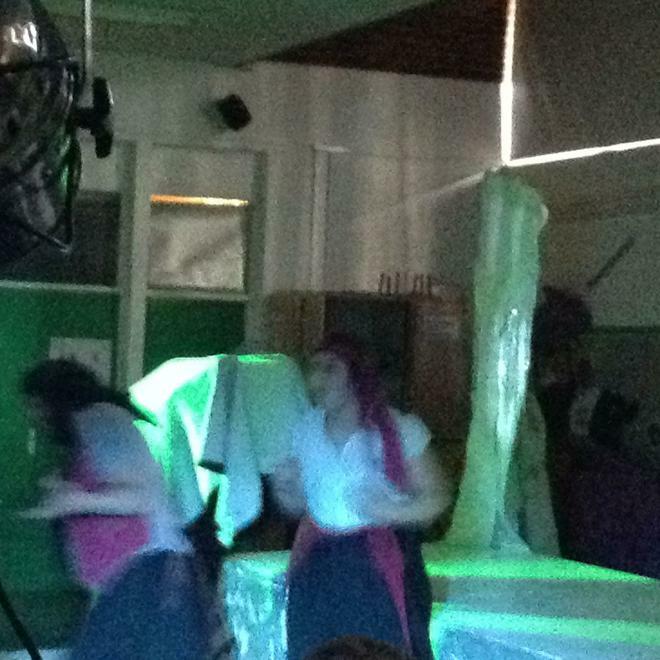 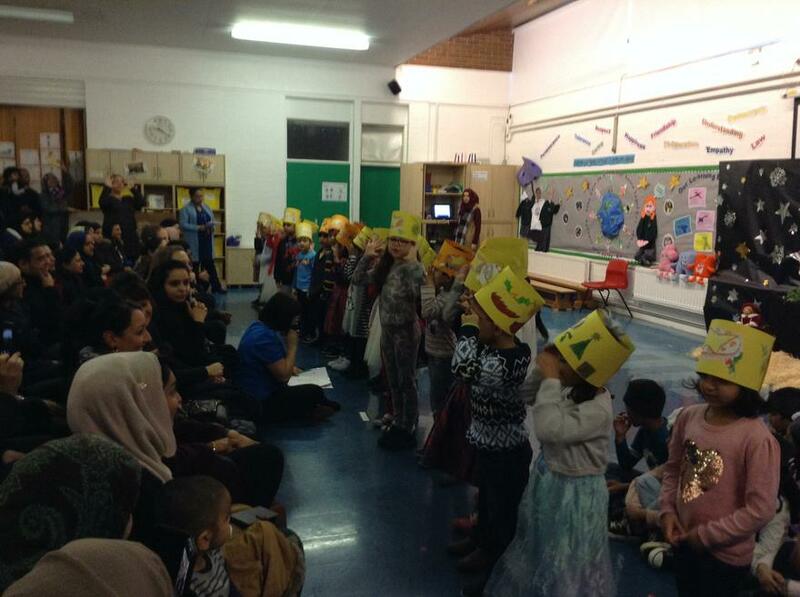 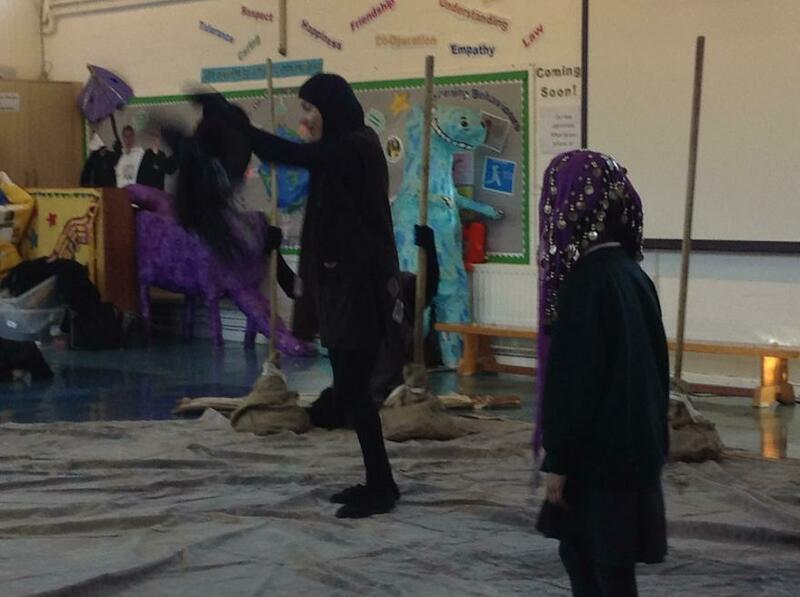 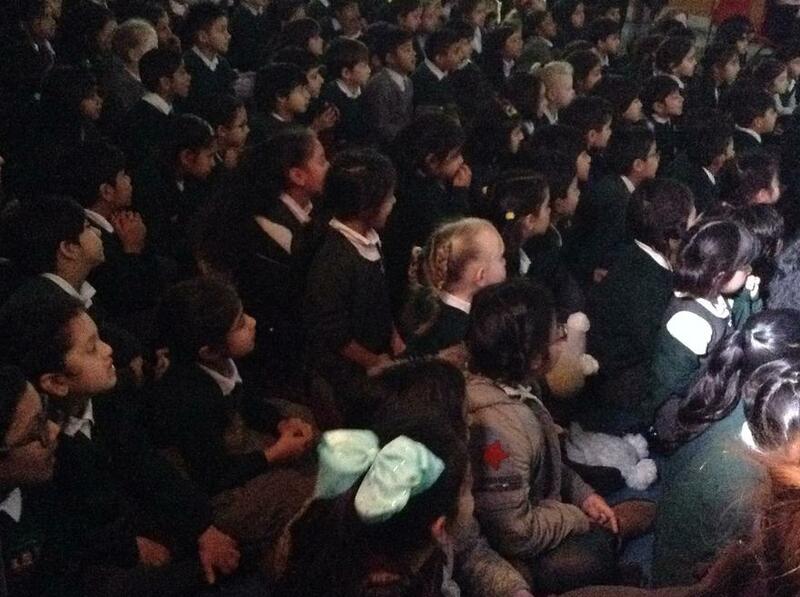 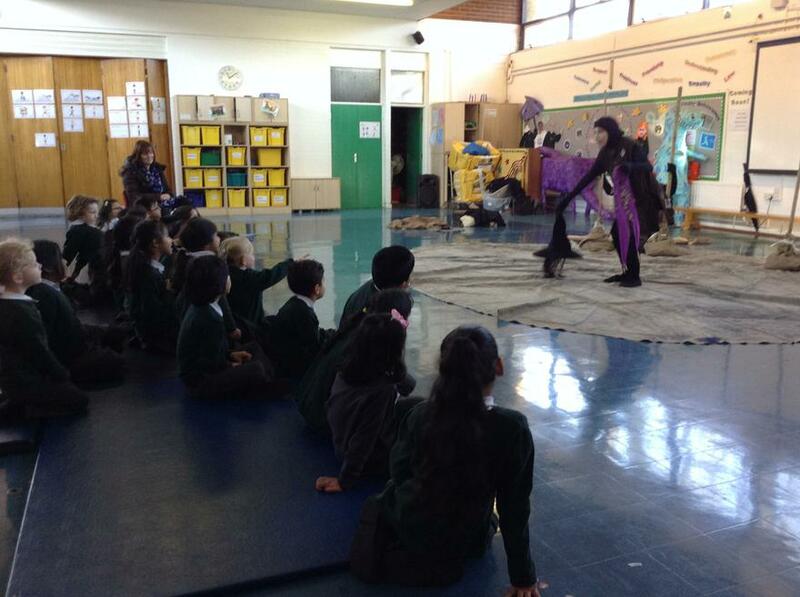 1MH had an amazing time with The Play House Theatre Company. 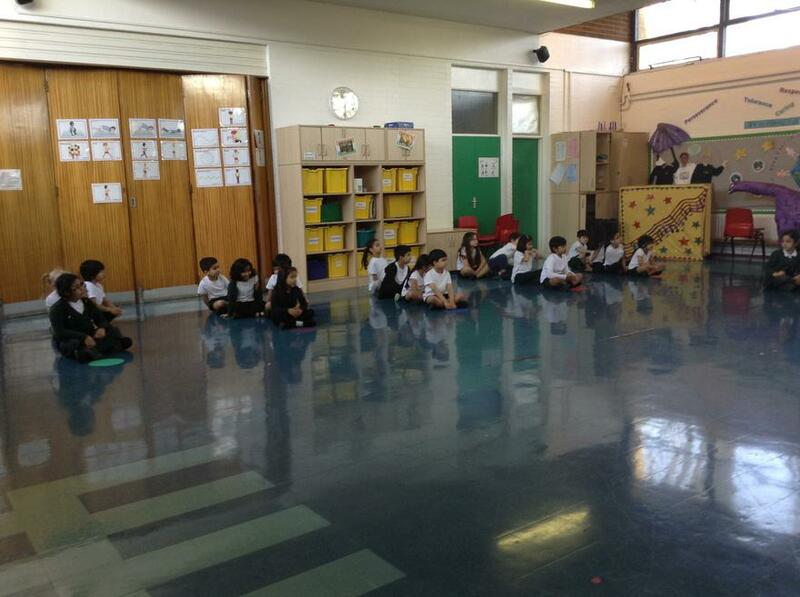 They performed a language and drama workshop for us and we were so excited we sat on the edge of the mat the whole time! 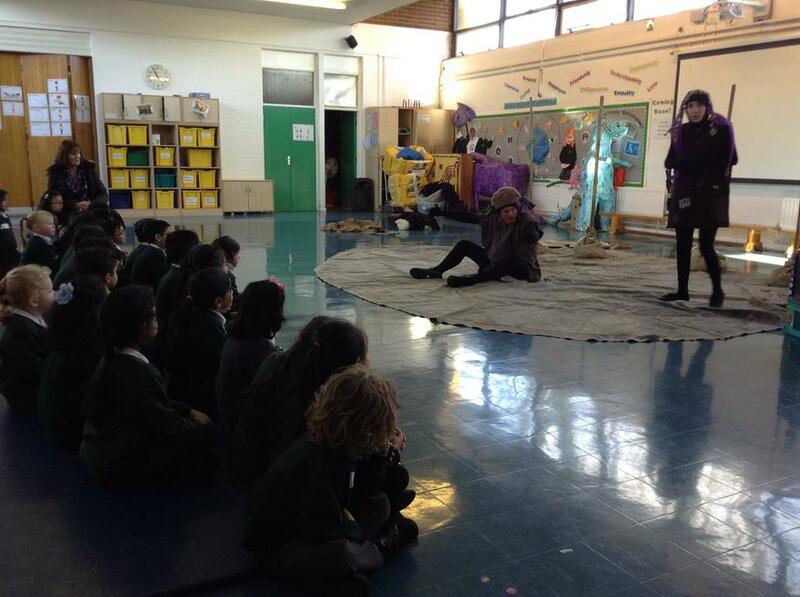 It began with the actors telling part of a story - but they never spoke a real word. 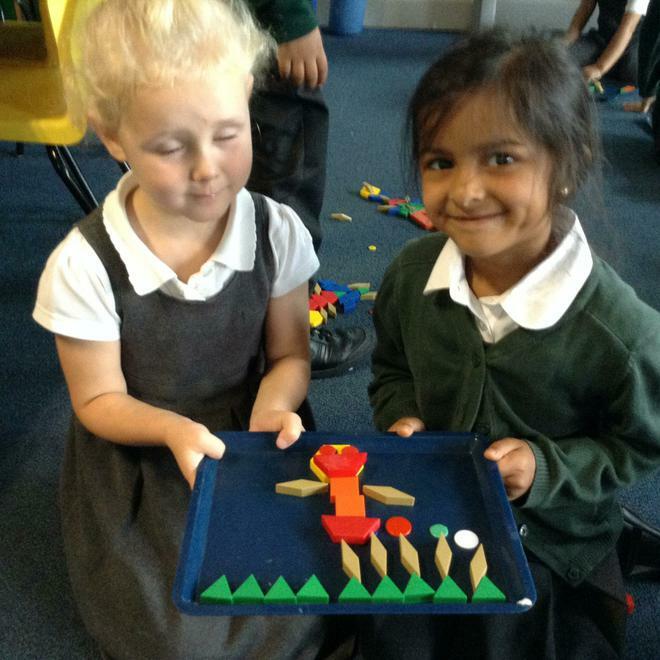 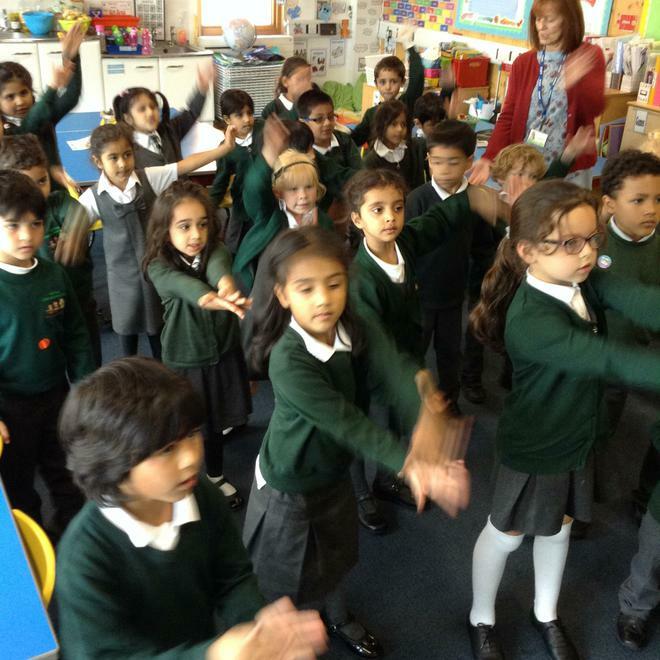 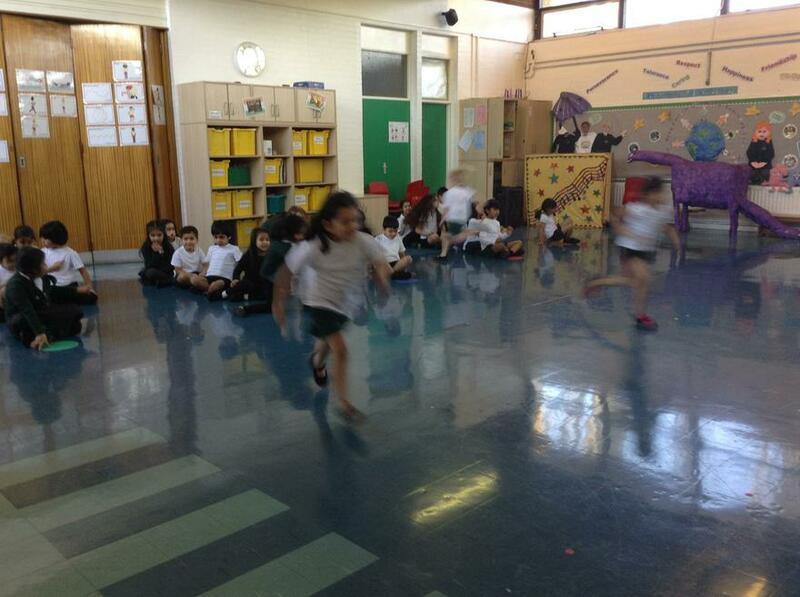 We had to work out what was happening by their faces, actions and noises. 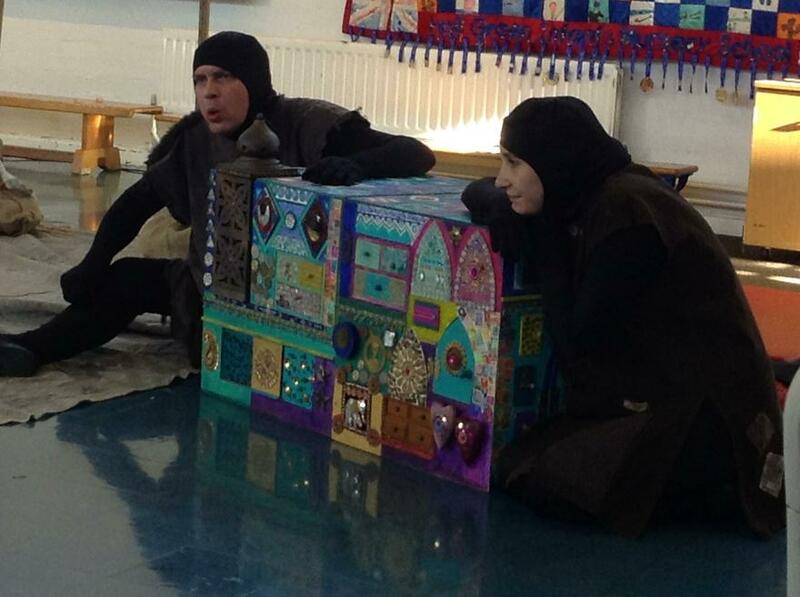 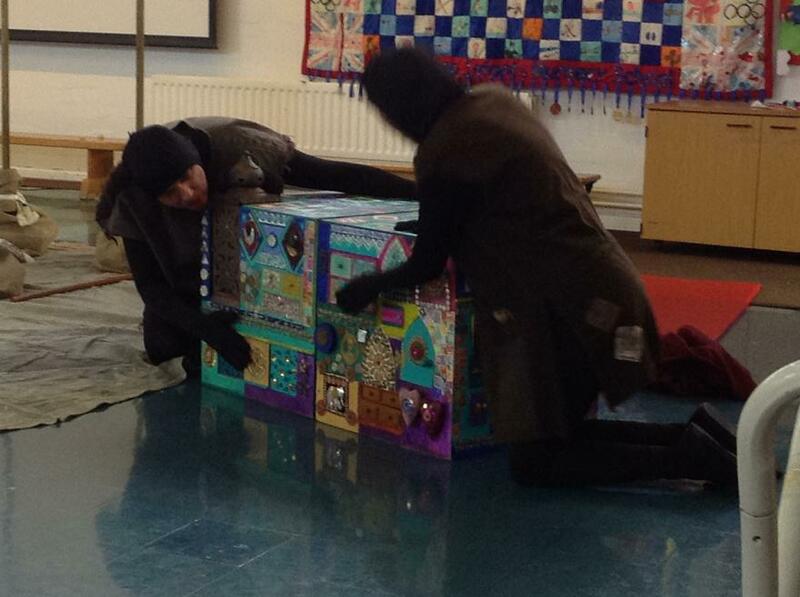 Suddenly a magic story box arrived and we learnt a new story about a Prince, a Princess, a Witch and an Ogre. 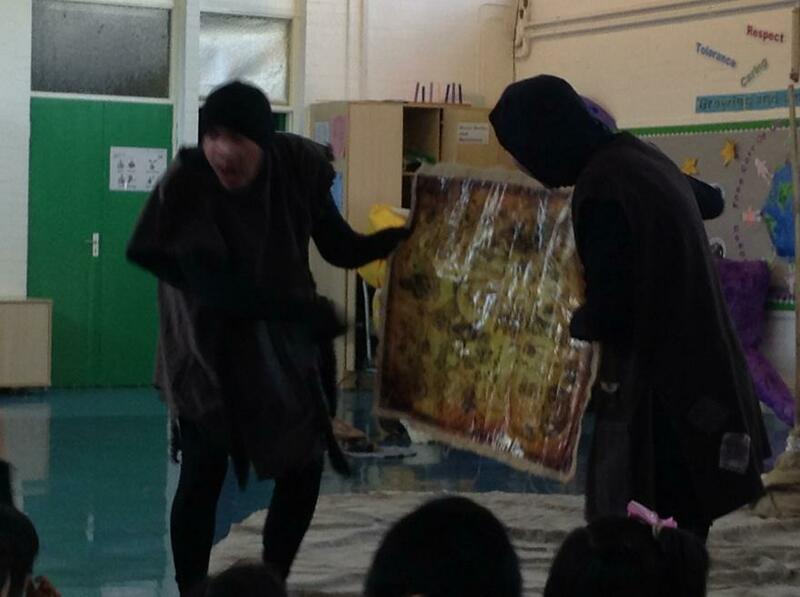 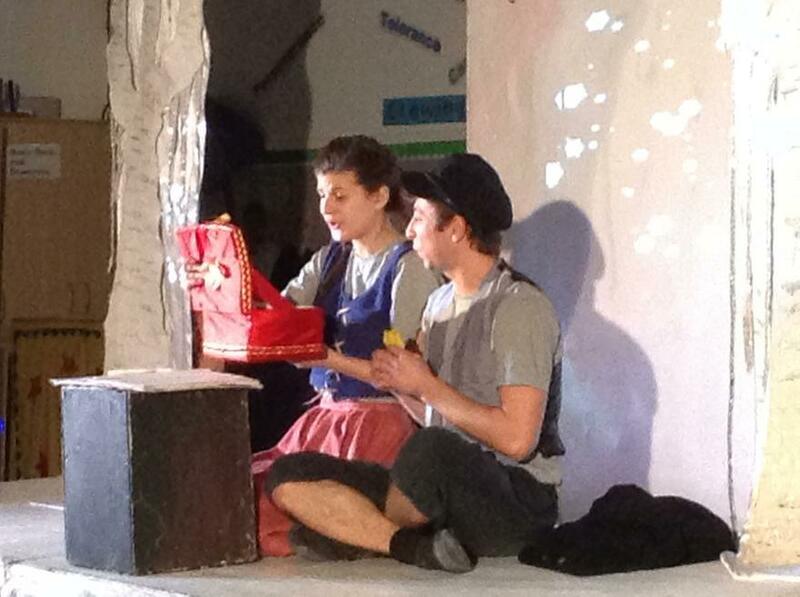 It was strange at first because the magic story box told us the story in different languages. 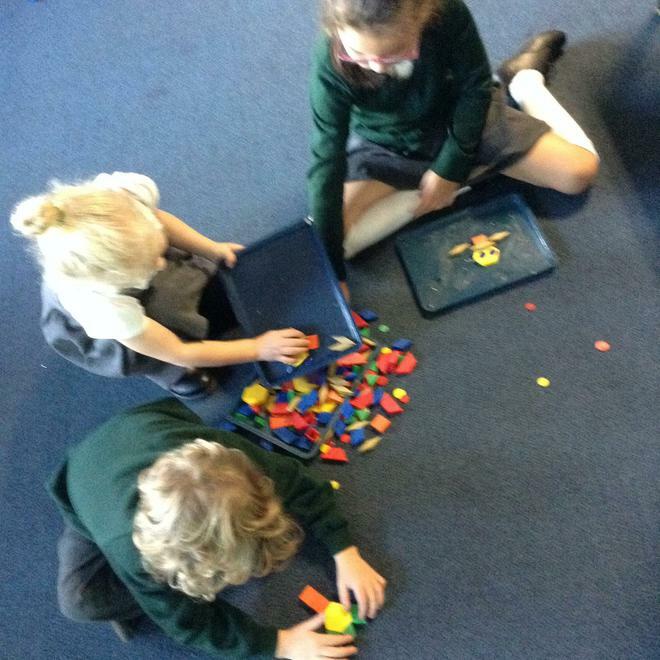  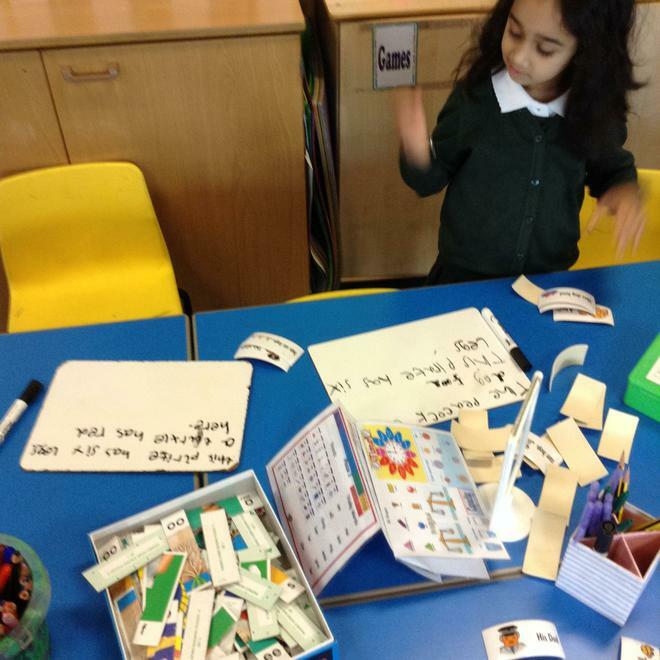 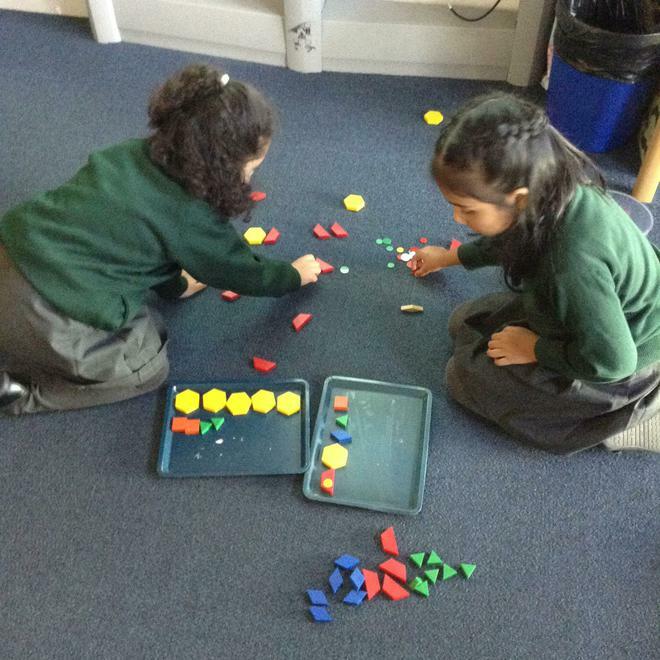 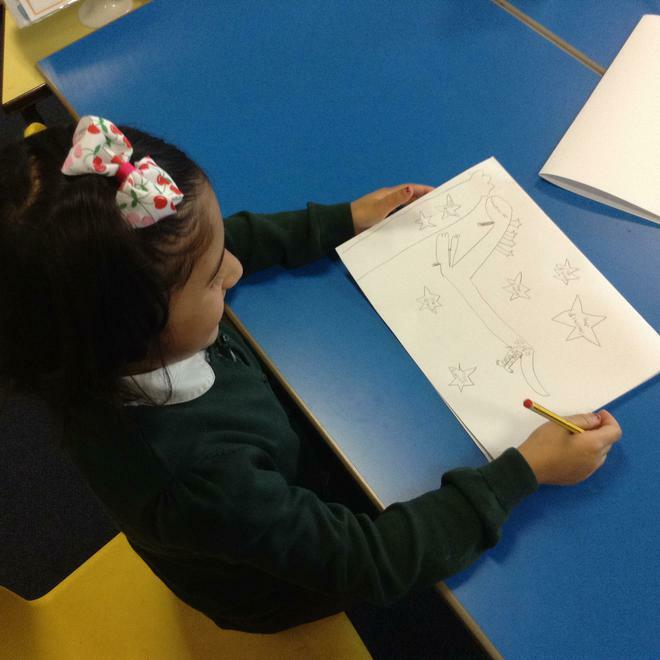 We listened carefully and tried to work out what was going to happen next. 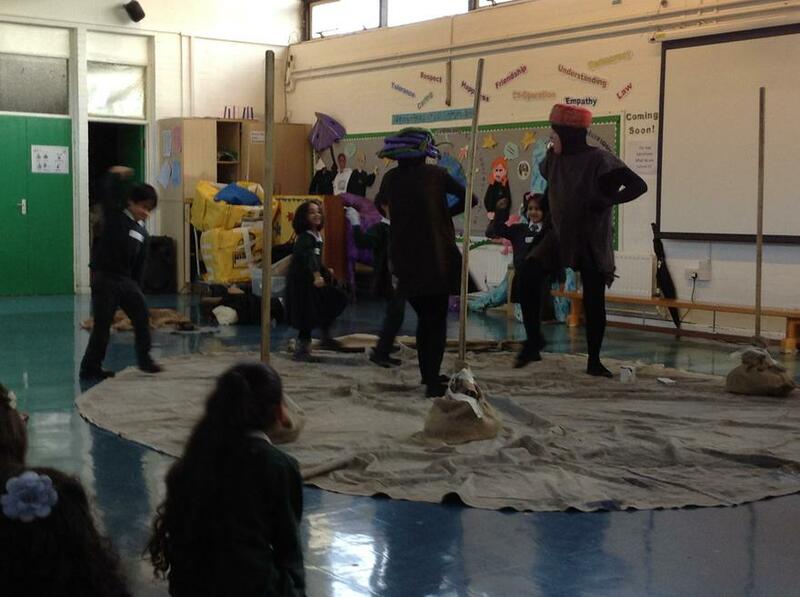 As the story developed, we got to be part of the story and were thrilled to row the Prince's ship and clean the Ogre's Cave! 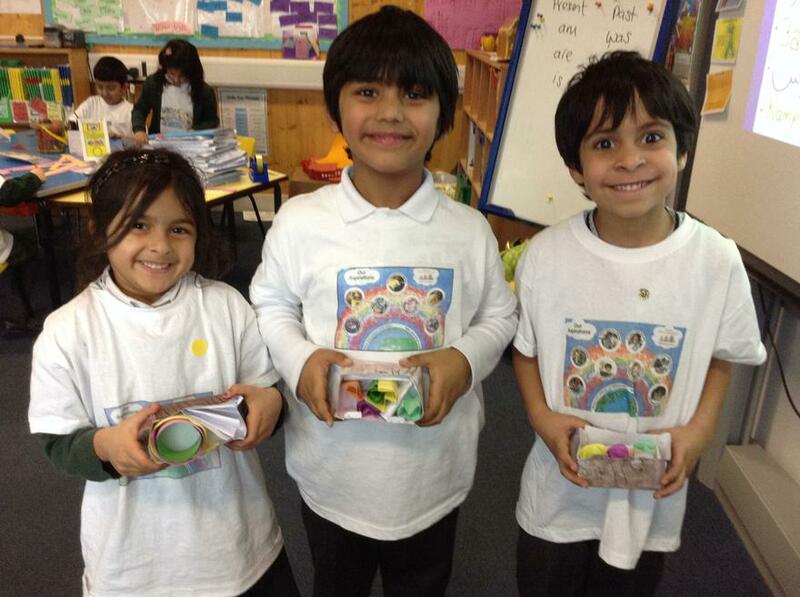 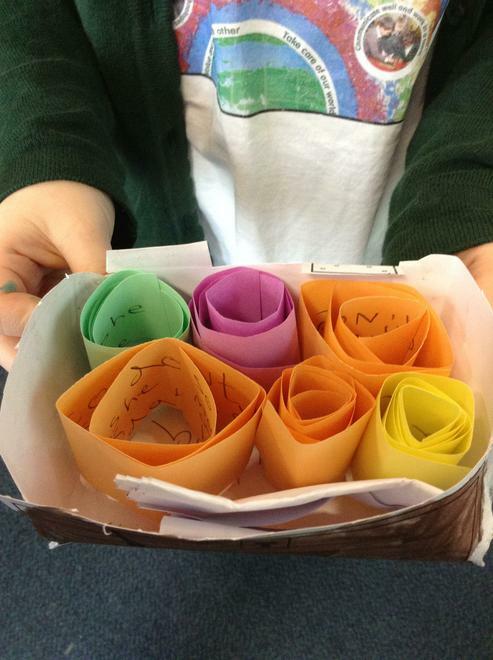 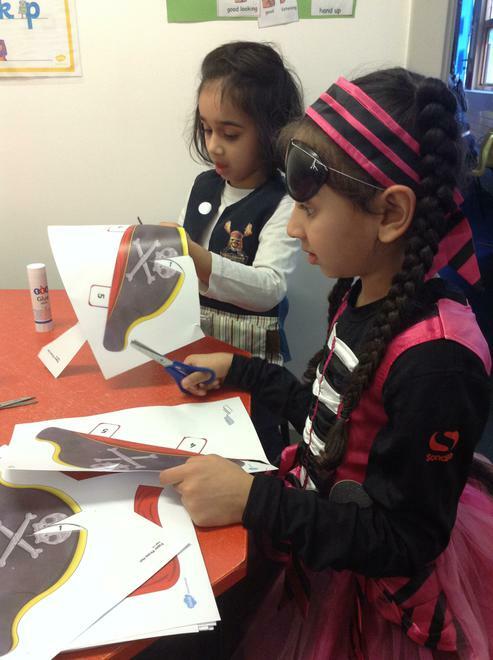 The next day was Aspirations Day so we wanted to make our own story boxes. 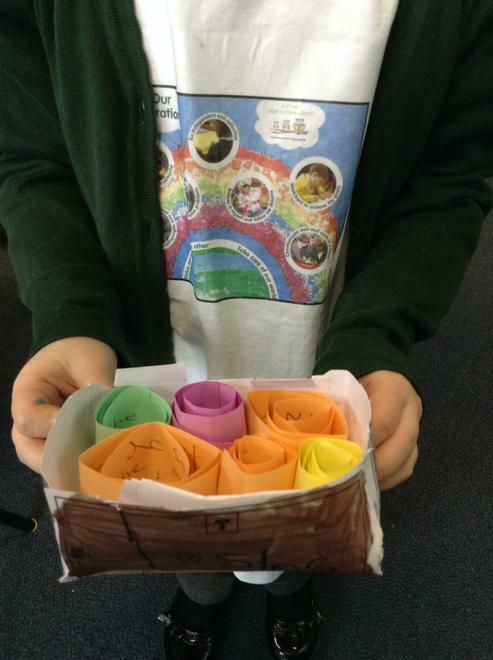 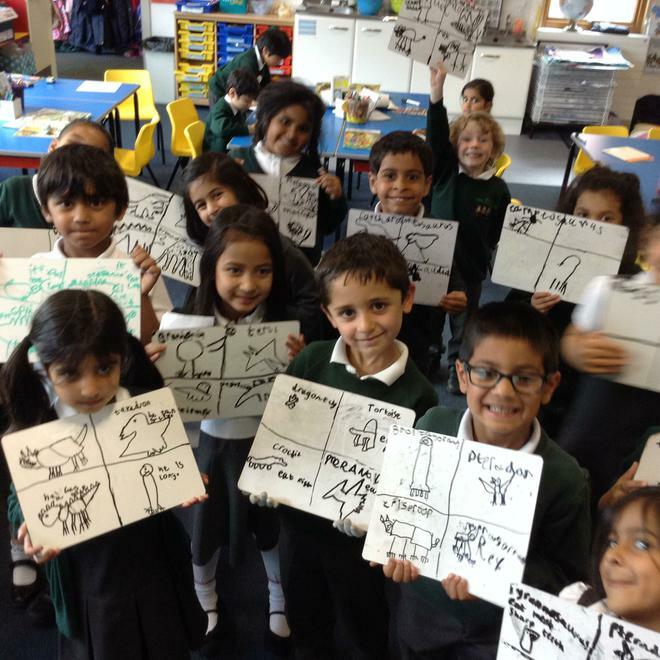 We used the aspirations 'be independent learners' and 'be a creative thinker' to create our own boxes and fill them full of story magic. 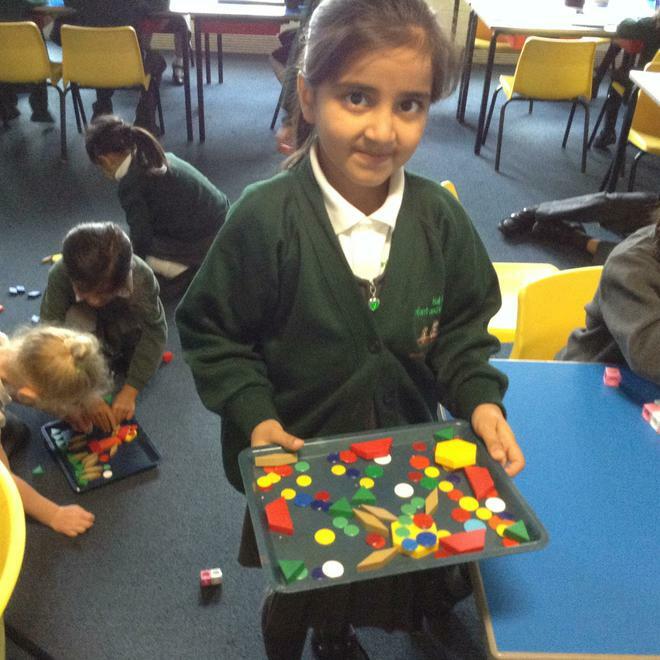 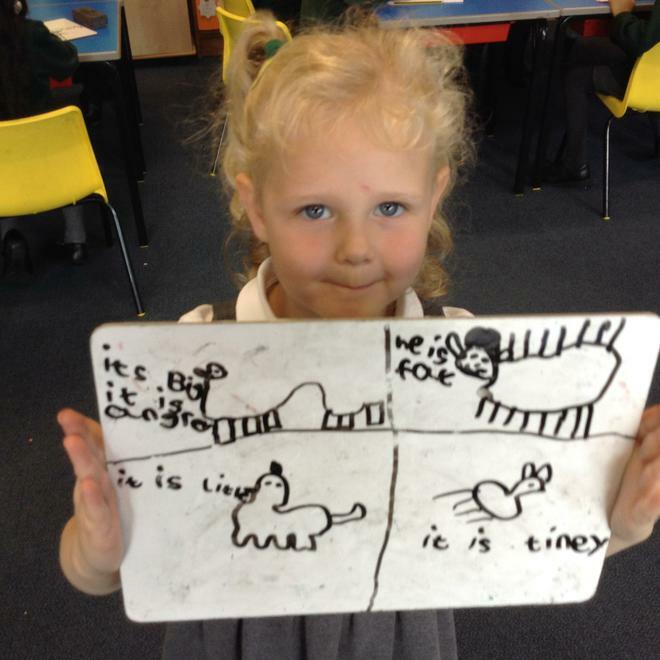 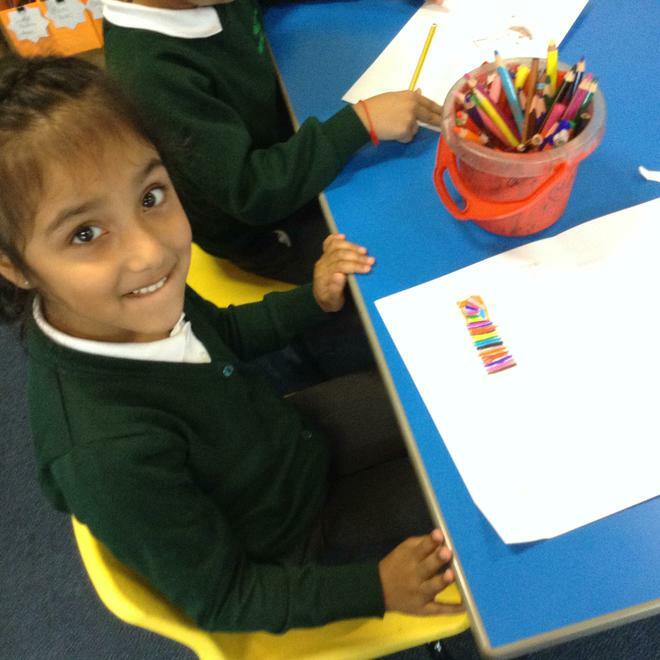 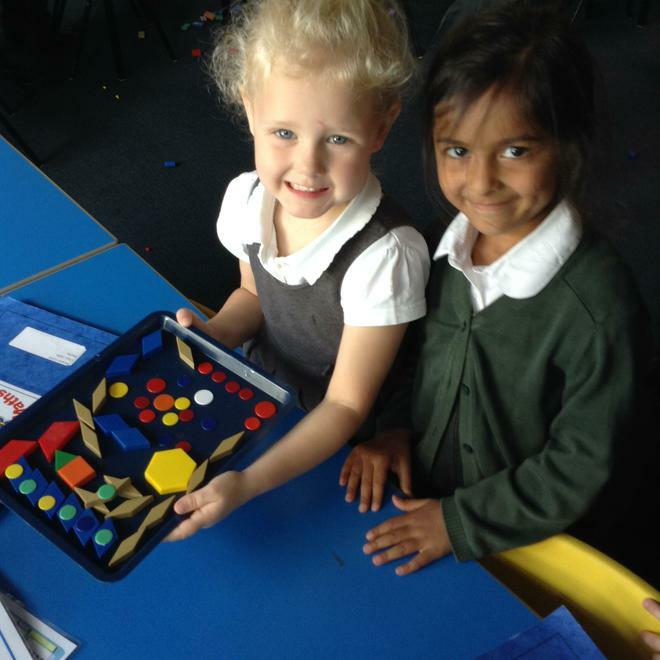 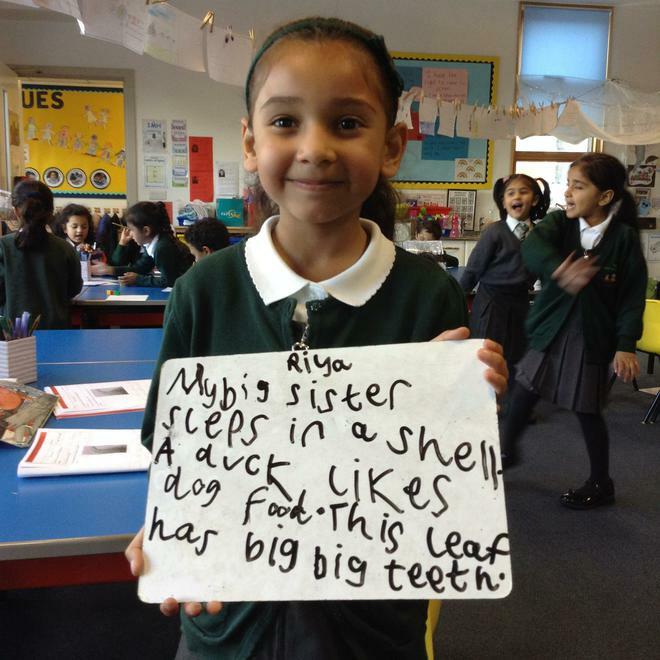 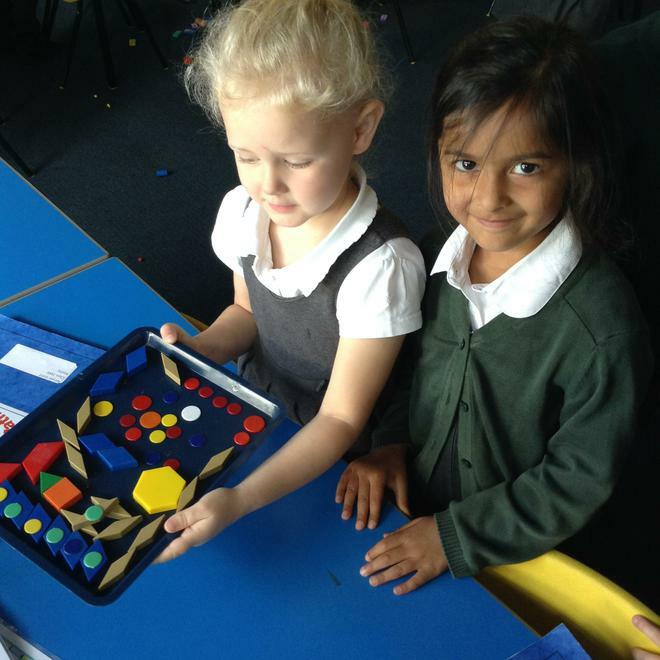 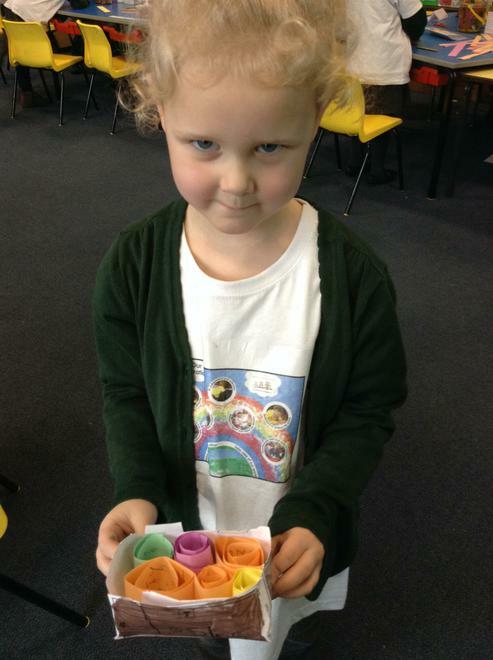 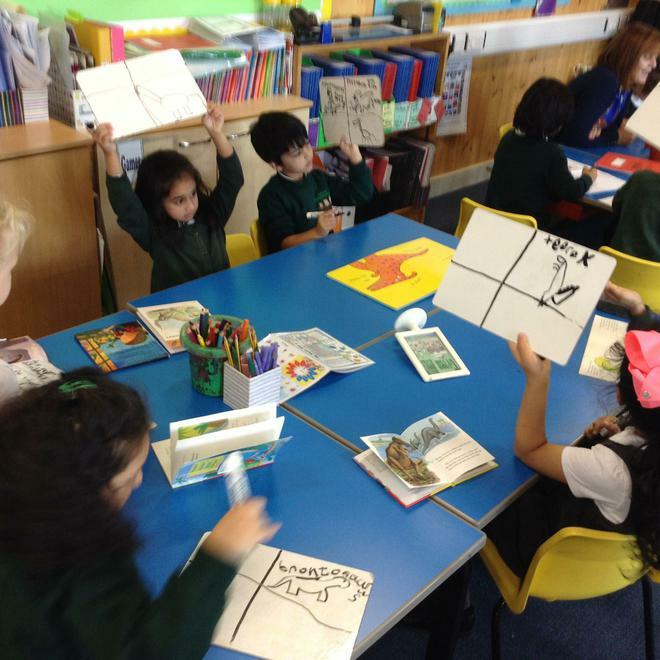 We talked about how to do this and 'always do our best' to make them the best story boxes. 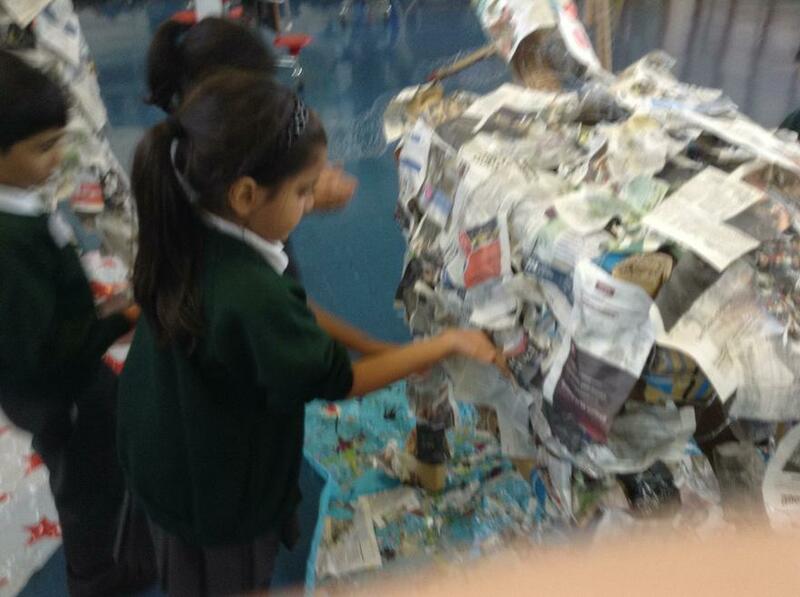 We cannot wait to bring them home(when they are dry)and tell you our own stories! 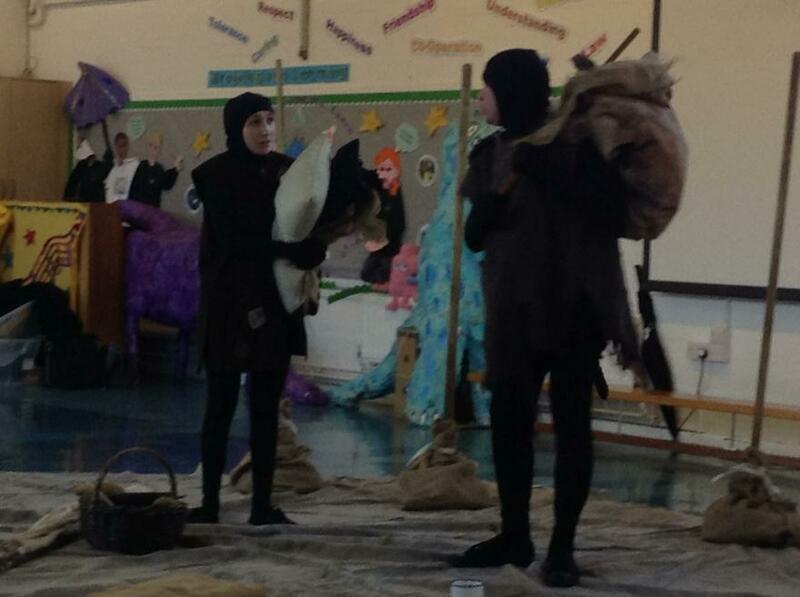 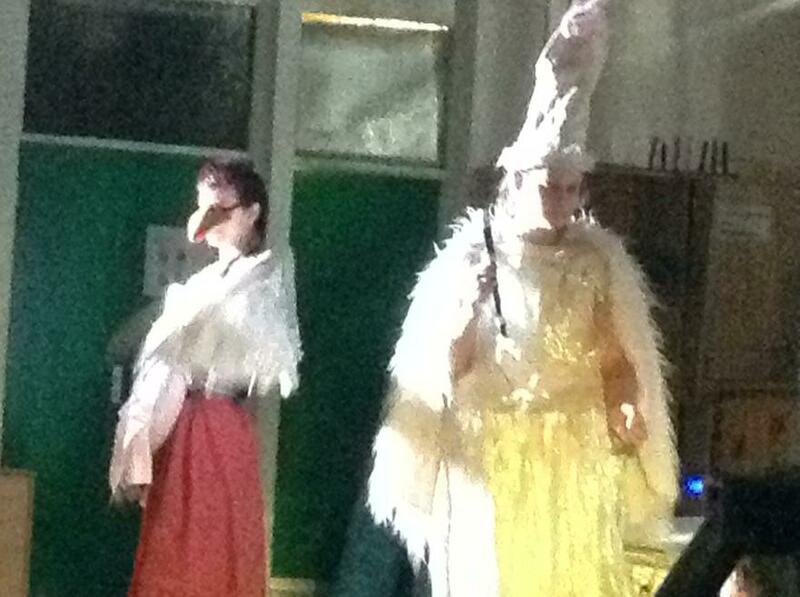 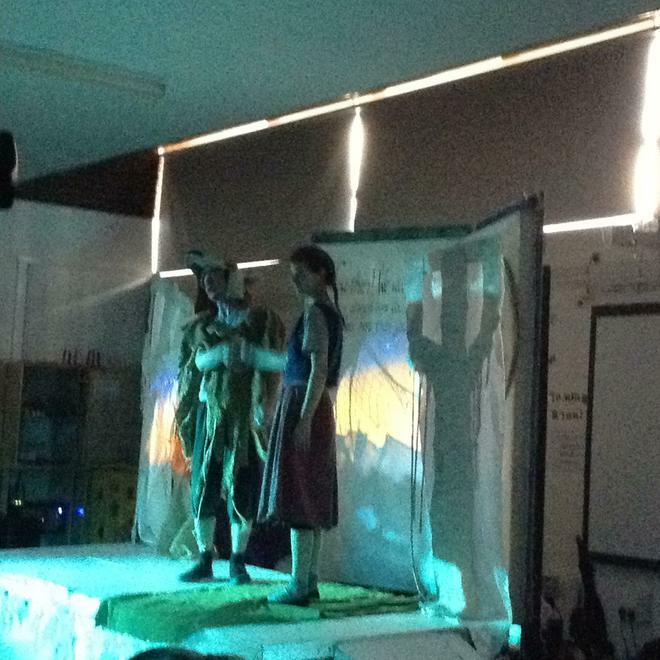 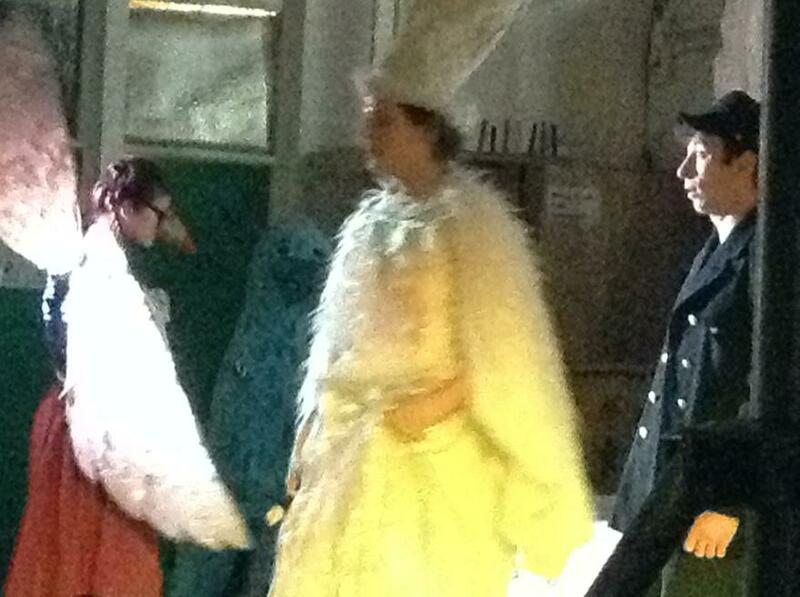 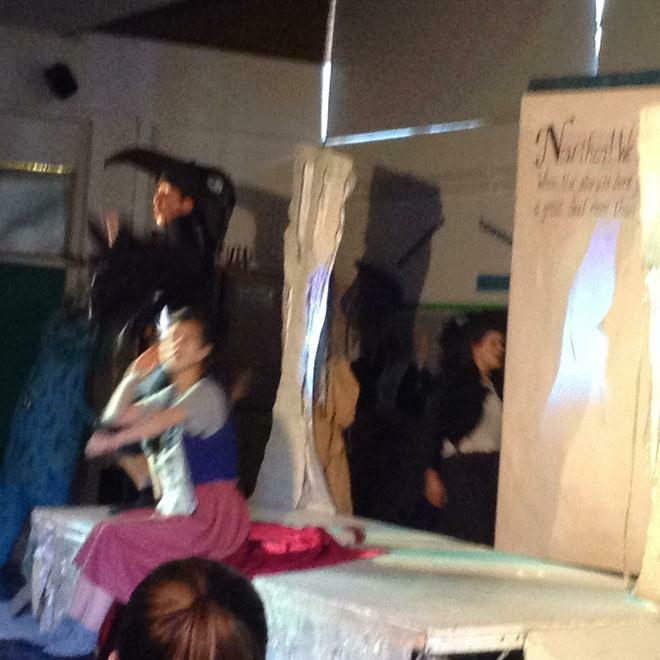 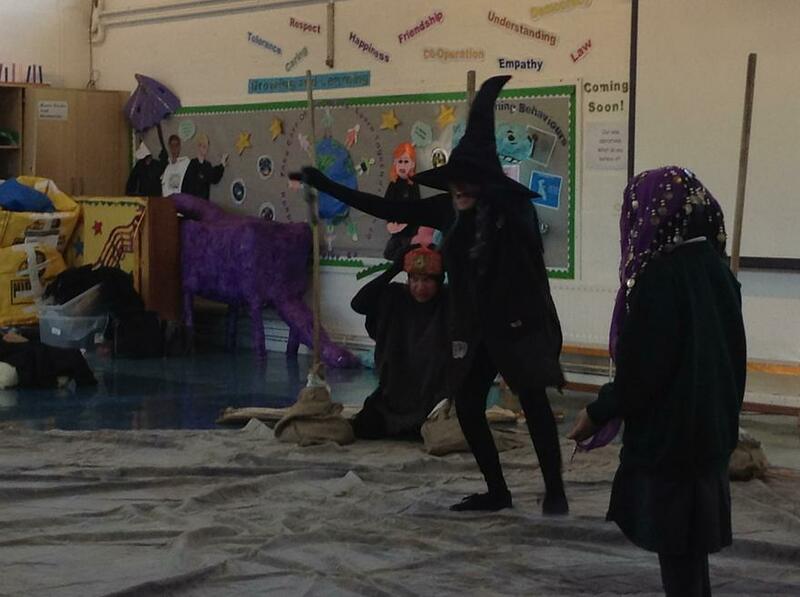 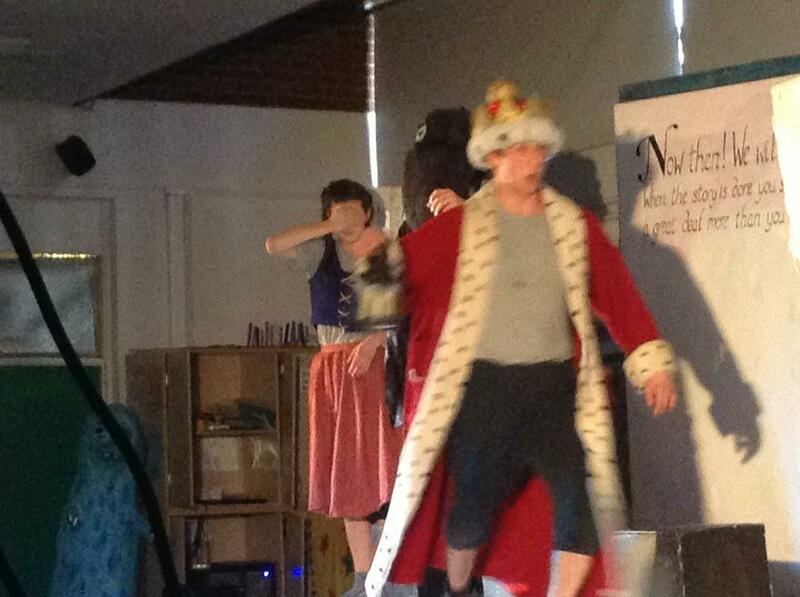 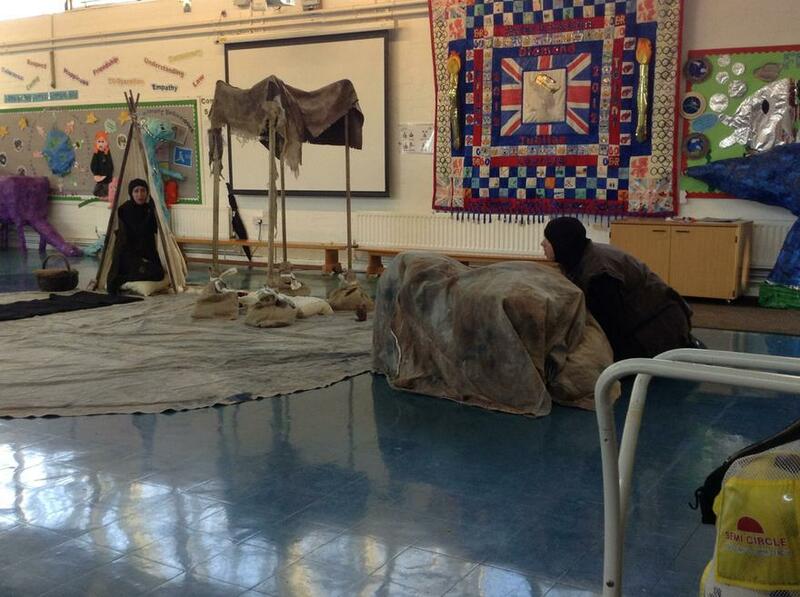 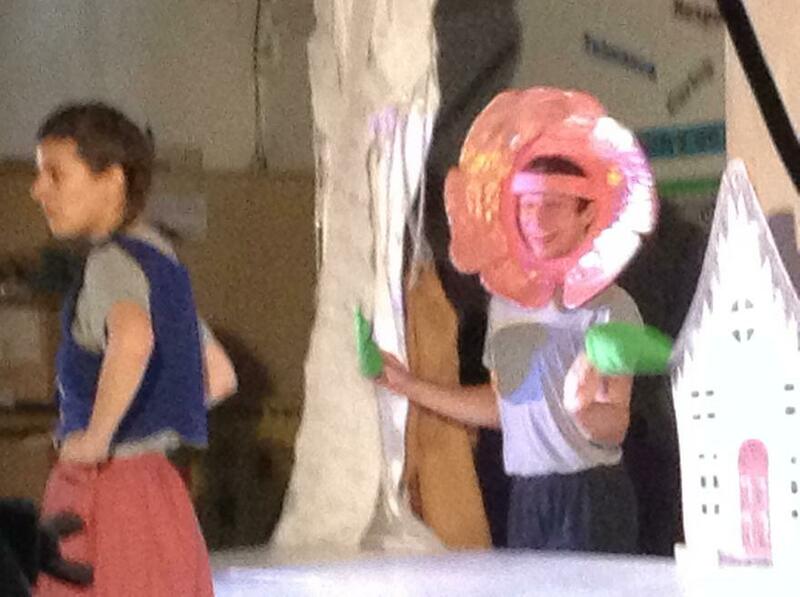 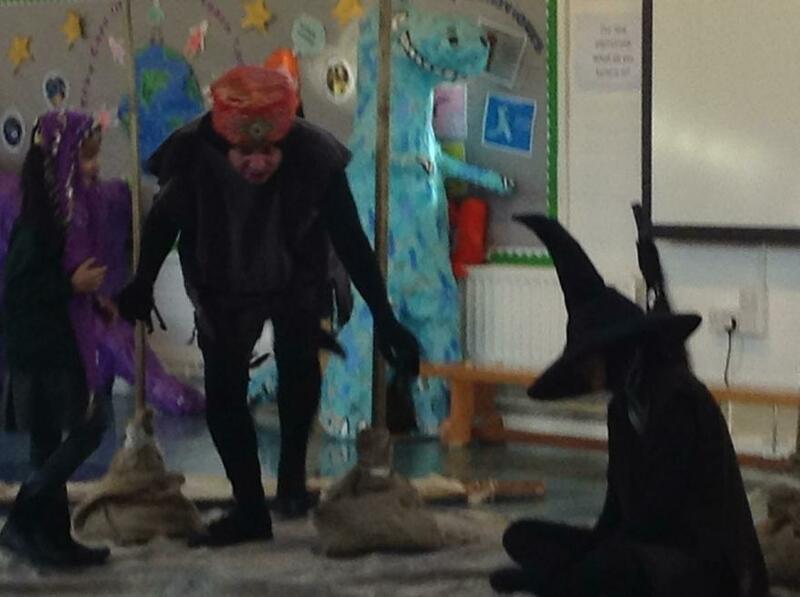 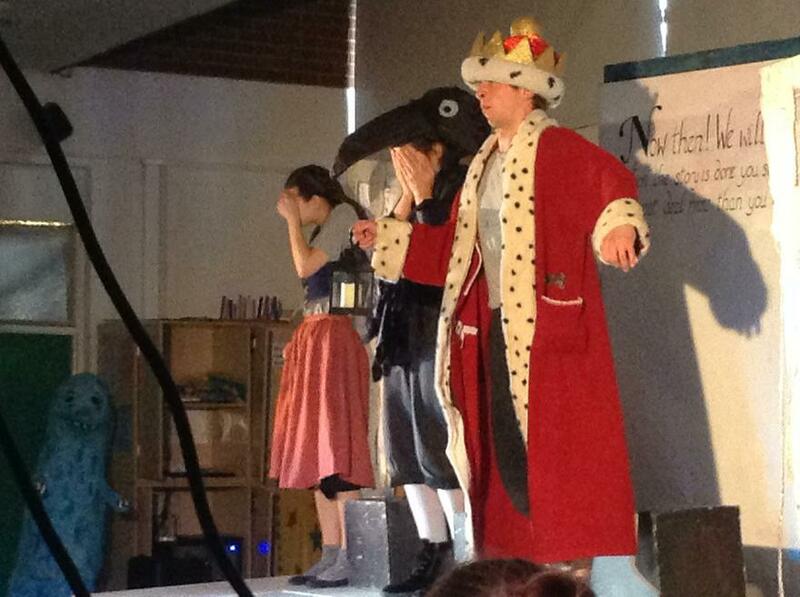 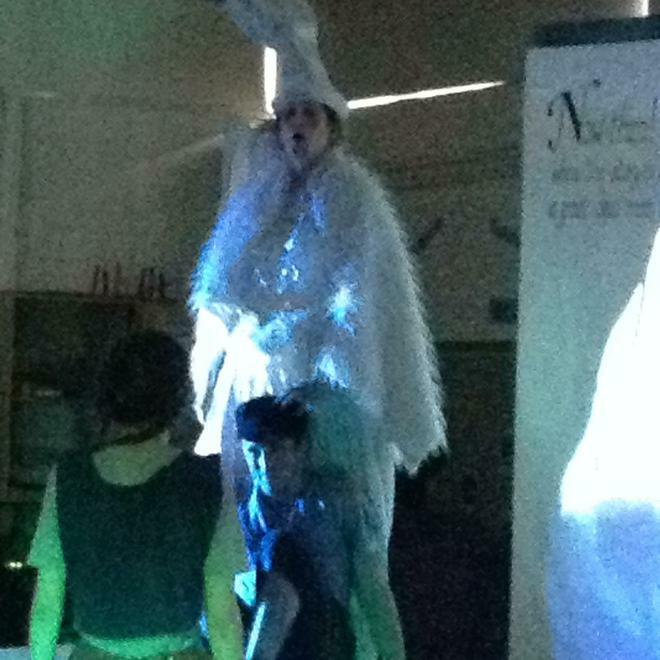 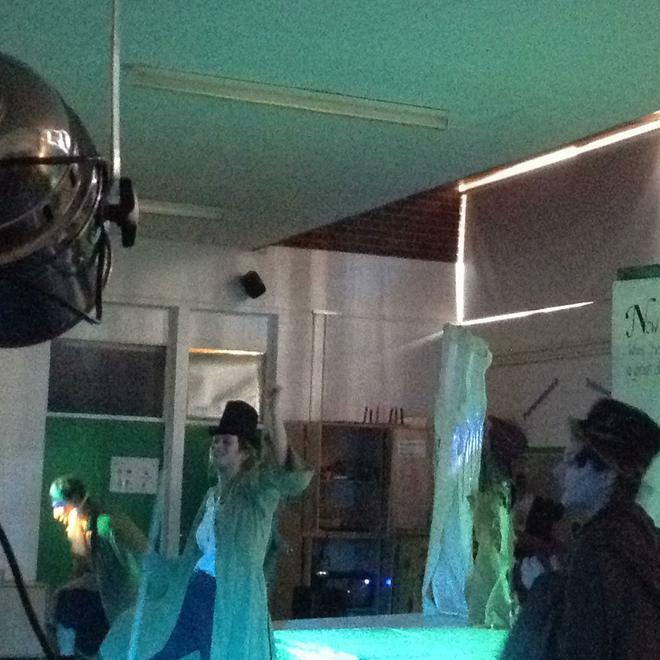 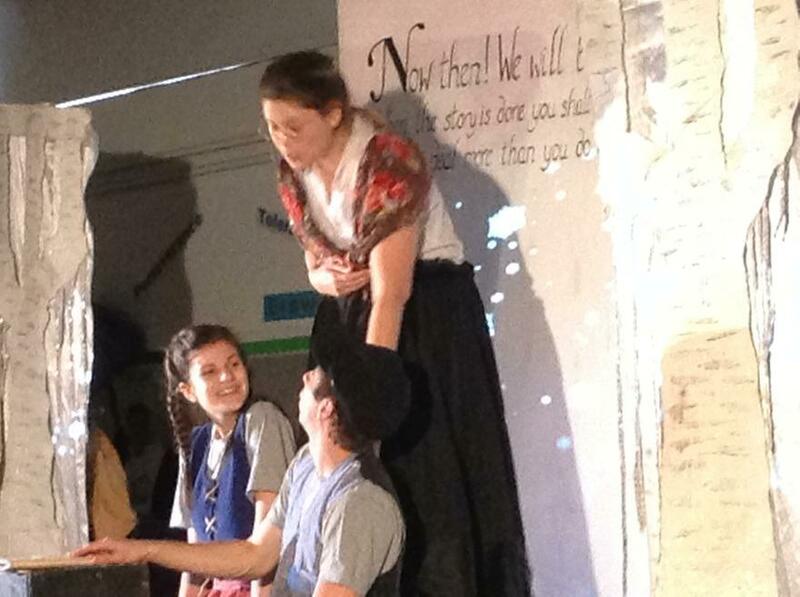 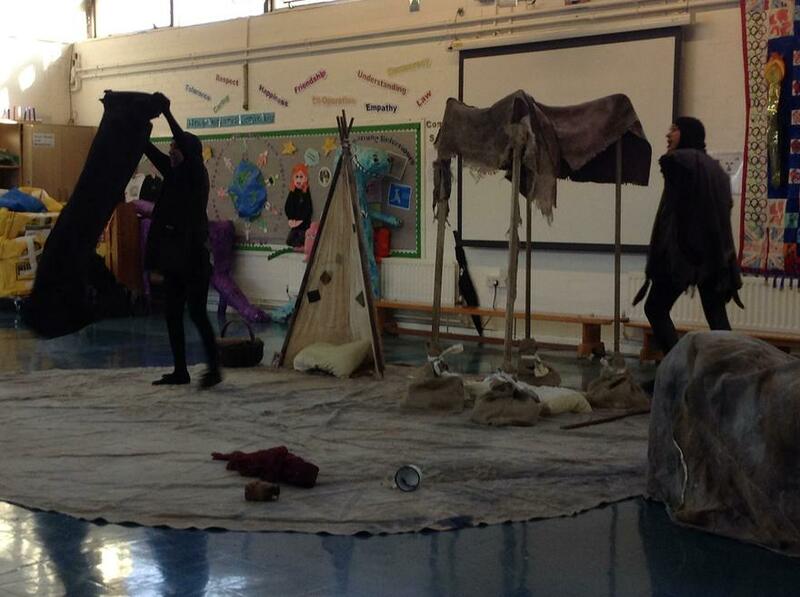 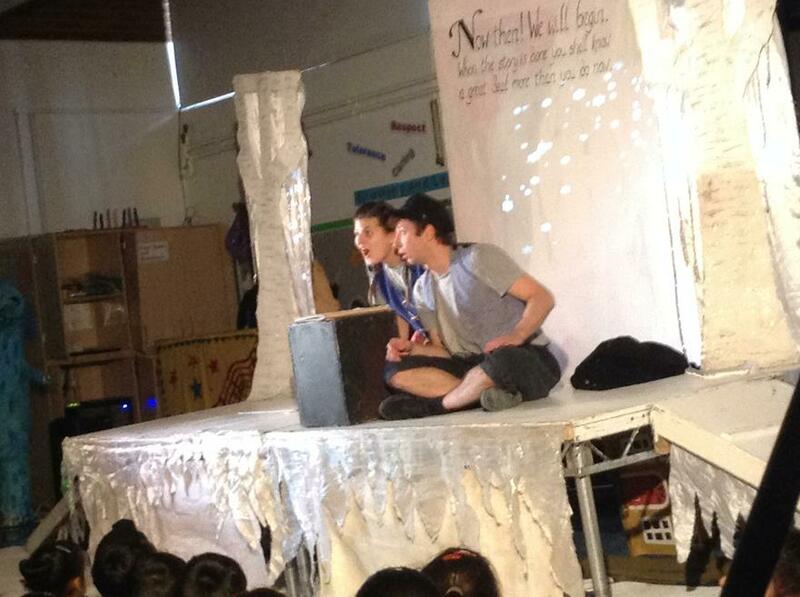 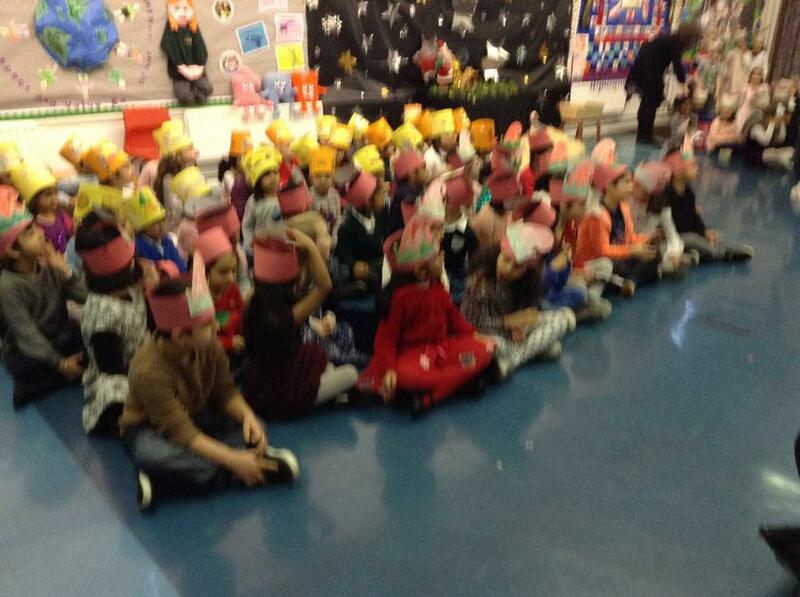 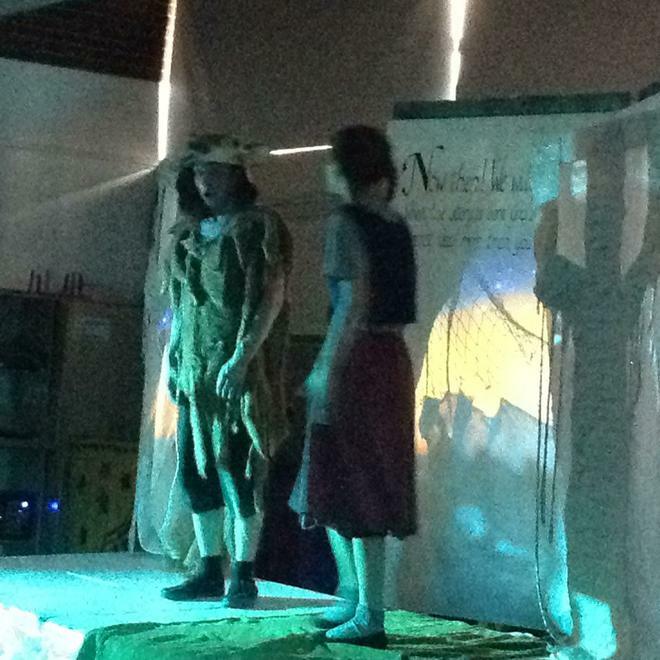 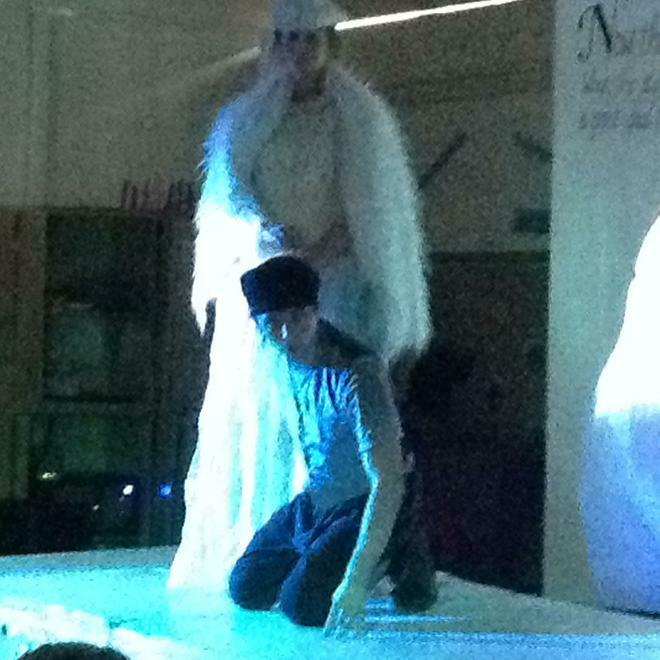 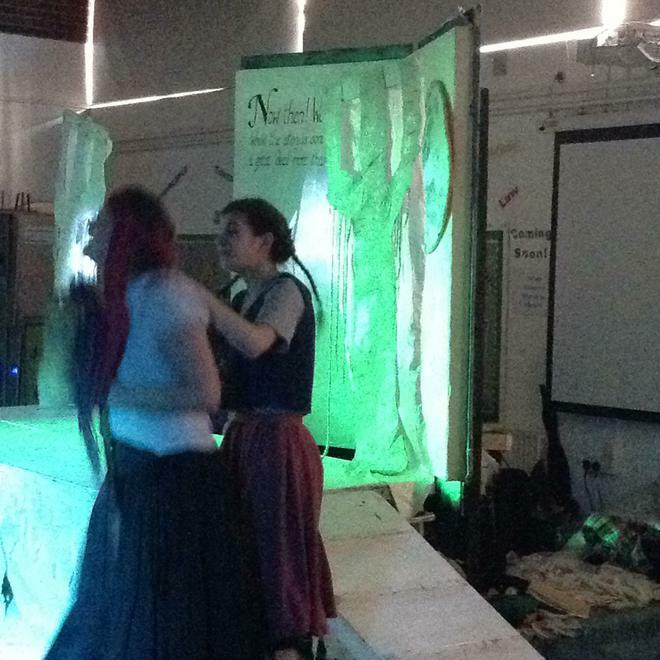 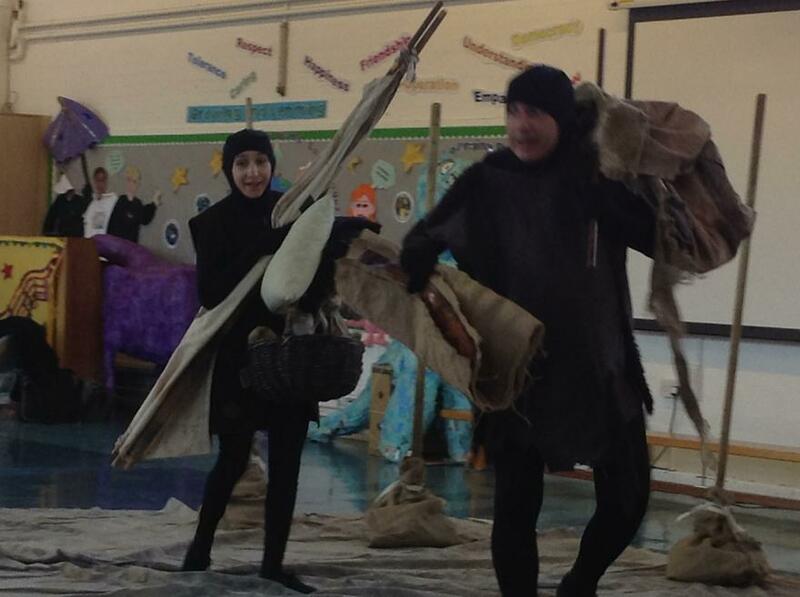 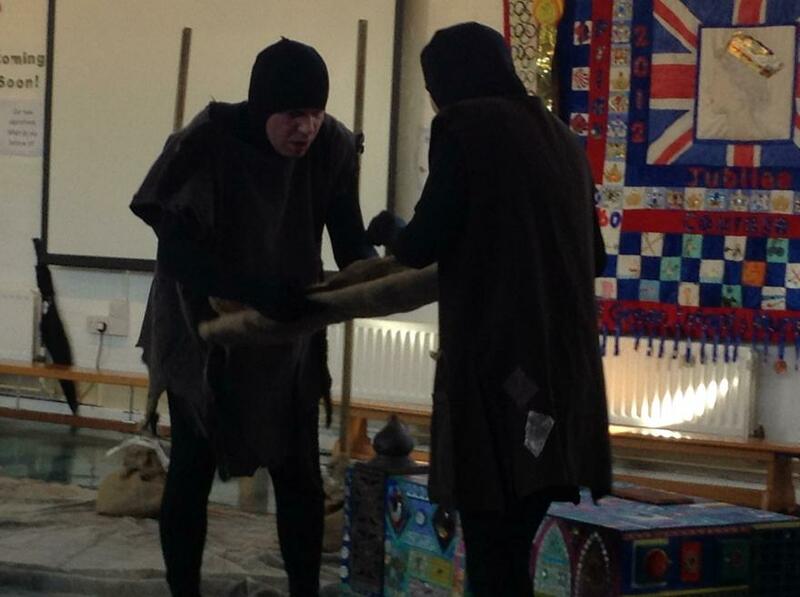 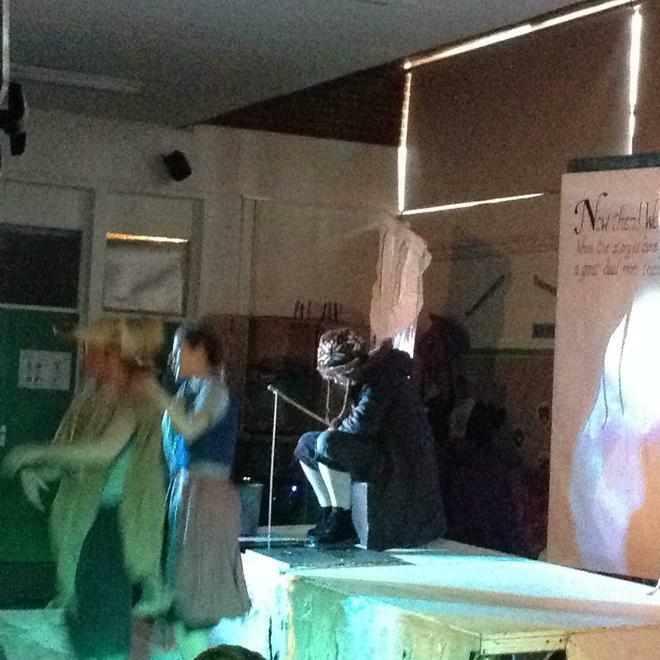 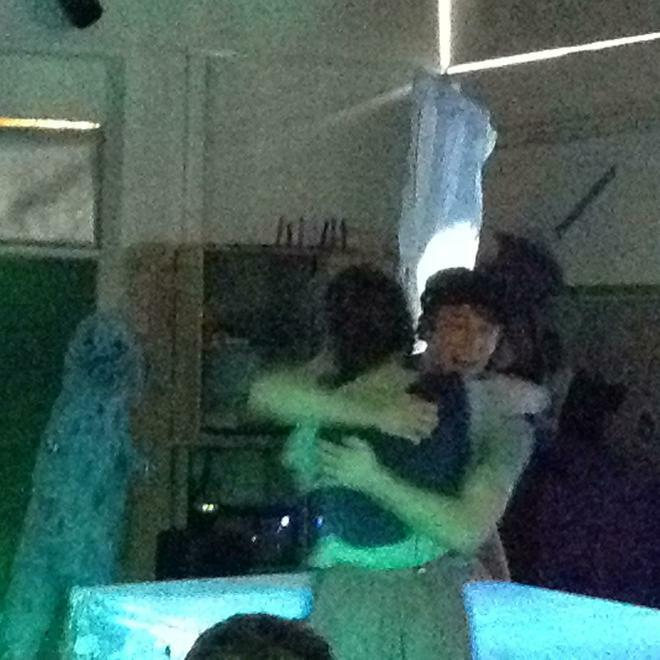 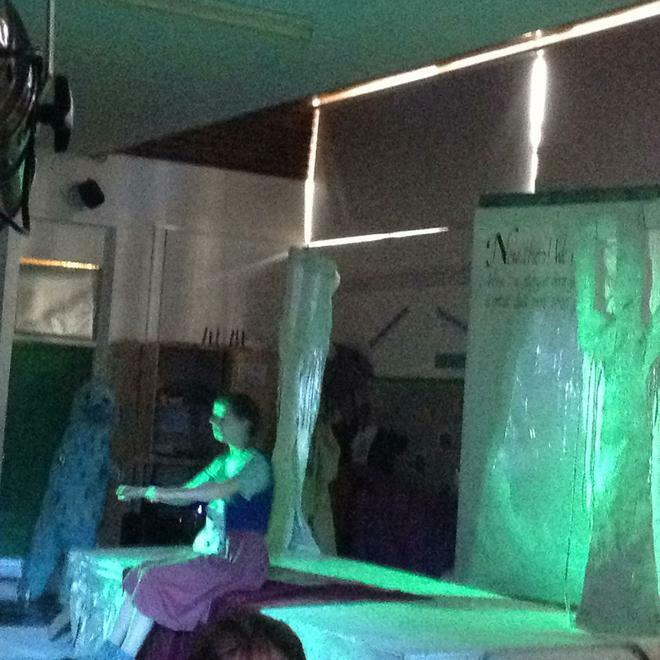 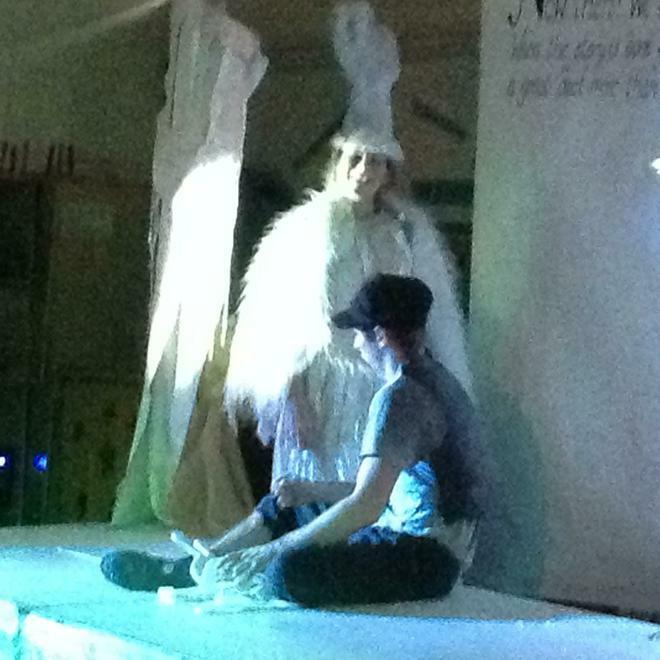 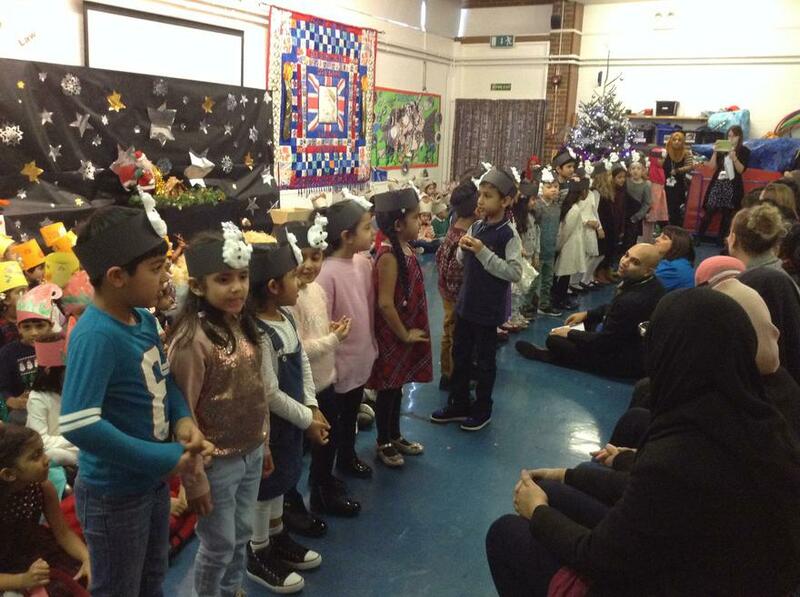 We were so engaged by these actors - what a special time to be at school! 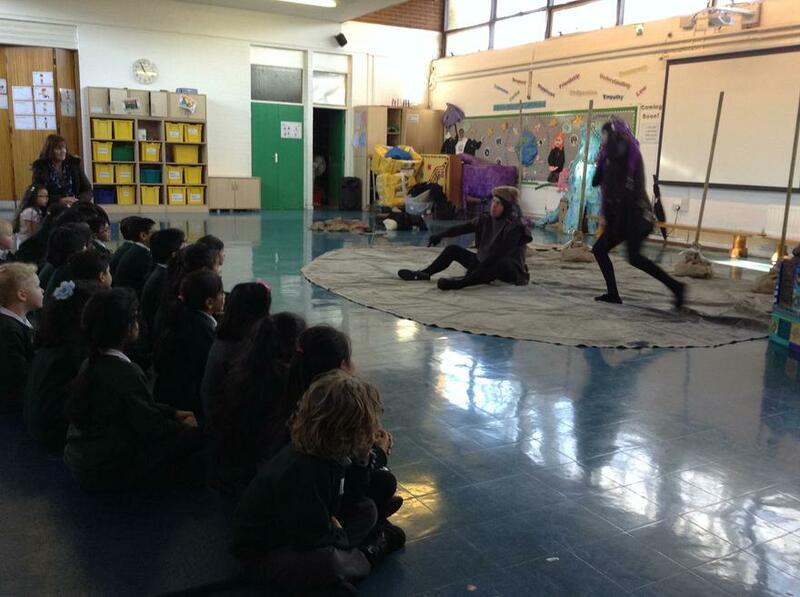 Look through the performance photos with us so we can tell you they story, point out our favourite parts and share our thoughts about what it was like. 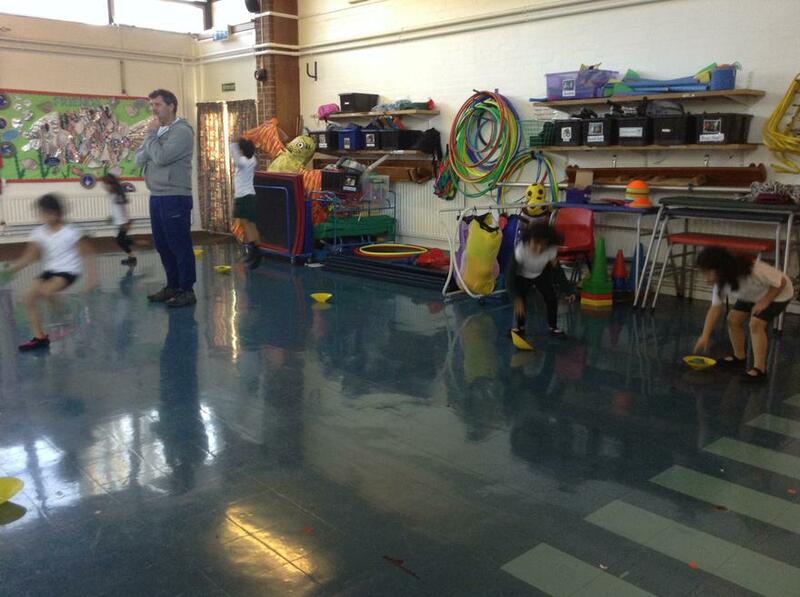 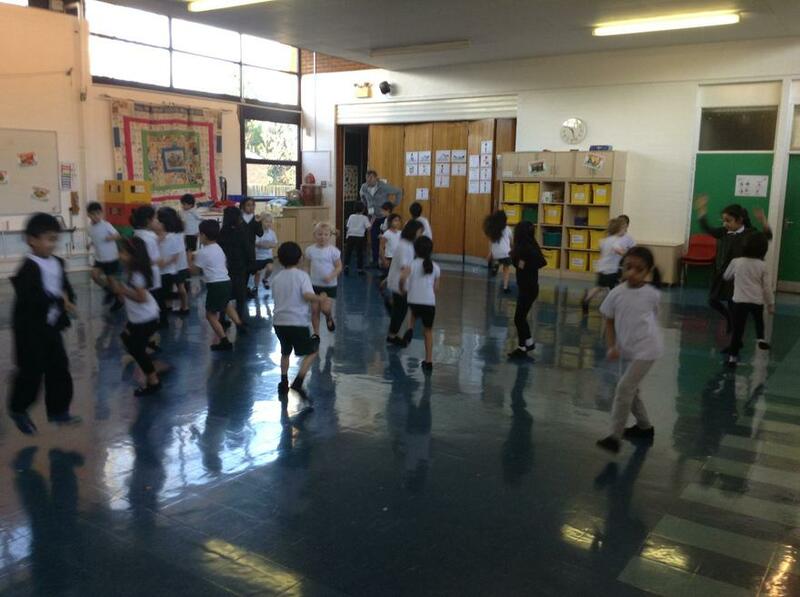 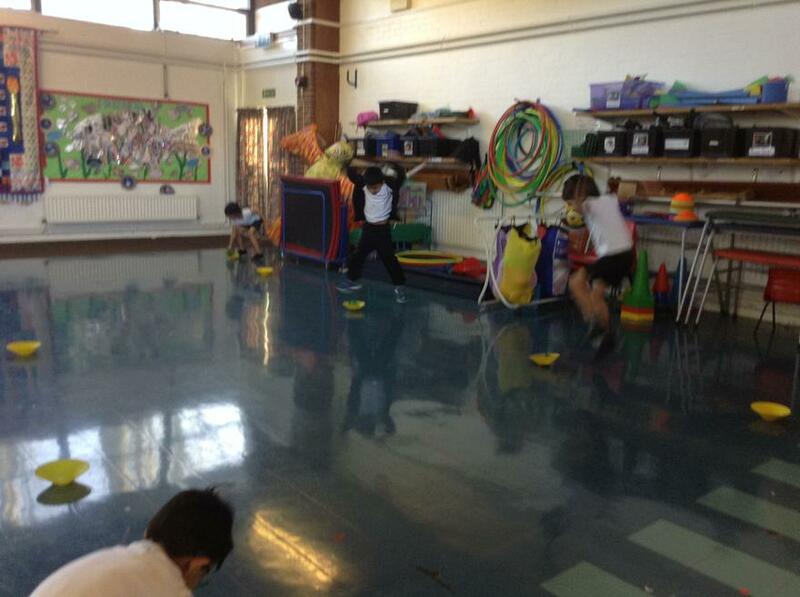 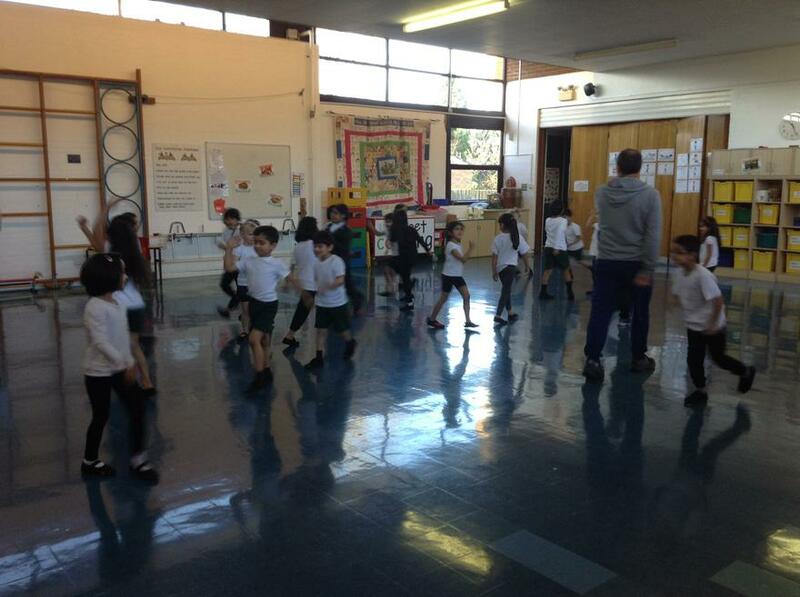 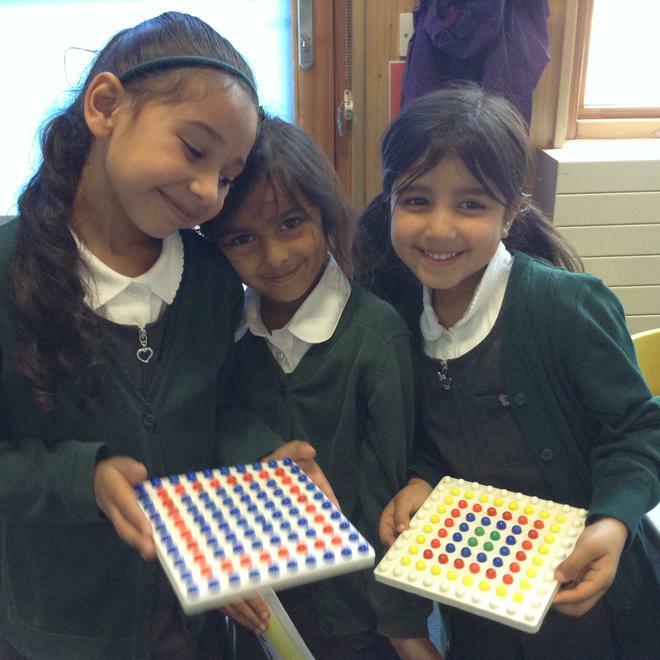 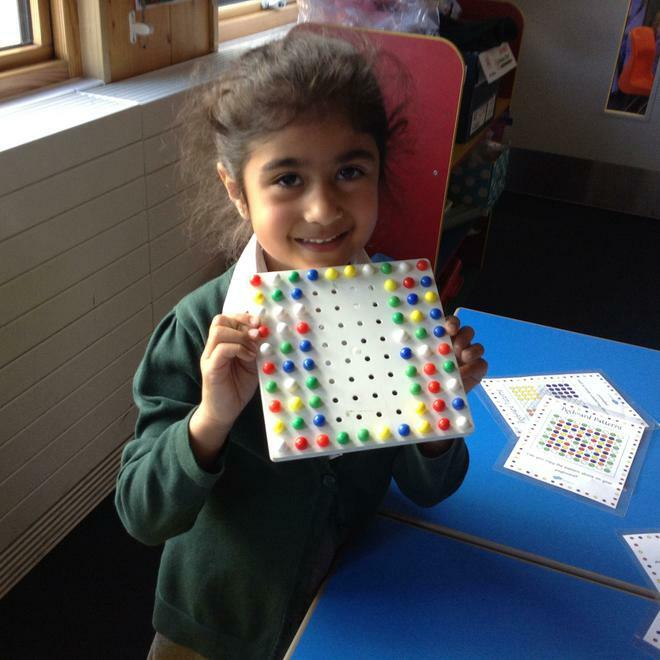 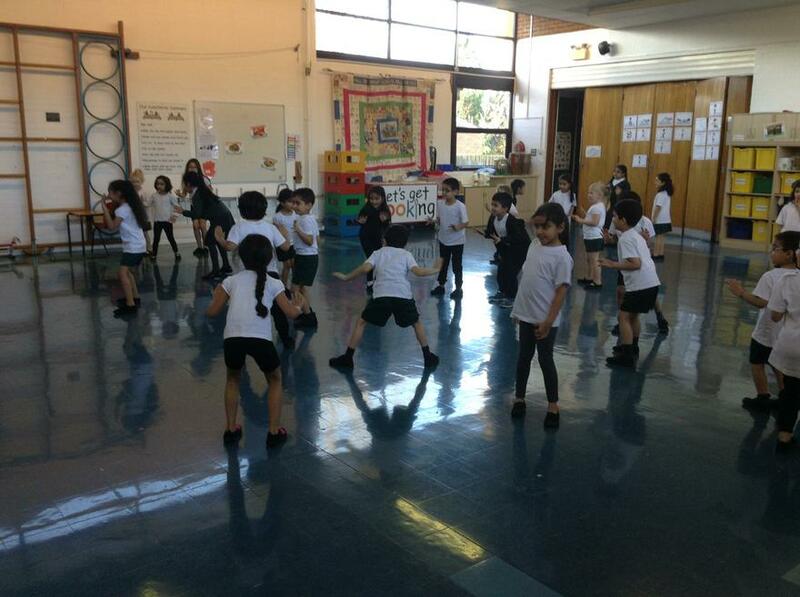 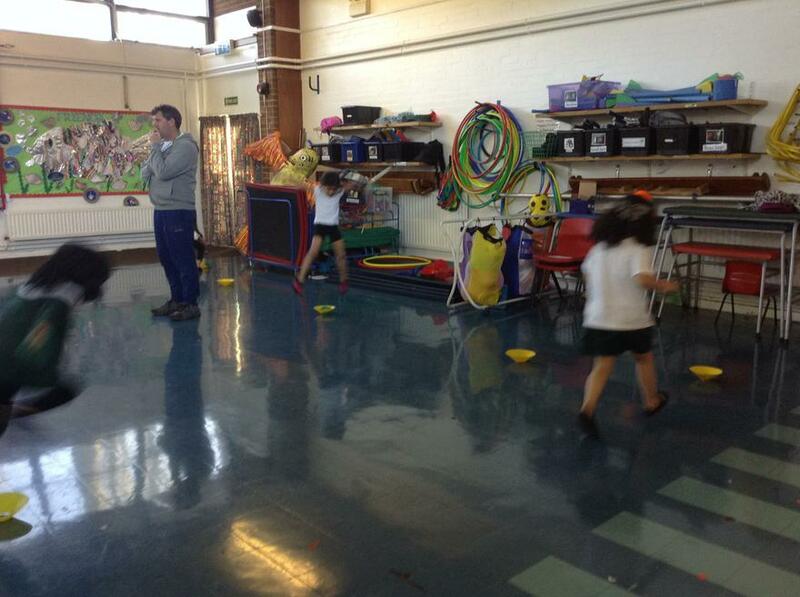 We have been having loads of fun learning and developing new skills with Mr Dave! 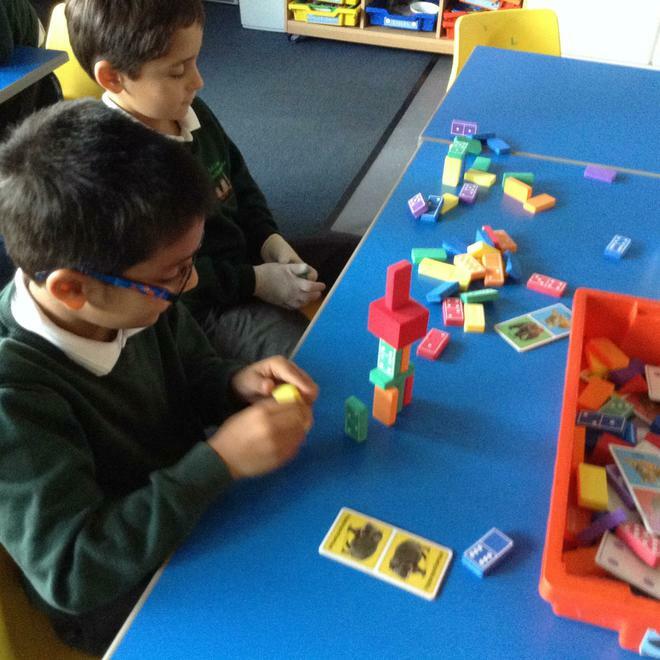 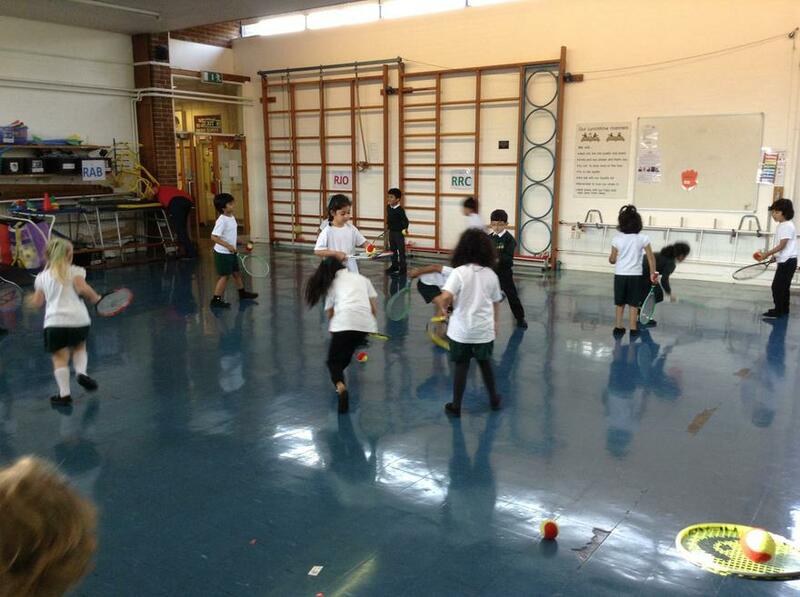 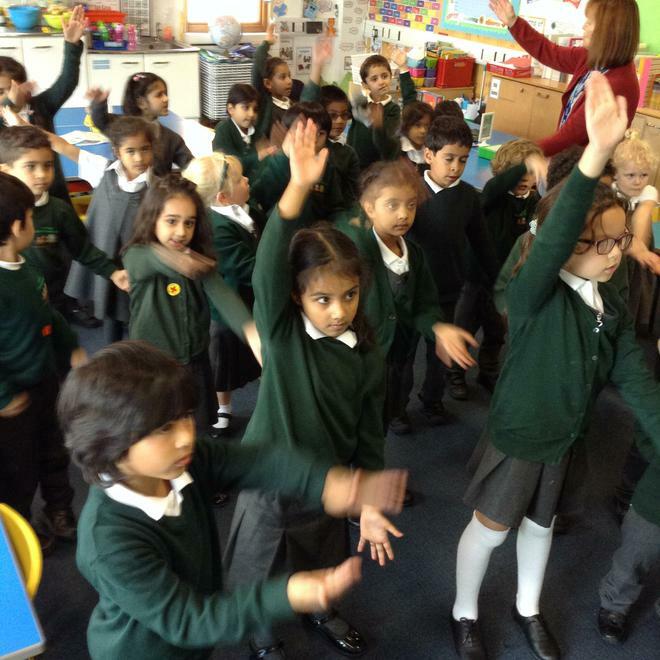 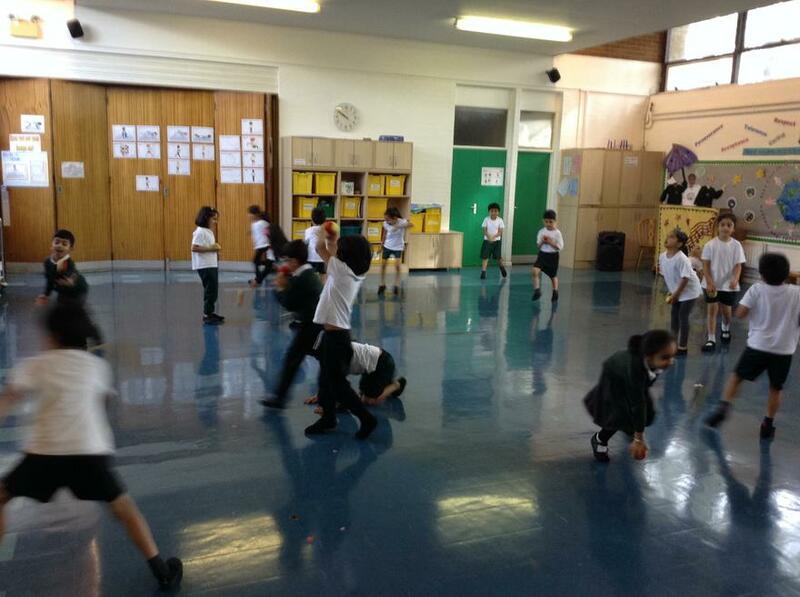 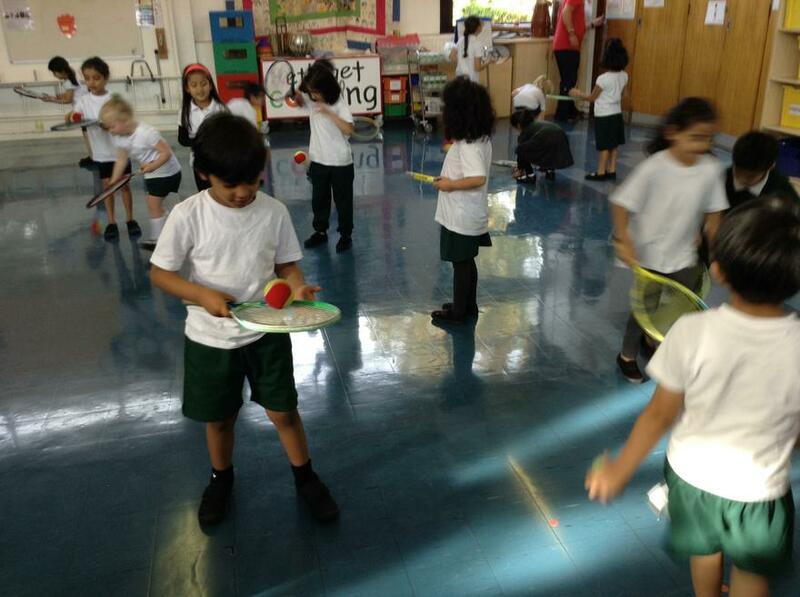 It has been exciting to challenge ourselves to to move in different ways and keep our balance. 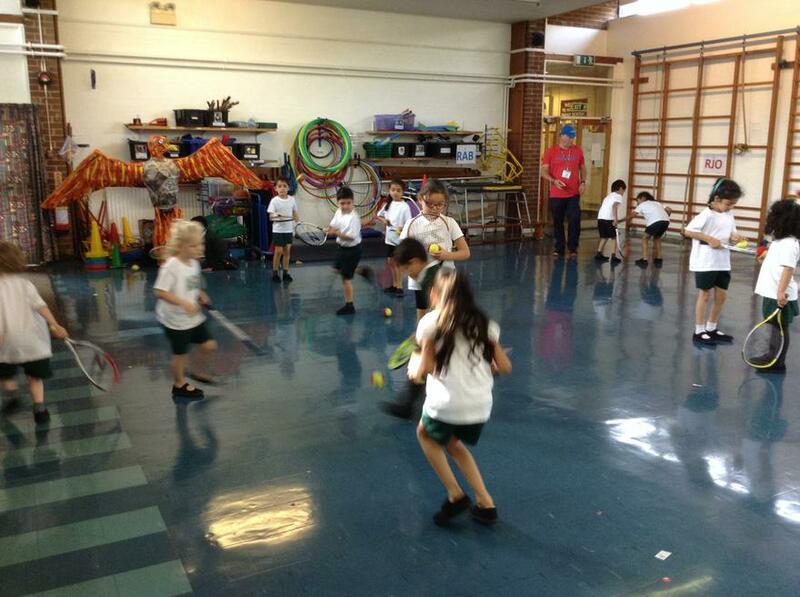 We are developing our skills to shoot, defend and attack with a range of resources. 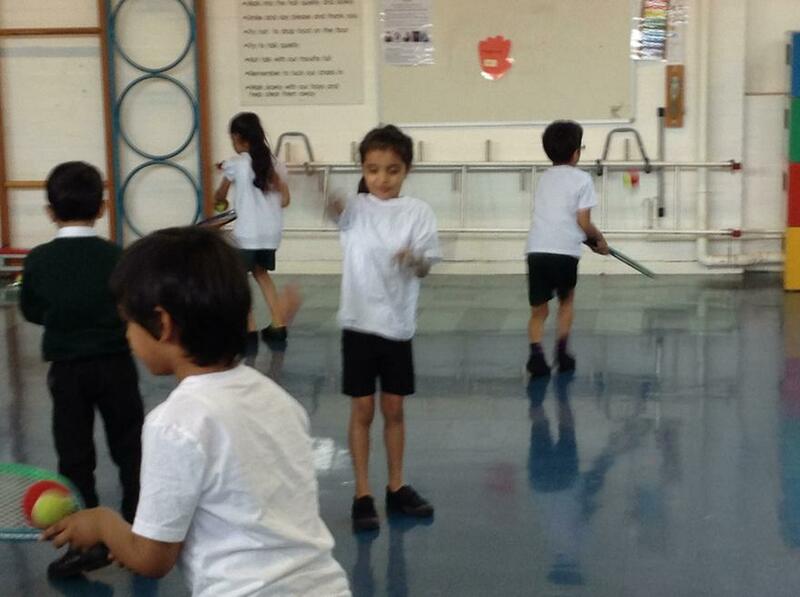 When we shoot we have to steady our feet, aim for a target and be more accurate with our arms and hands. 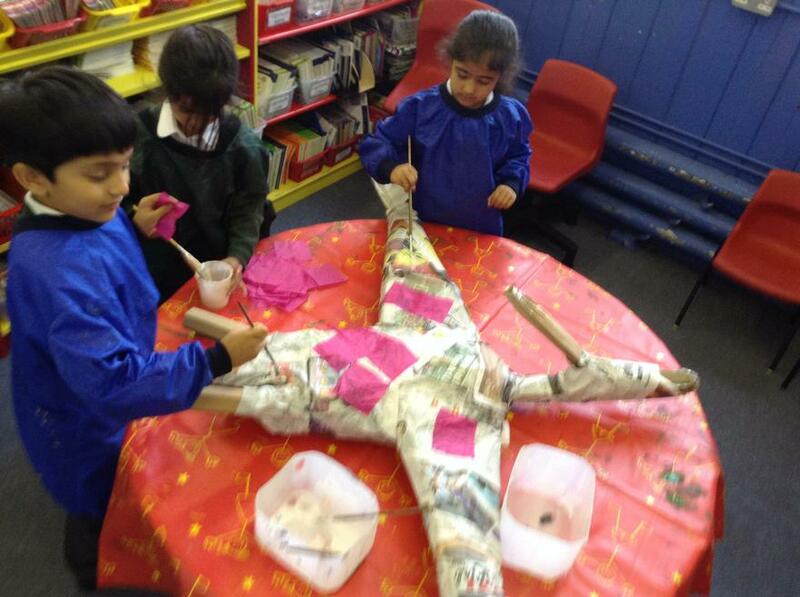 It started a lot harder than we thought, but we are getting increasingly more accurate the more we try! 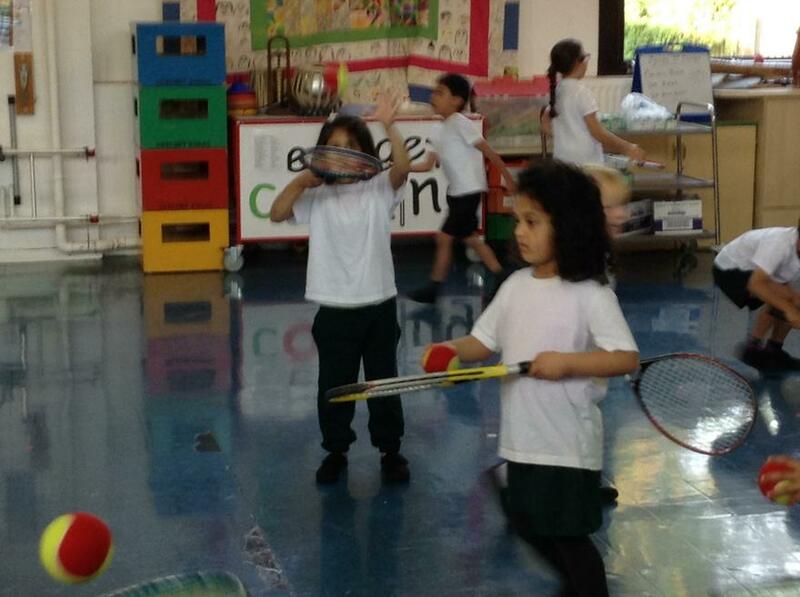 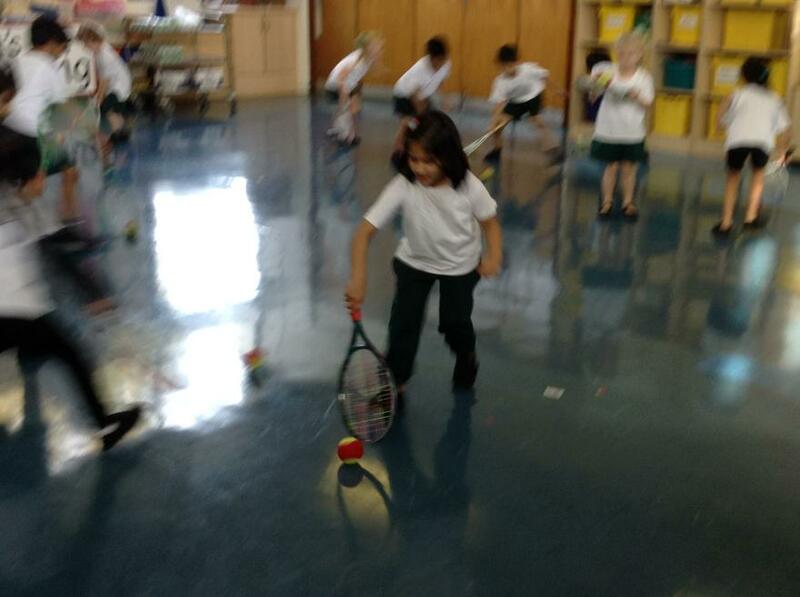 Hansel was a brilliant tennis coach! 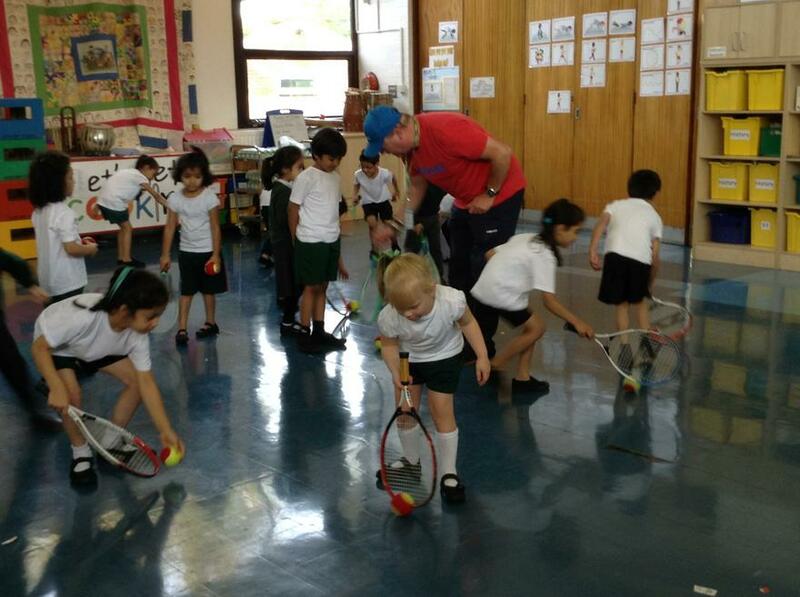 He made us all so excited about tennis and showed us loads of really awesome skills. 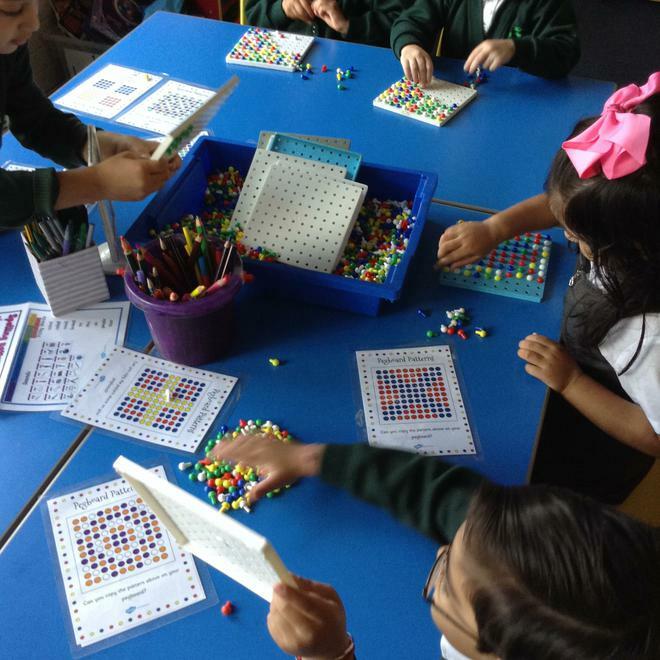 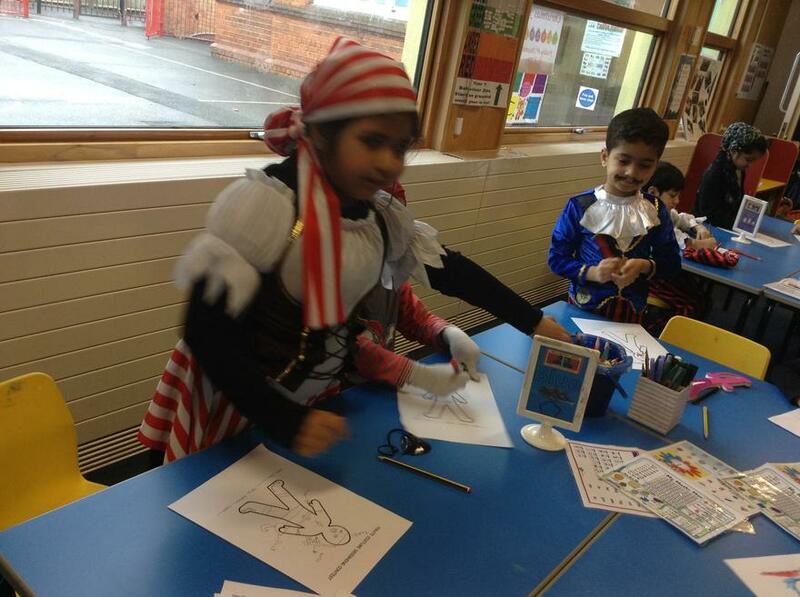 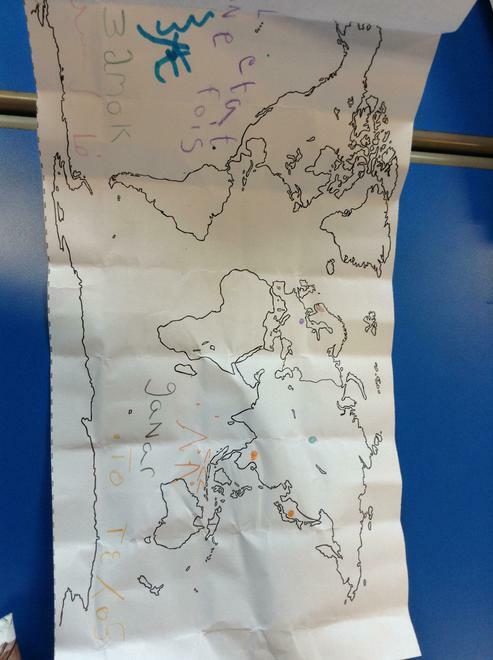 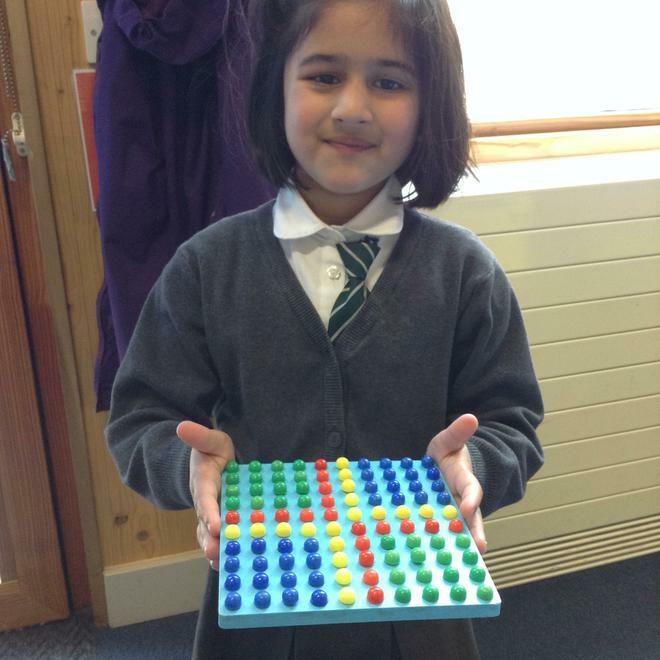 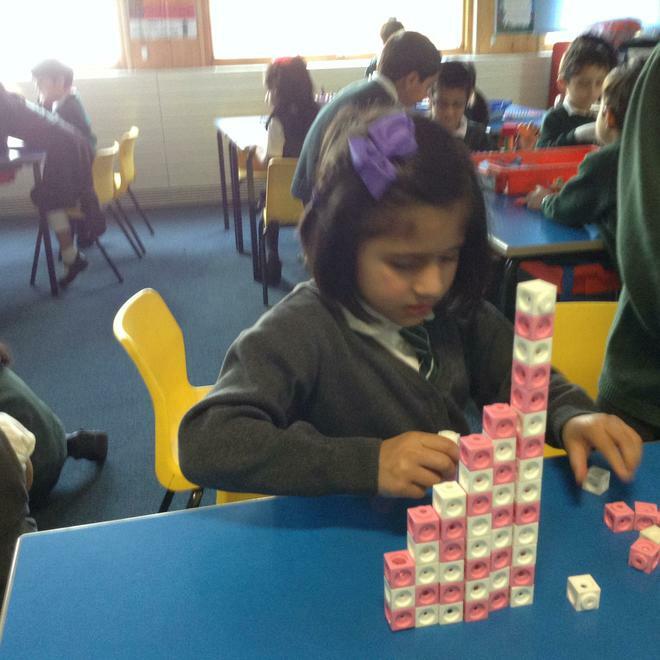 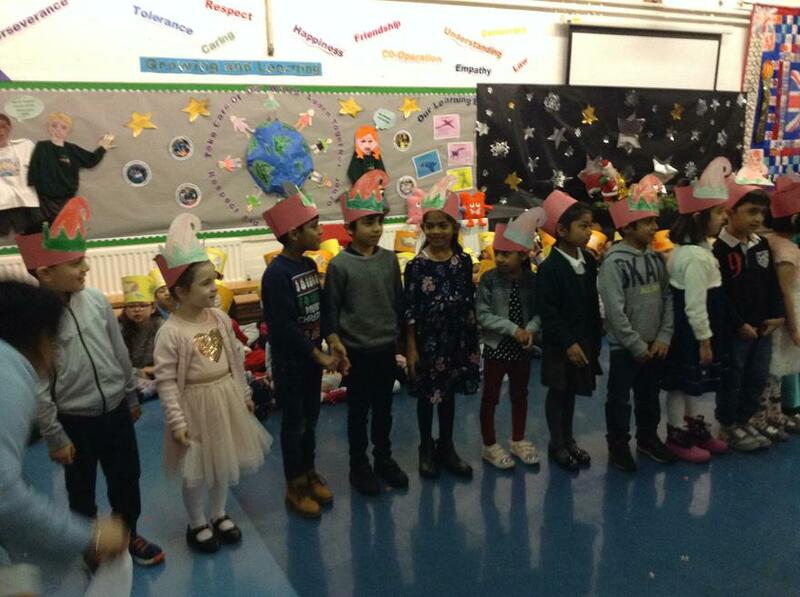 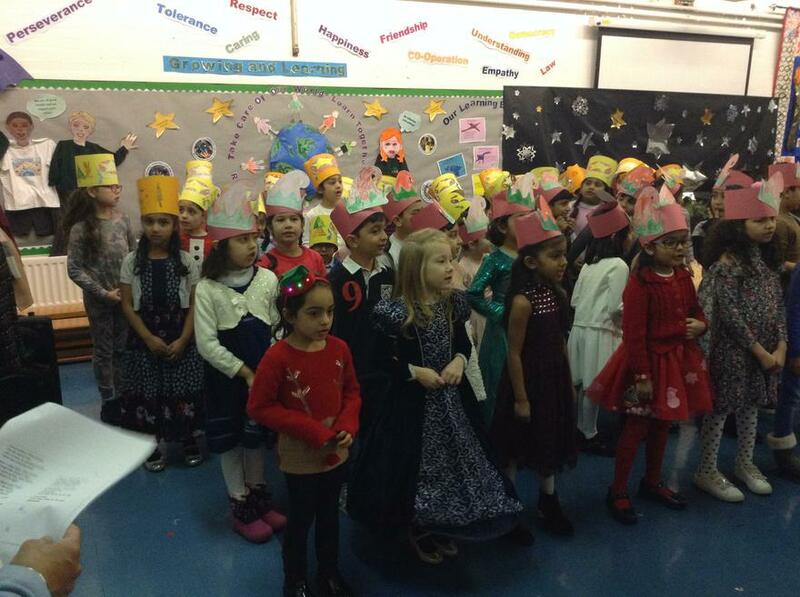 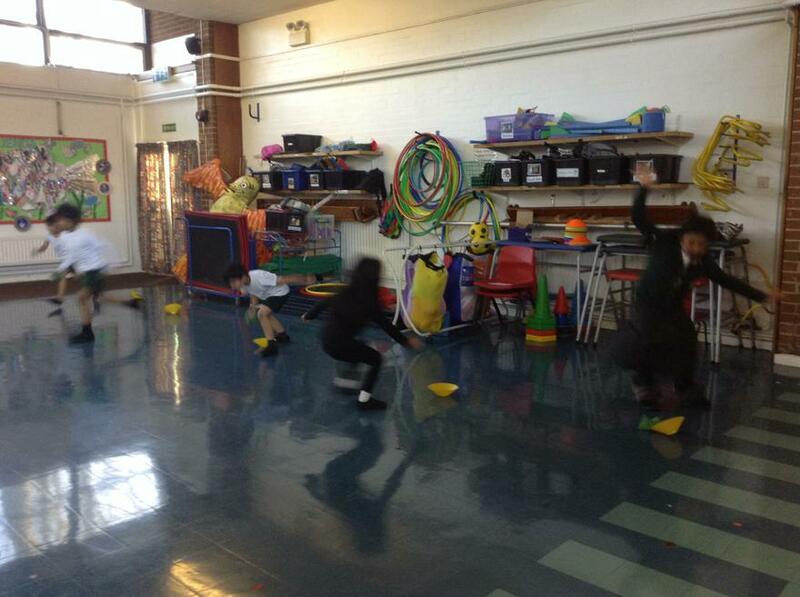 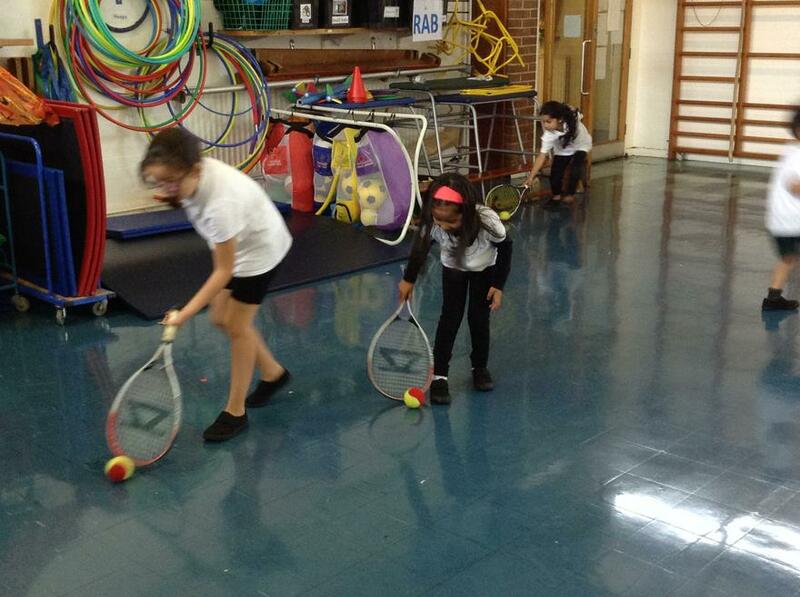 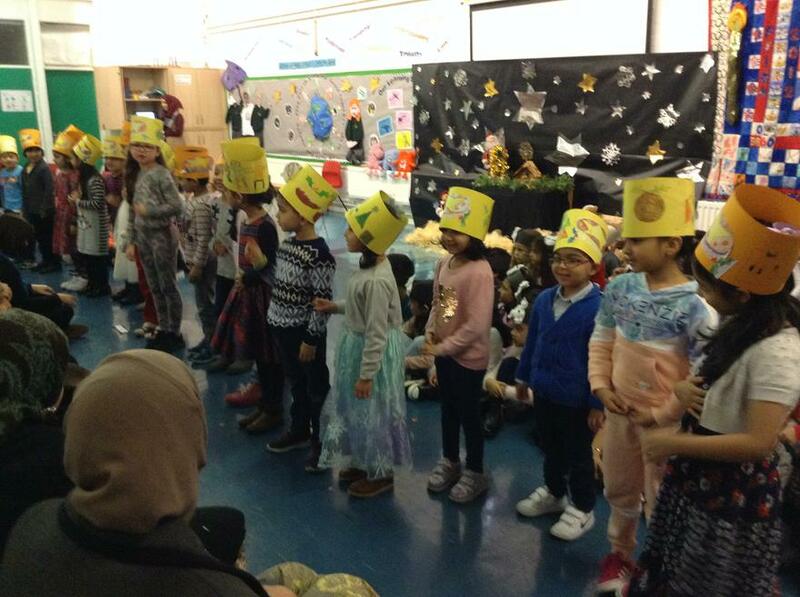 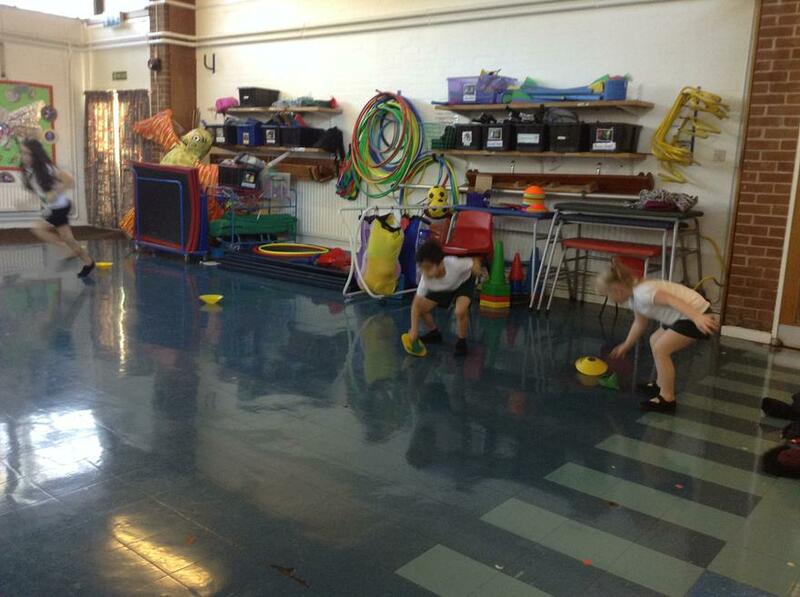 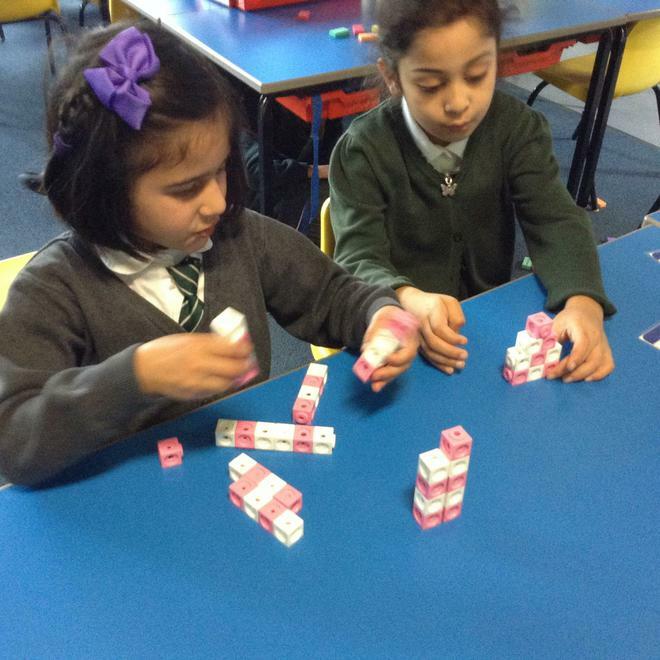 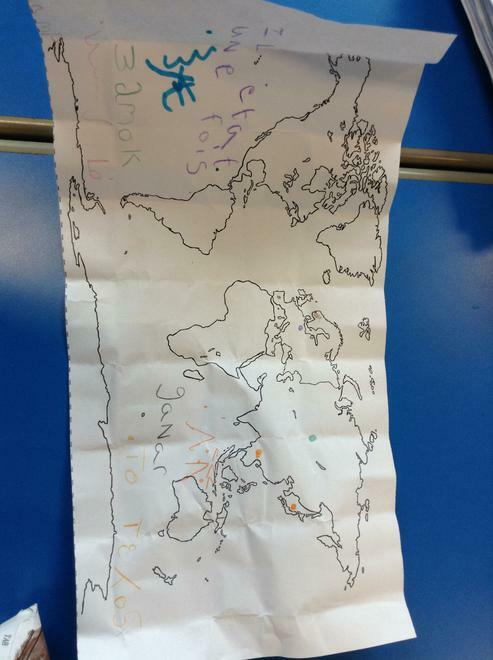 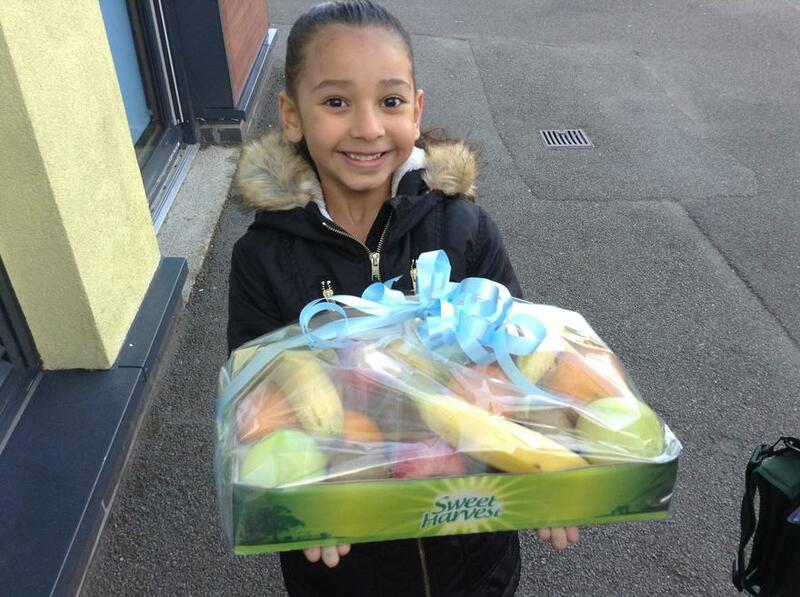 We had a go at lots of the skills but would love more practise at them. 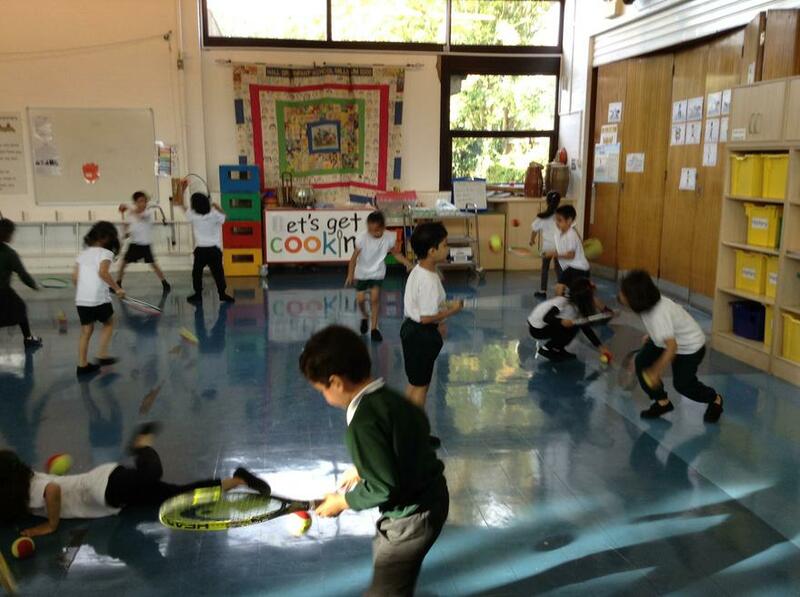 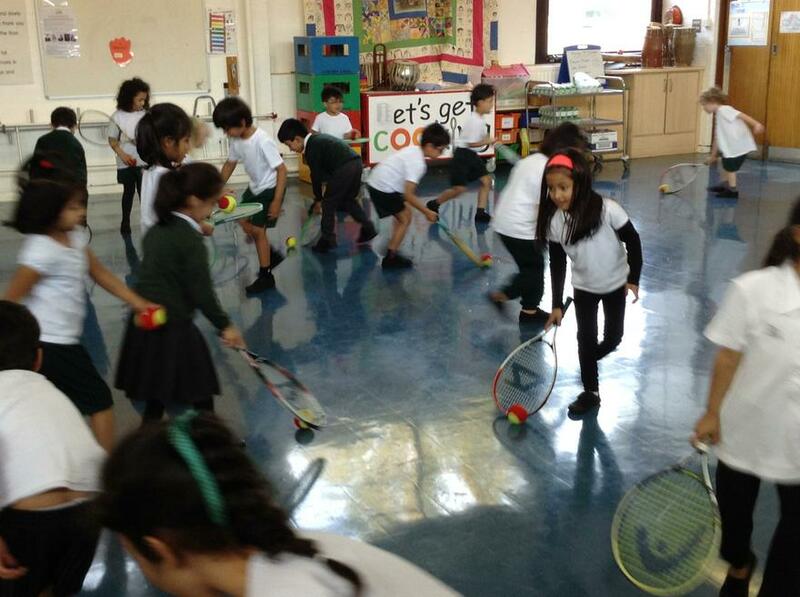 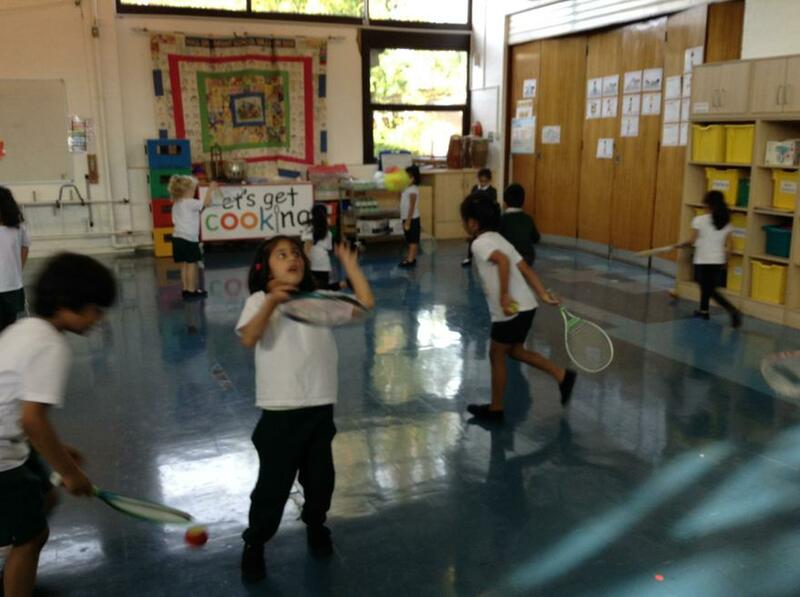 We could go to the tennis sessions this Saturday - info on leaflets sent home. 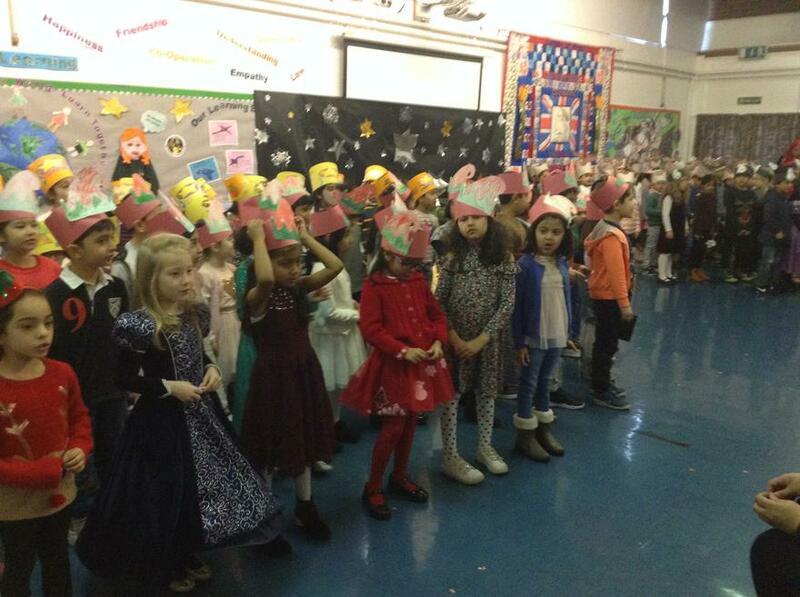 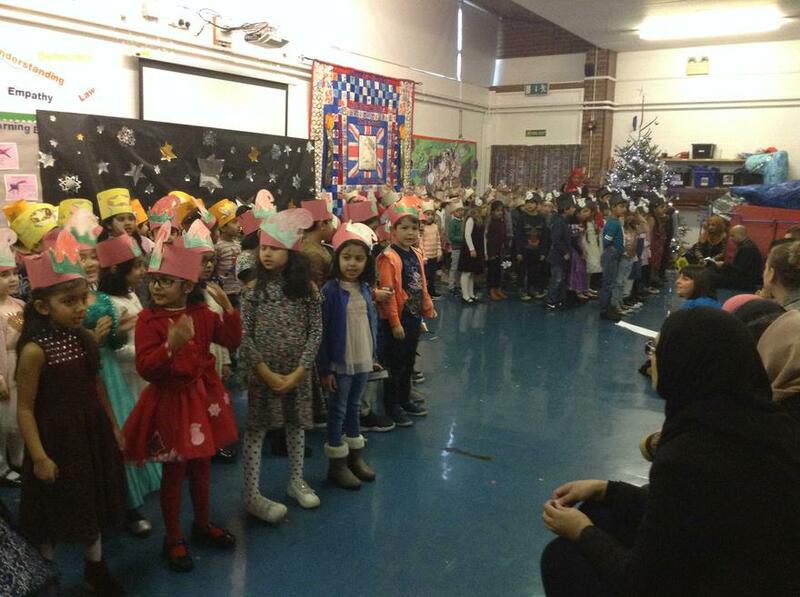 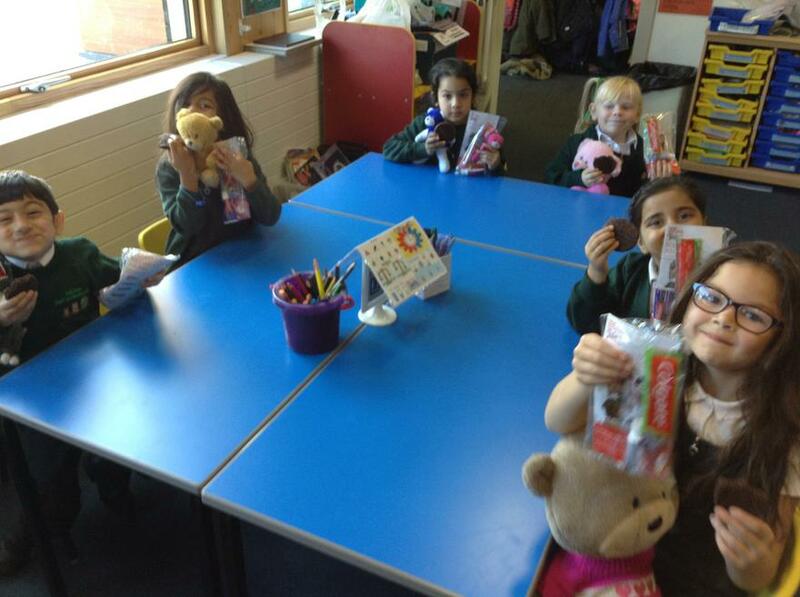 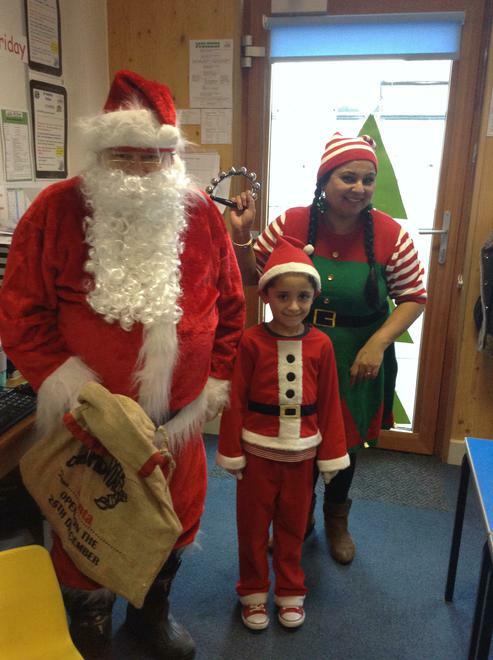 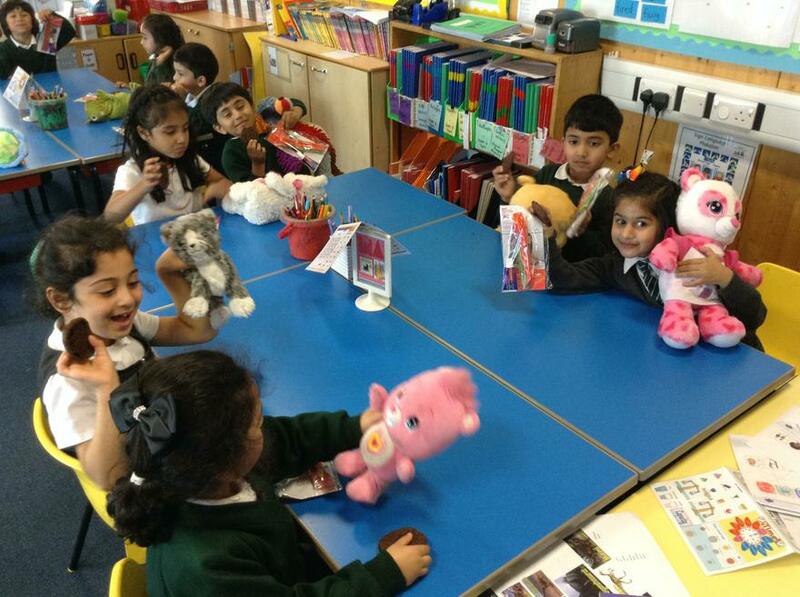 We all loved bringing in our bears to show them our wonderful school. 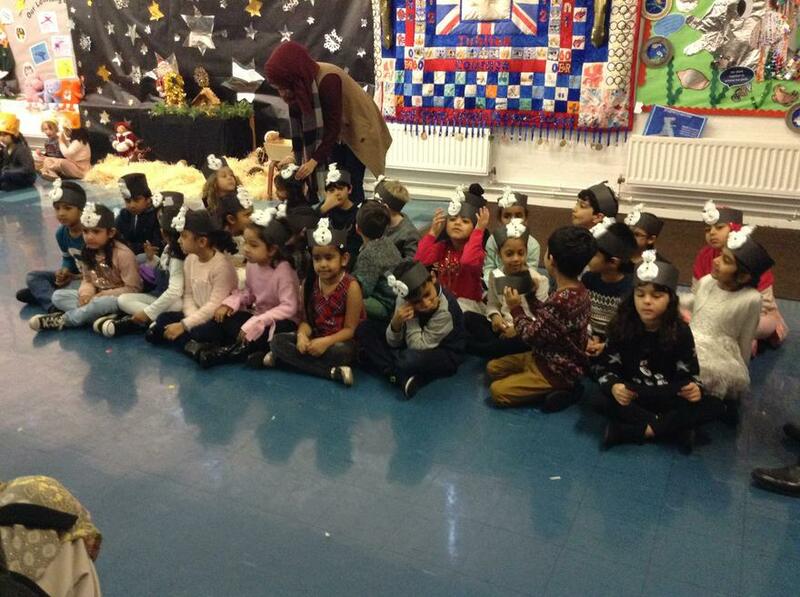 We were on our best behaviour so the bears knew exactly what to do to be safe and happy. 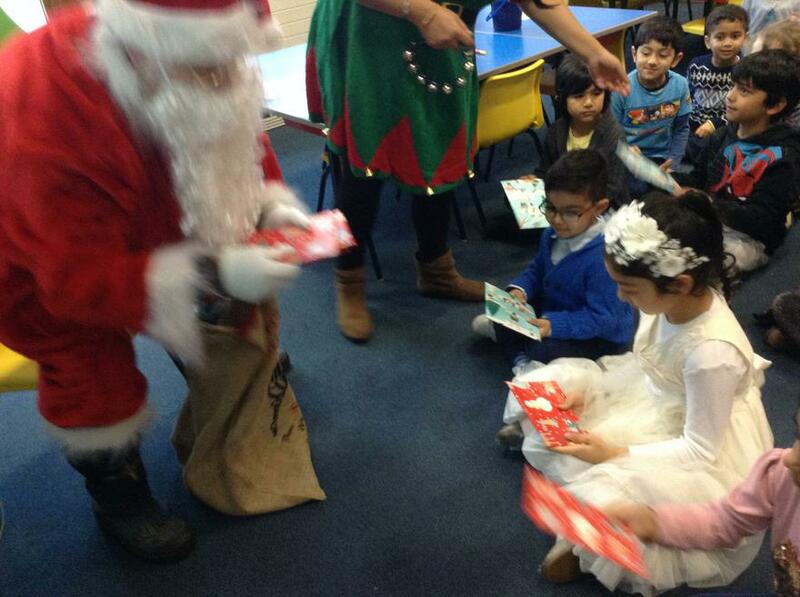 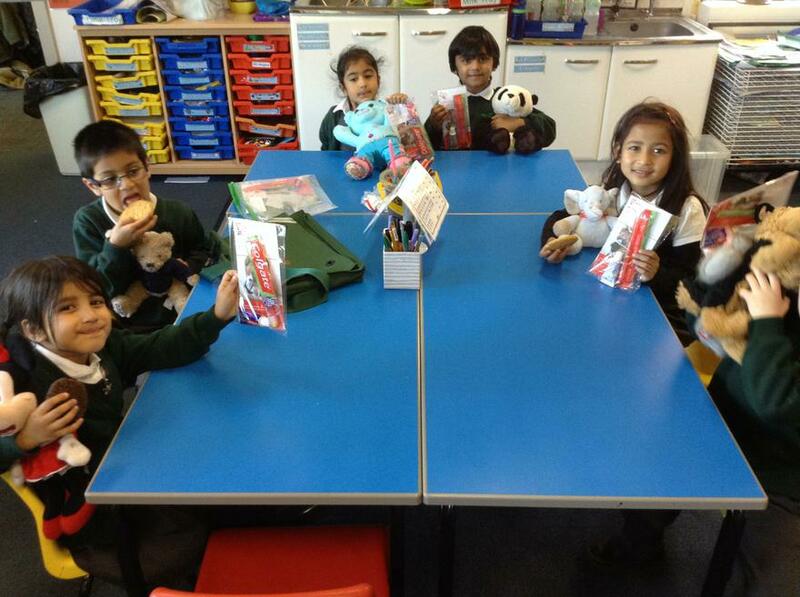 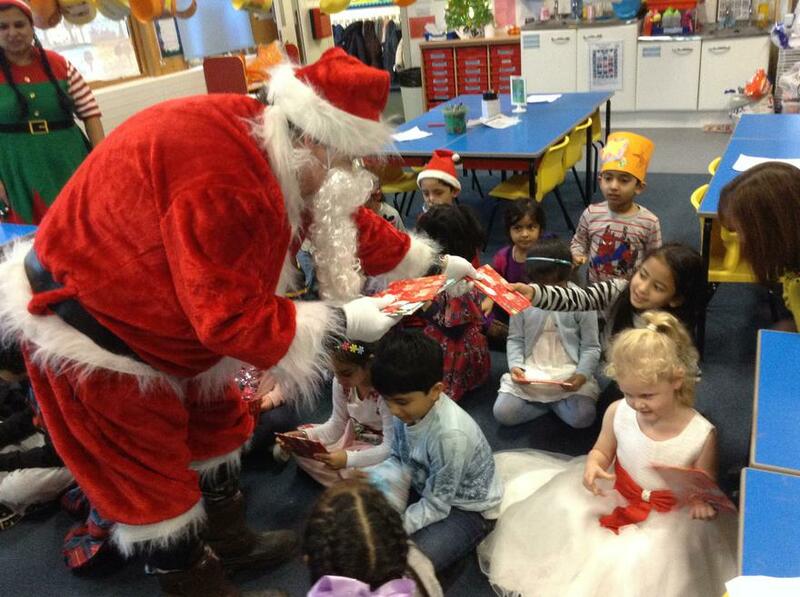 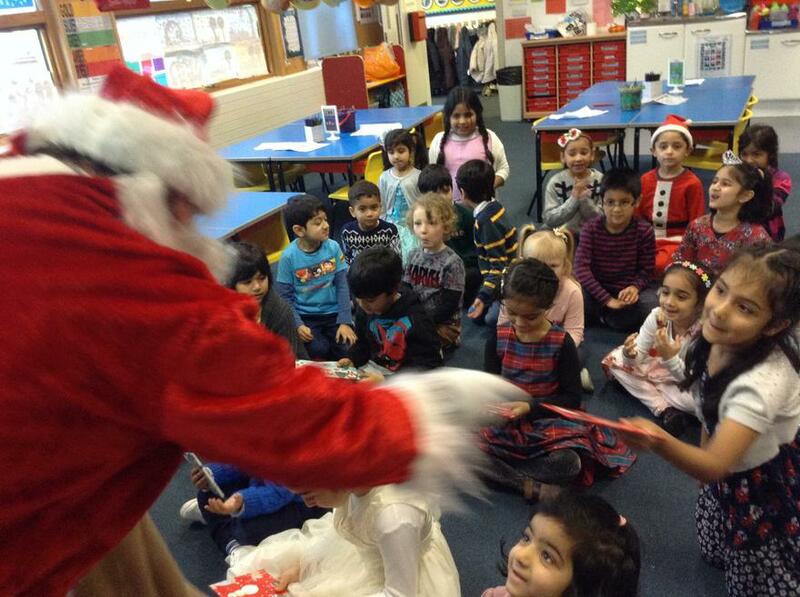 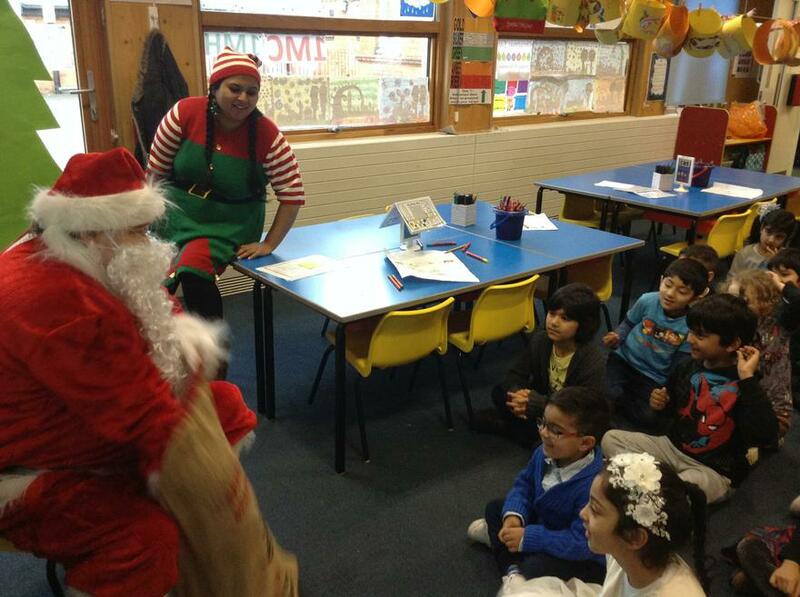 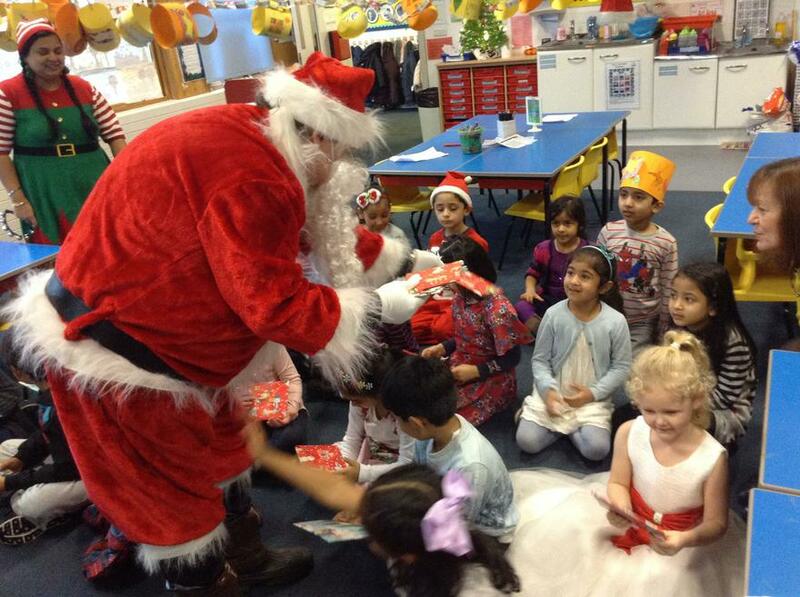 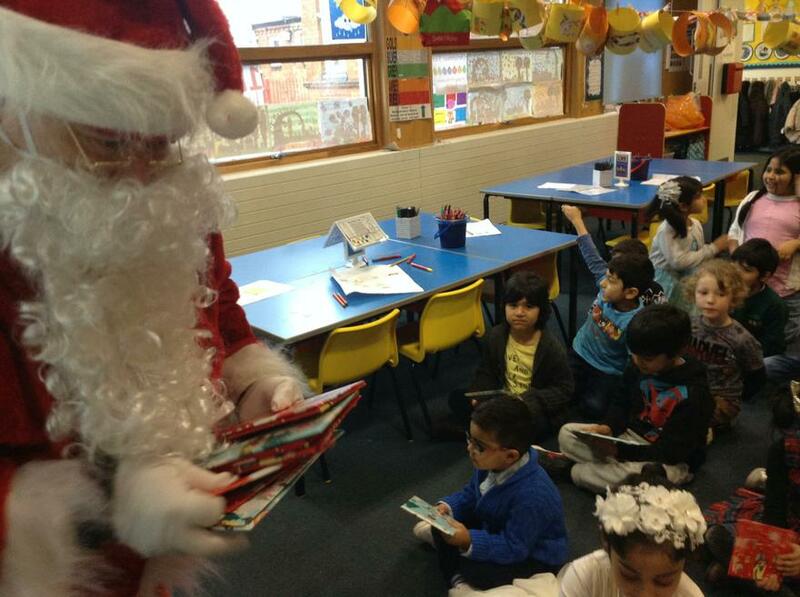 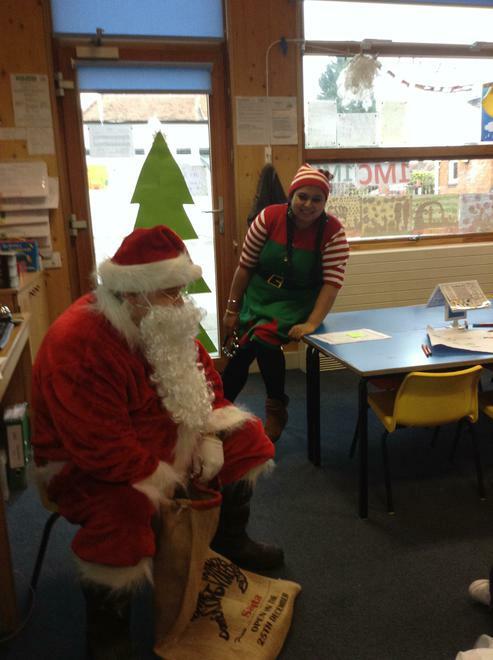 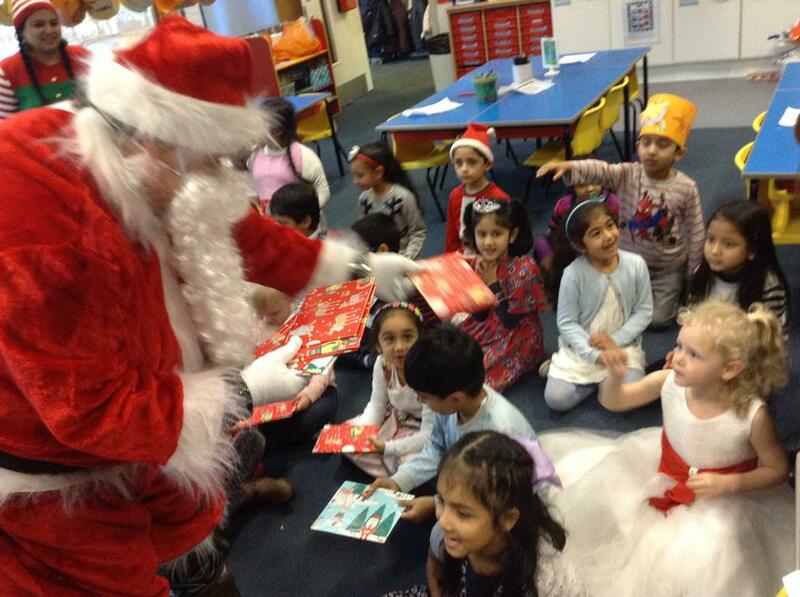 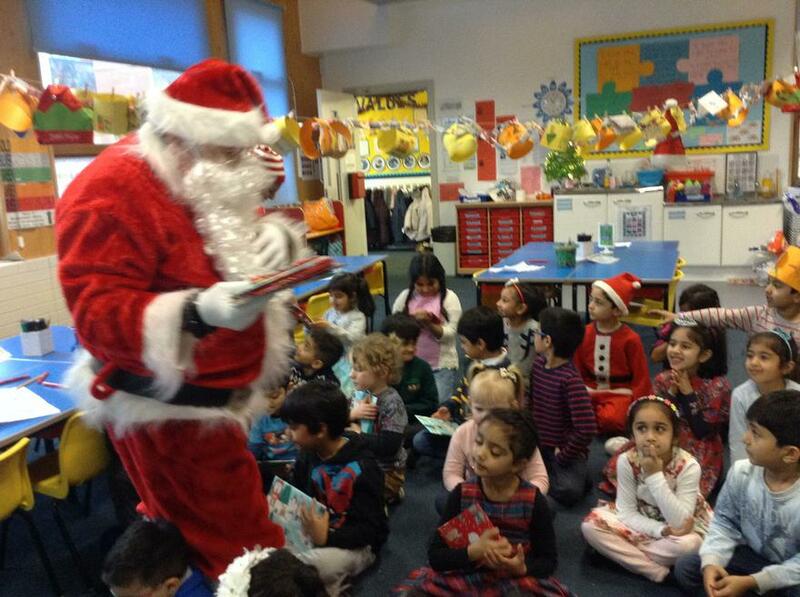 It was great fun to show our bears to the teachers and get to see our friends toys too. 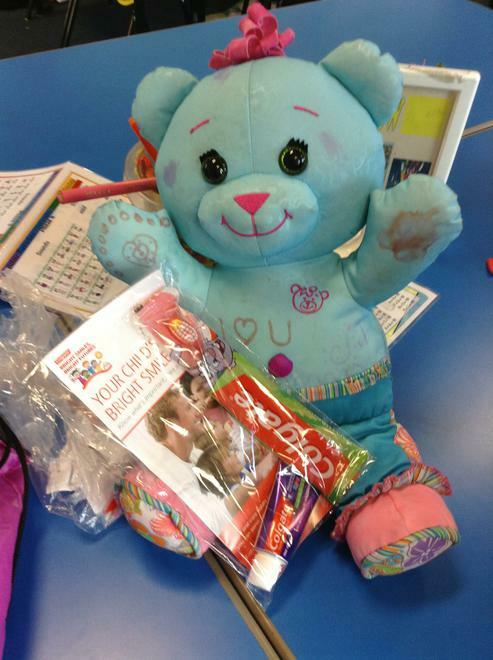 It was a Bear-y good day! 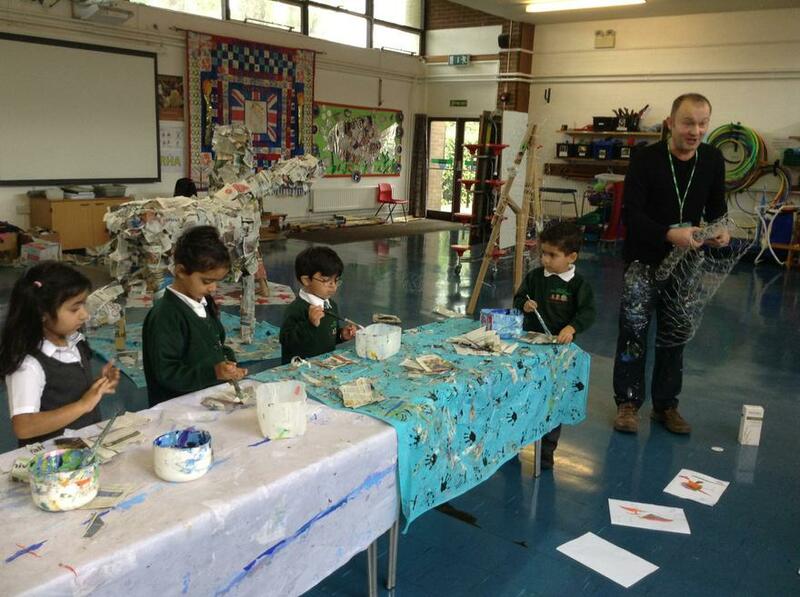 Our wonderful Artist in Residence, Steve returned with some baby dinosaurs for us to help complete. 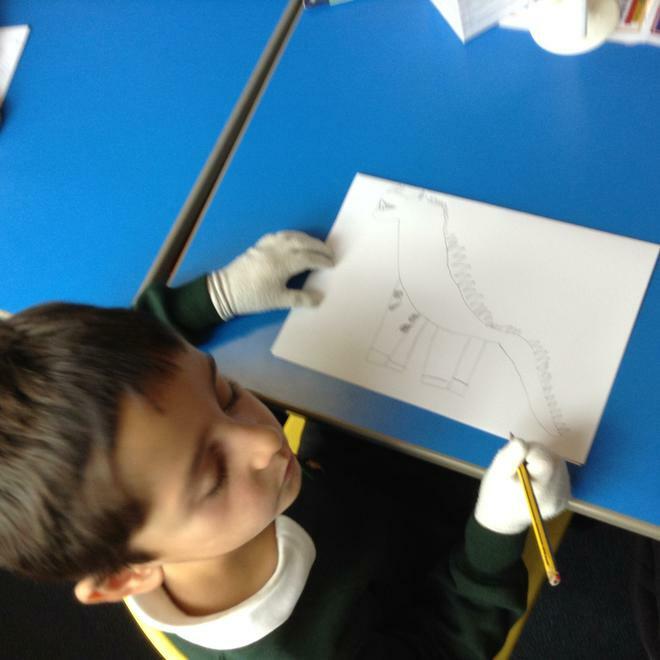 He was impressed with us for knowing which materials we were using and could remember how to glue and stick the materials correctly and safely too. 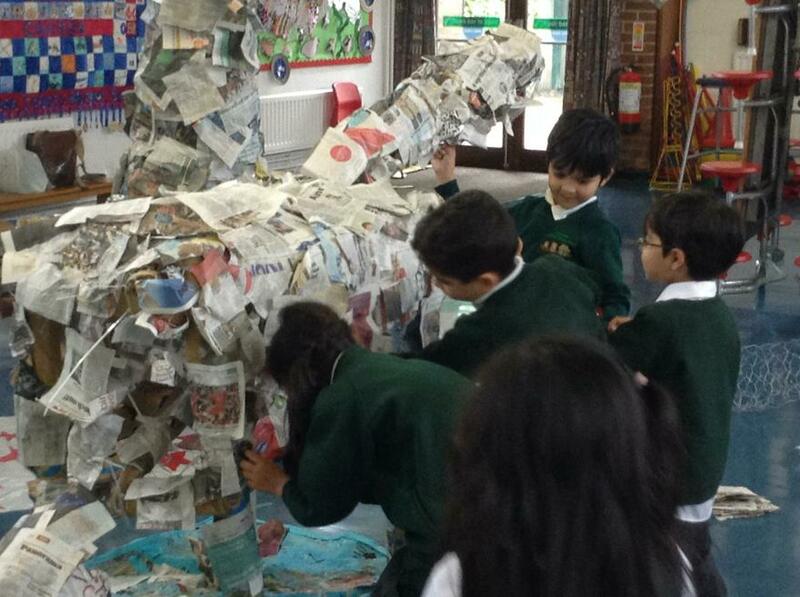 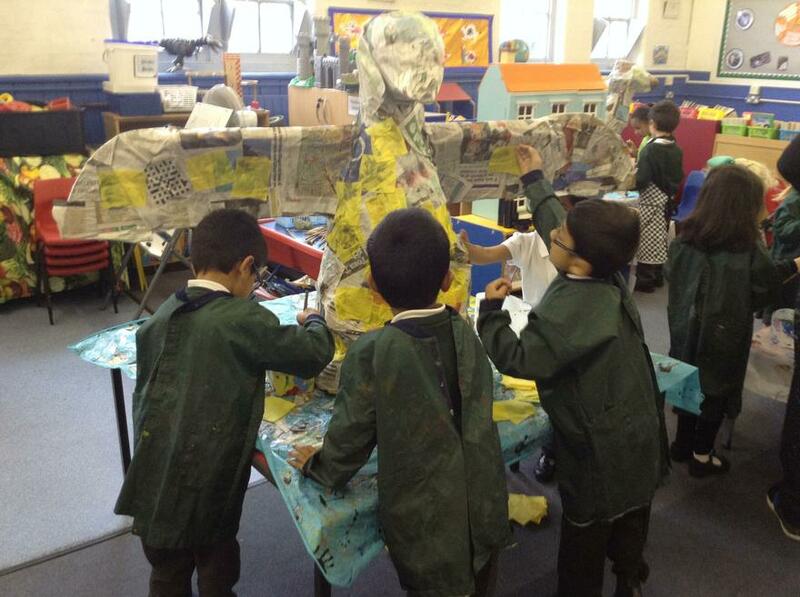 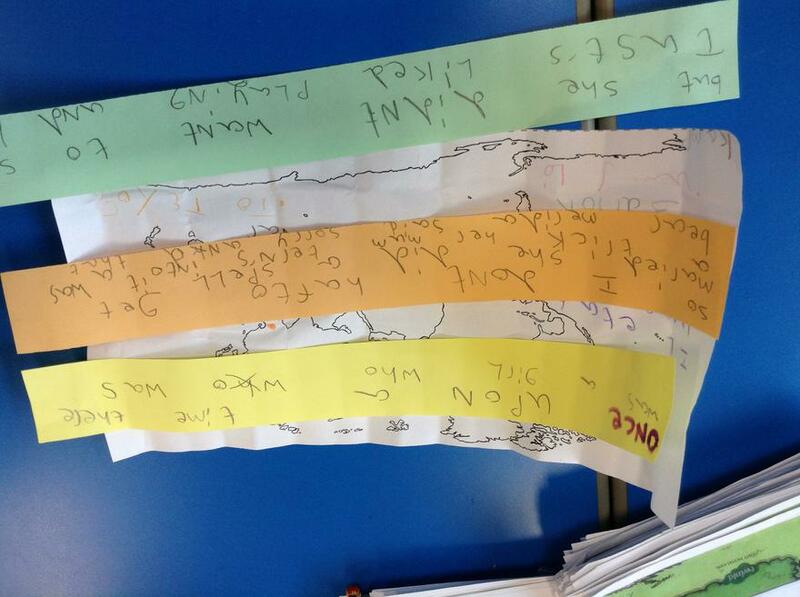 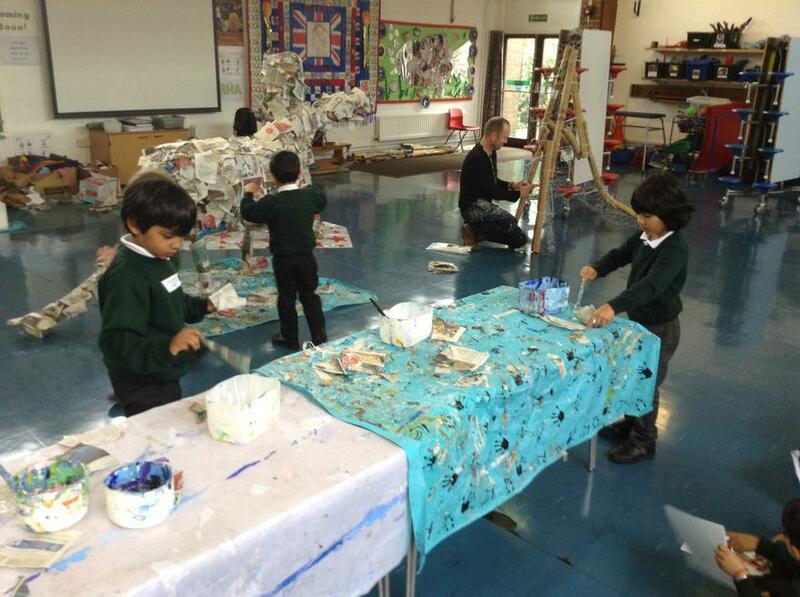 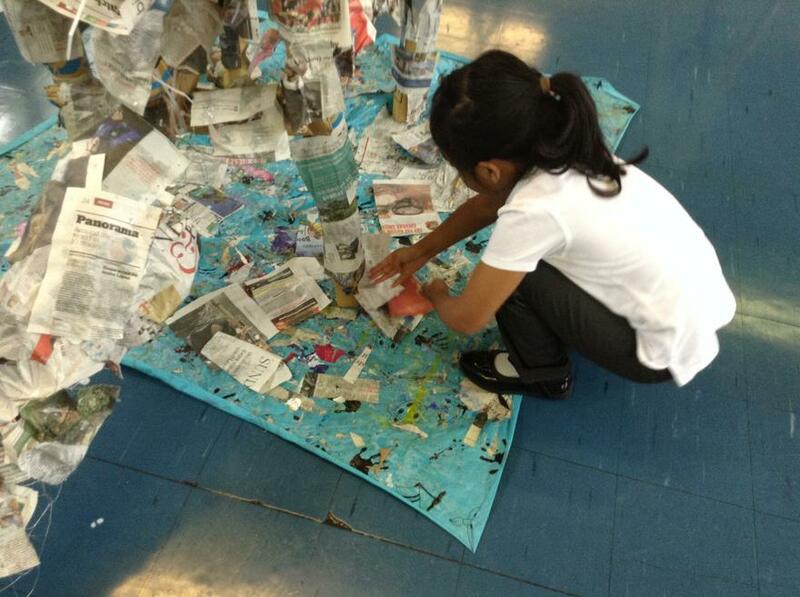 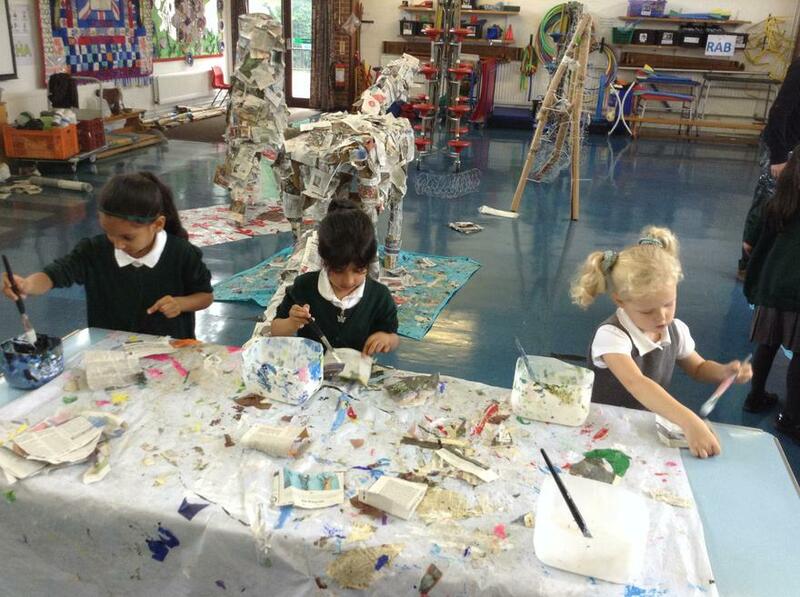 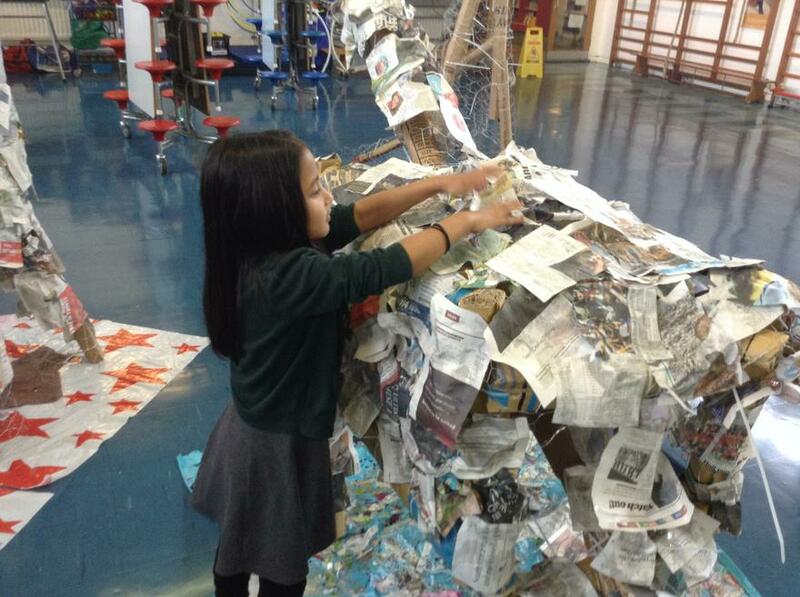 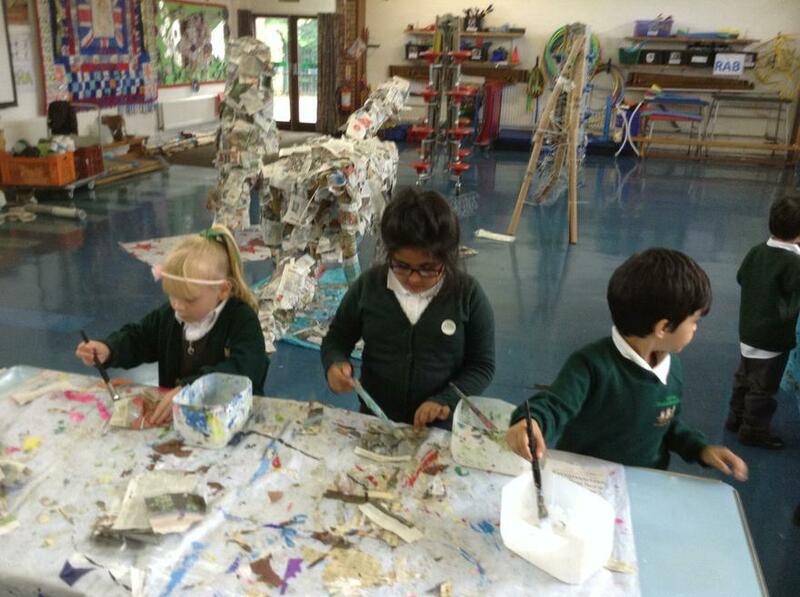 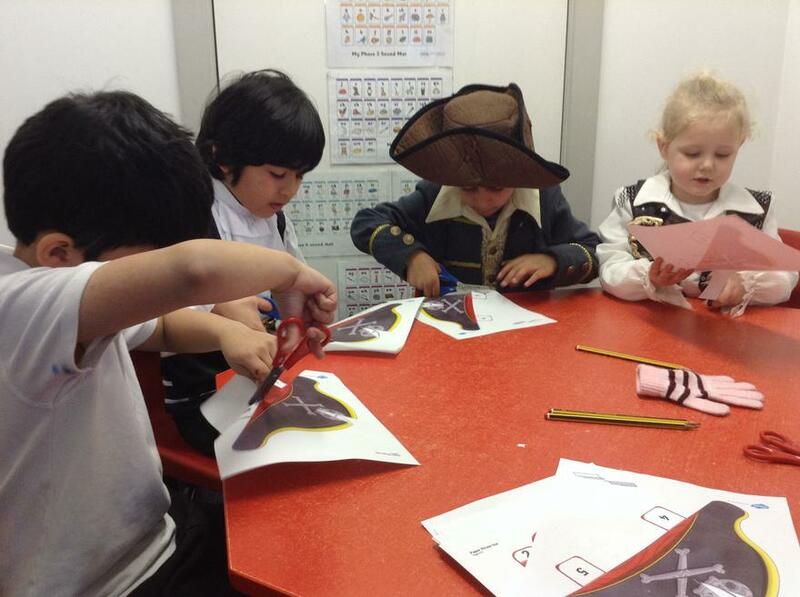 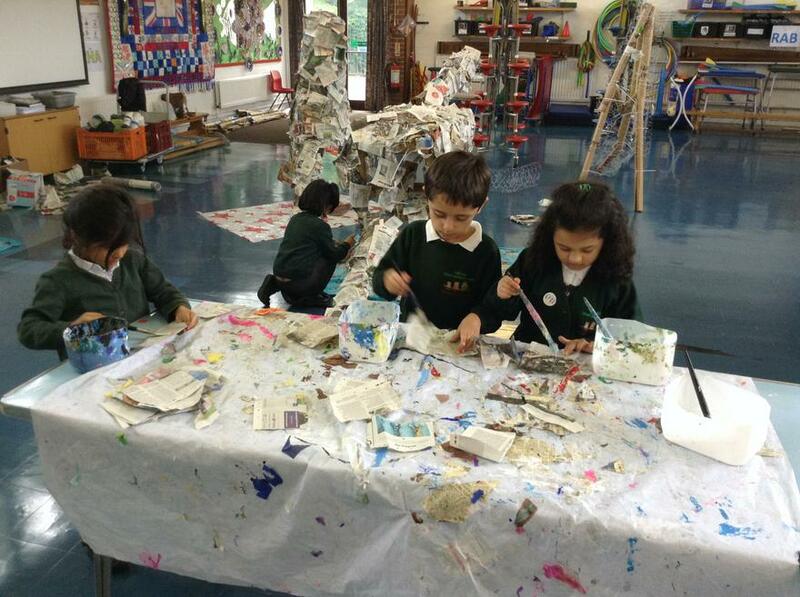 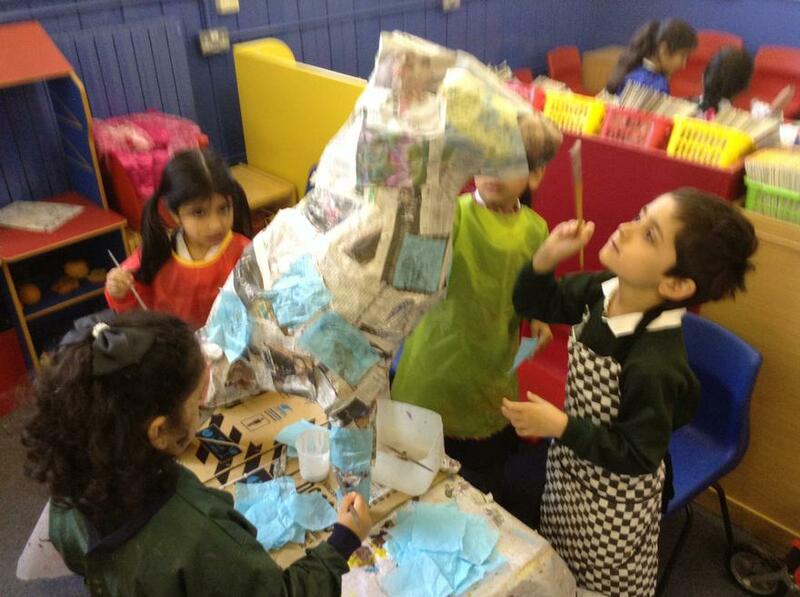 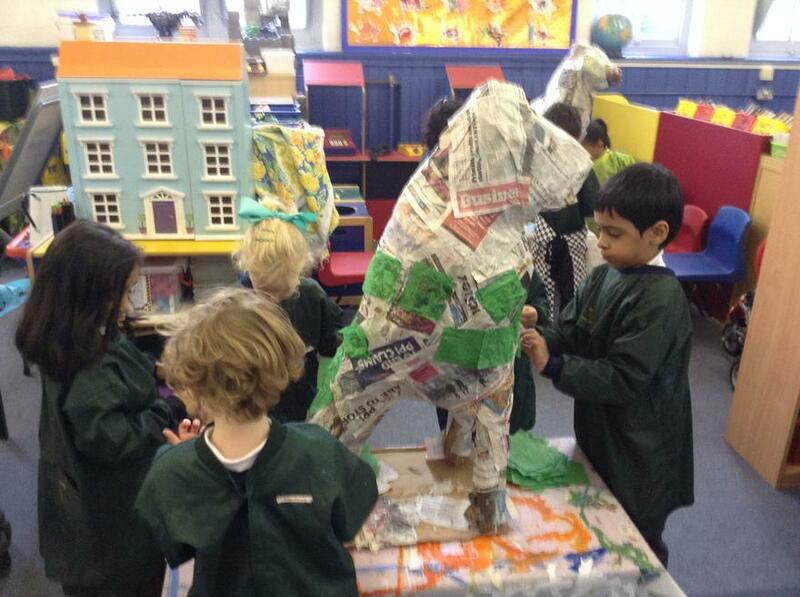 We worked well to get layers of newspaper and tissue all flat and smooth but it was tricky work! 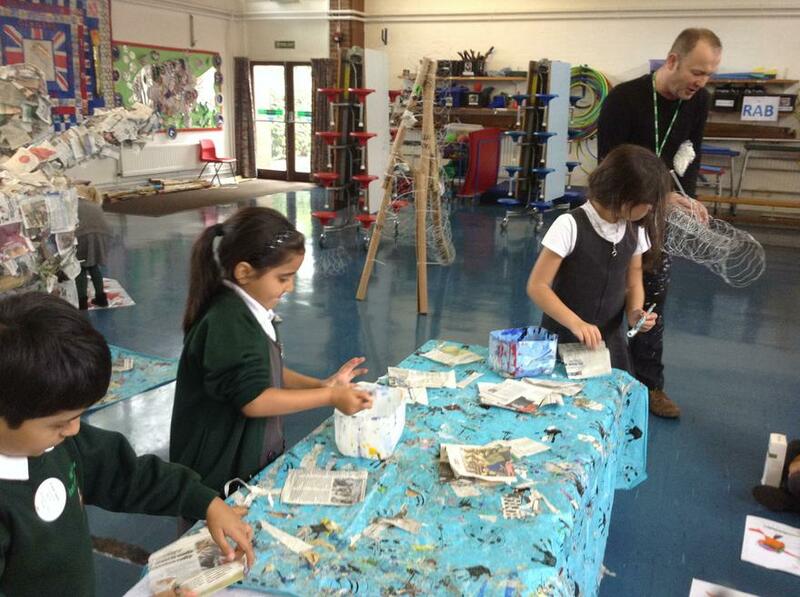 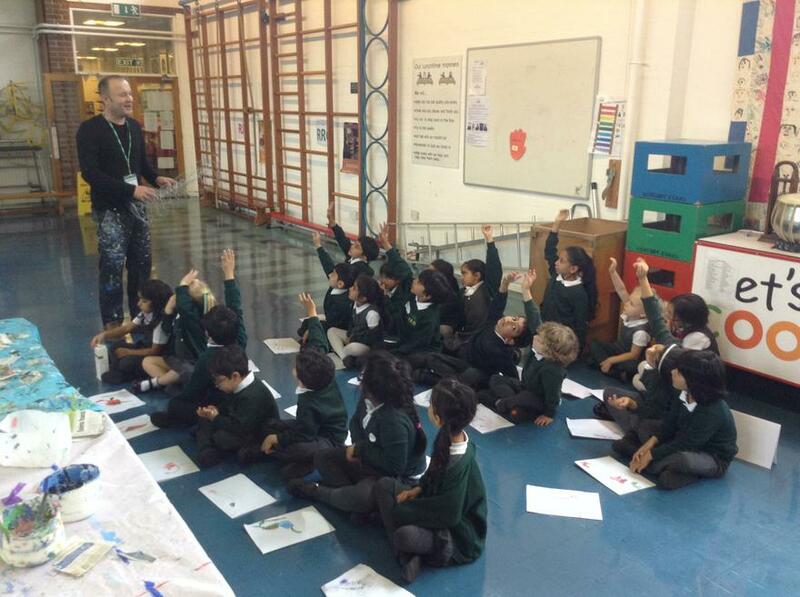 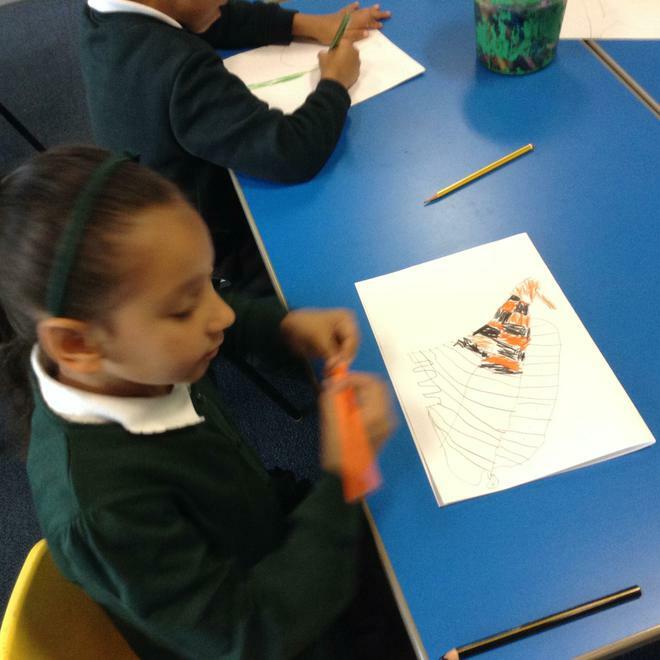 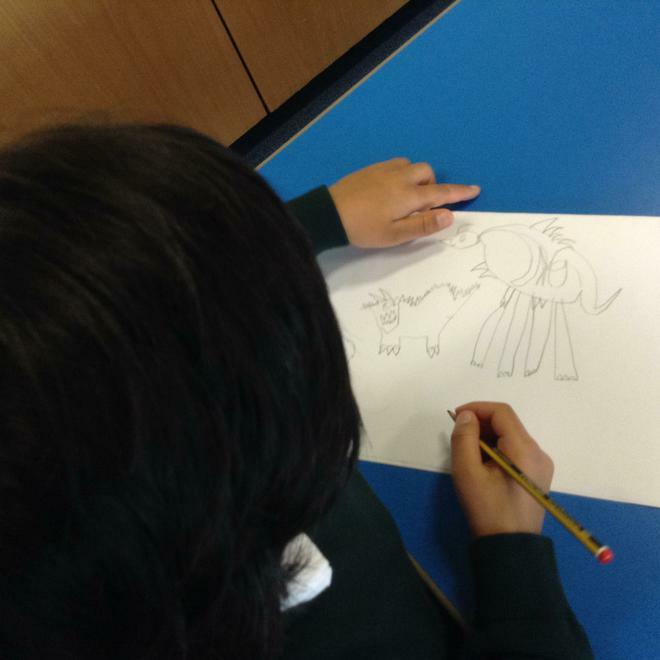 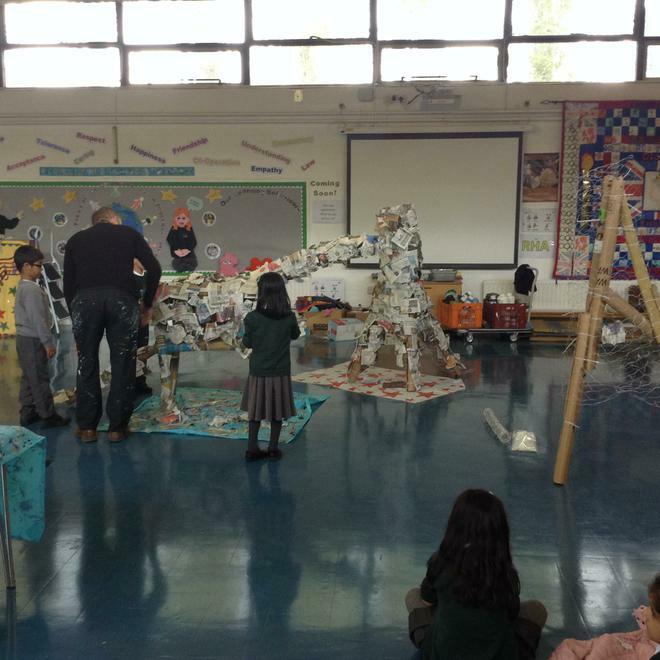 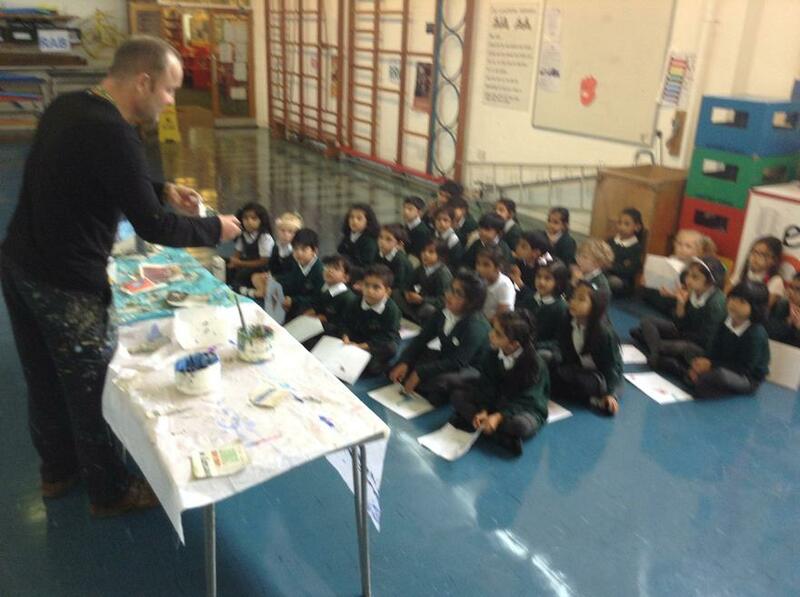 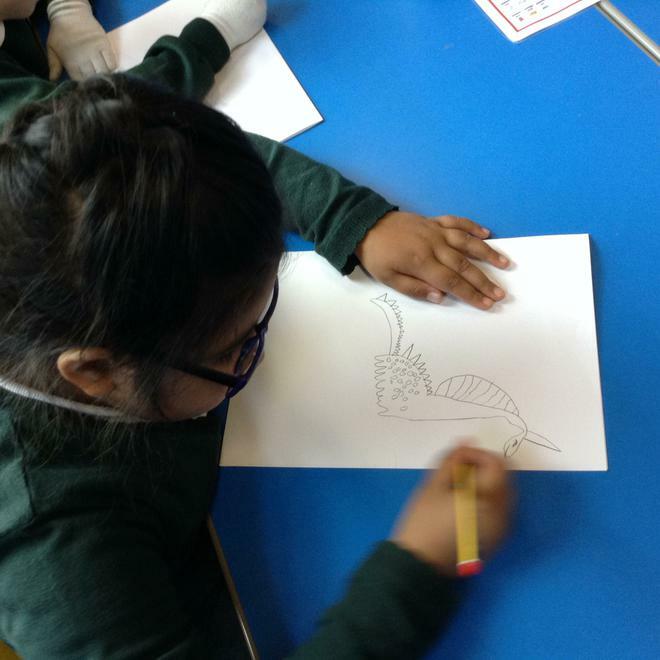 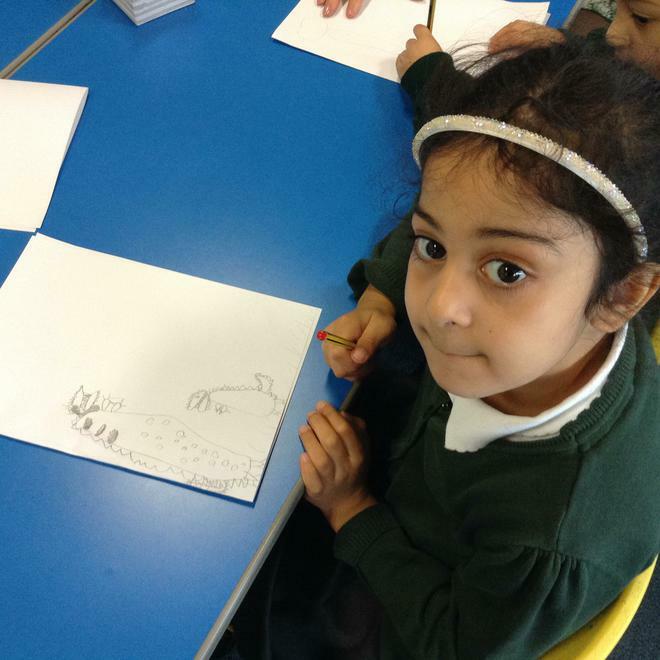 This week we met our artist in residence, Steve. 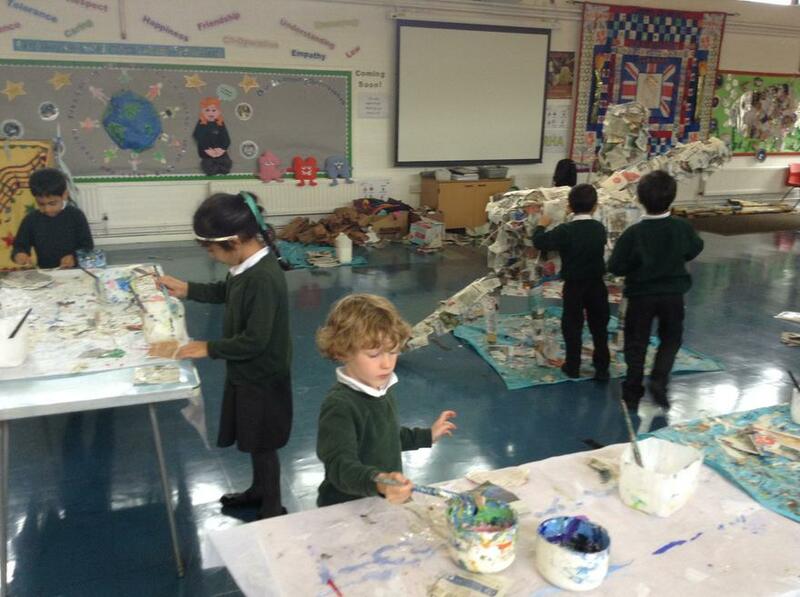 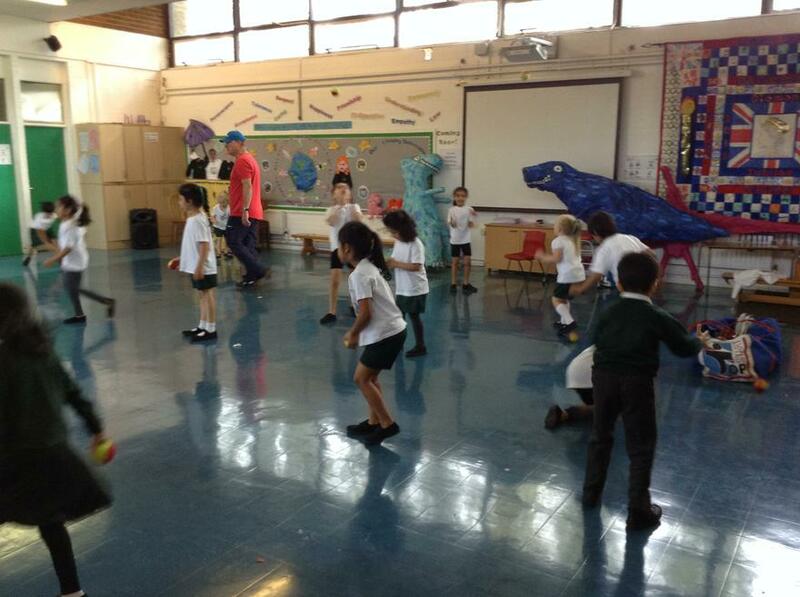 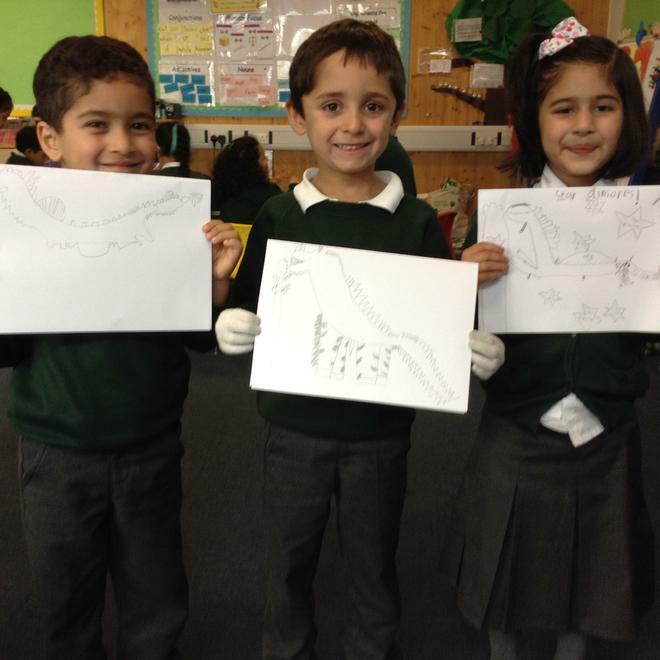 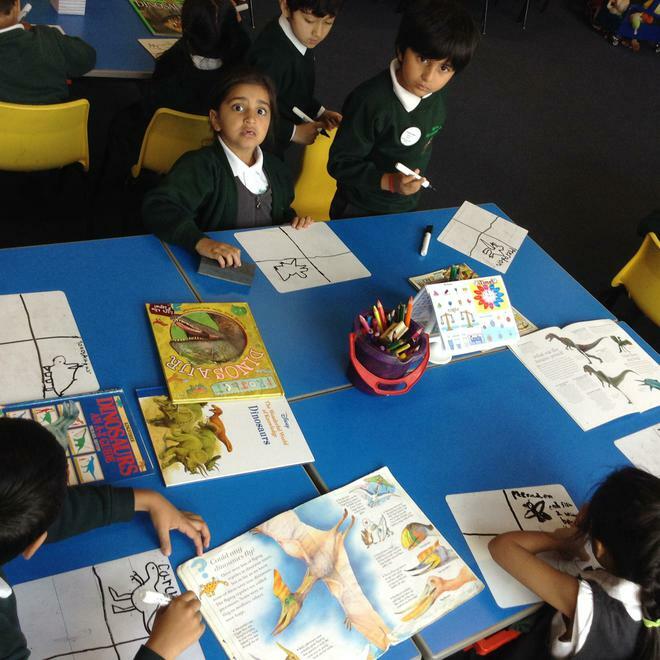 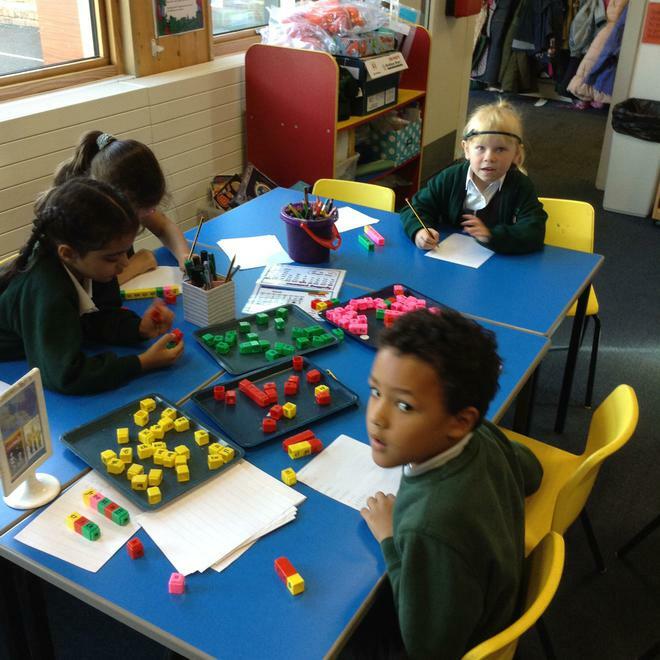 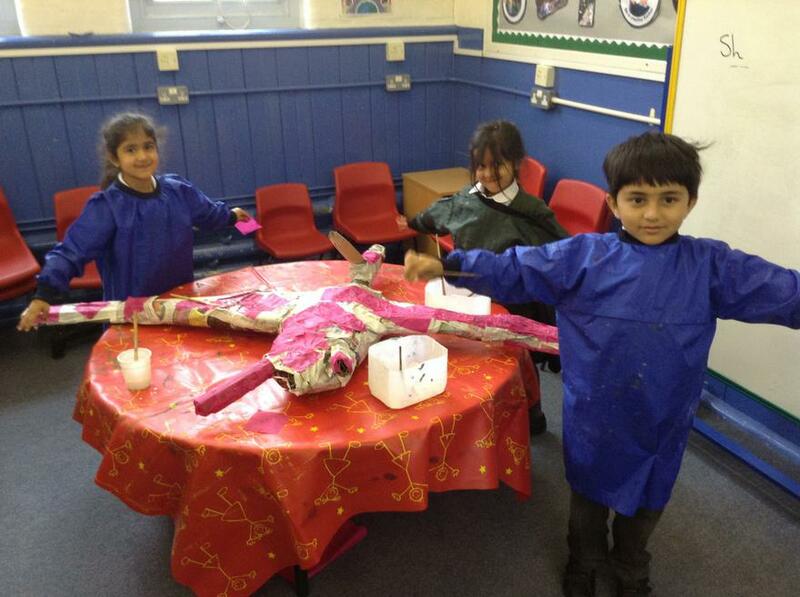 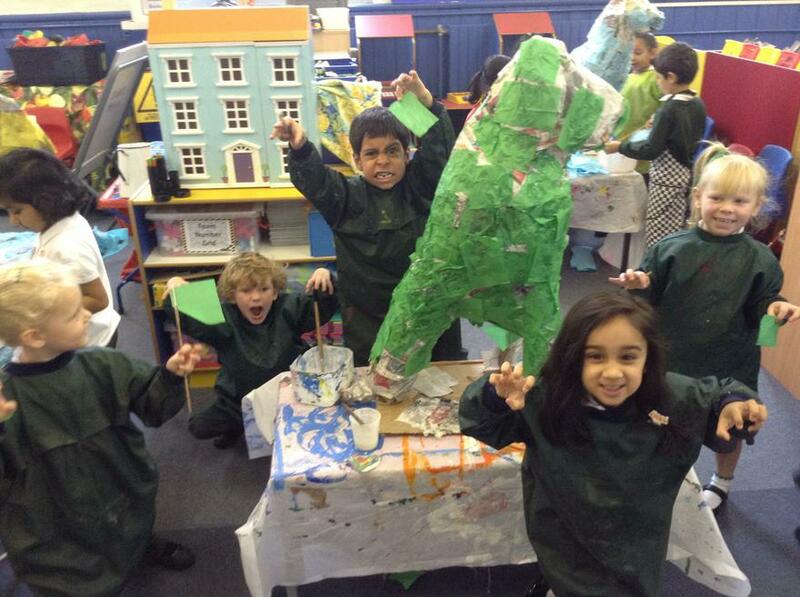 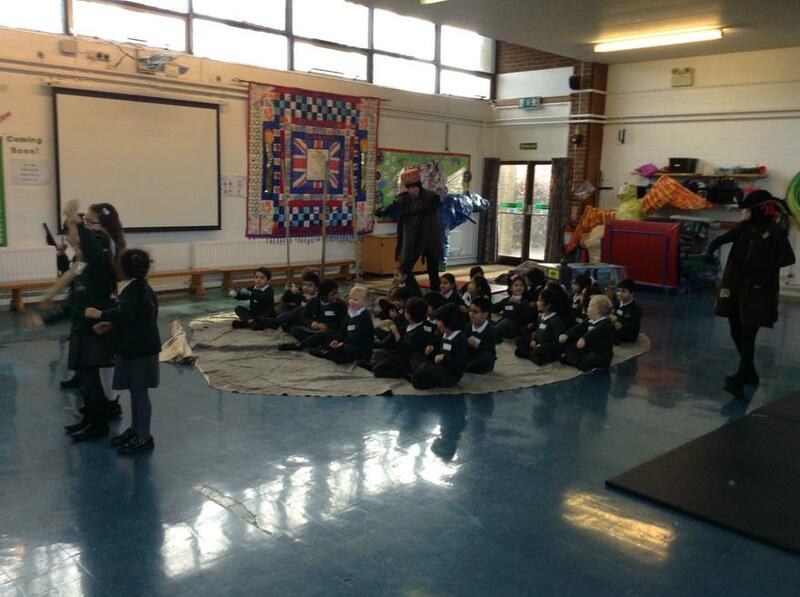 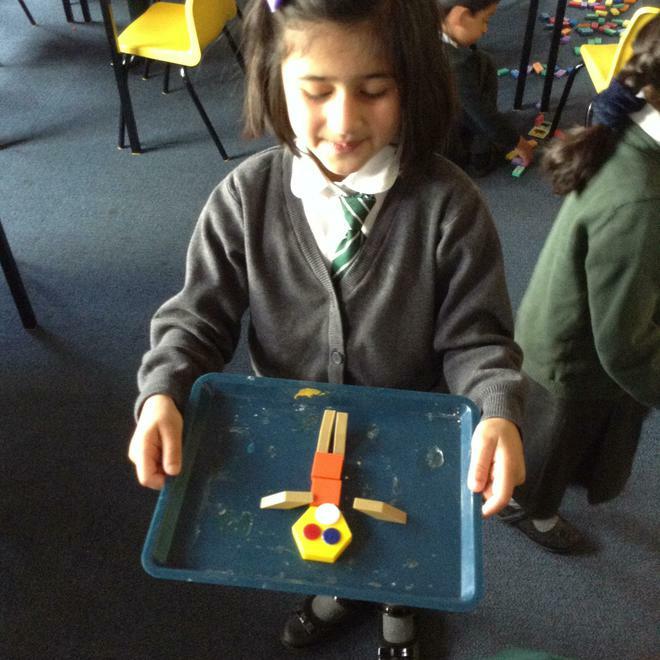 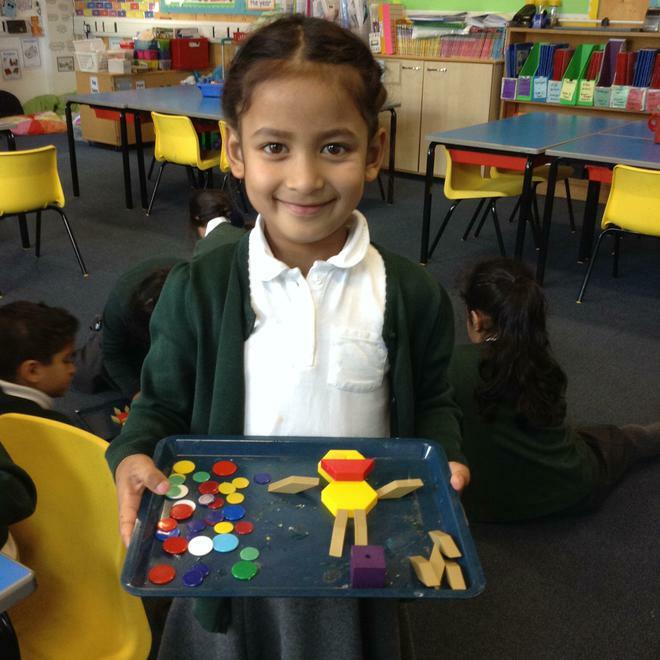 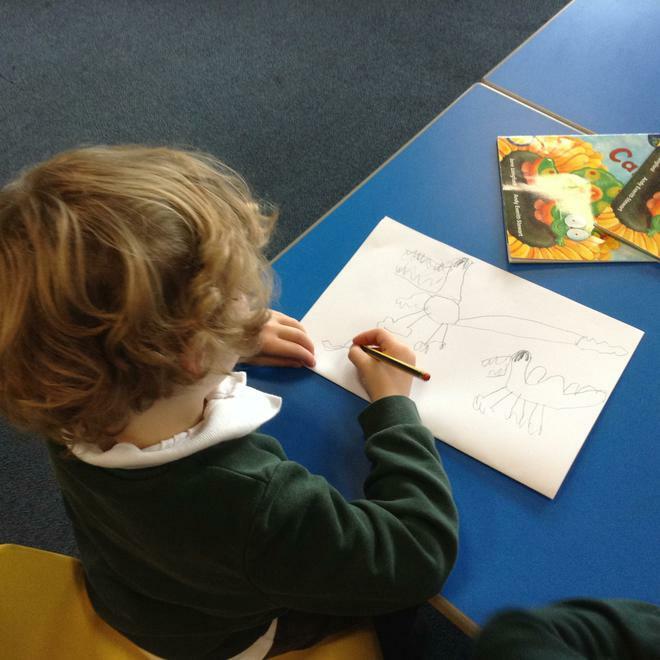 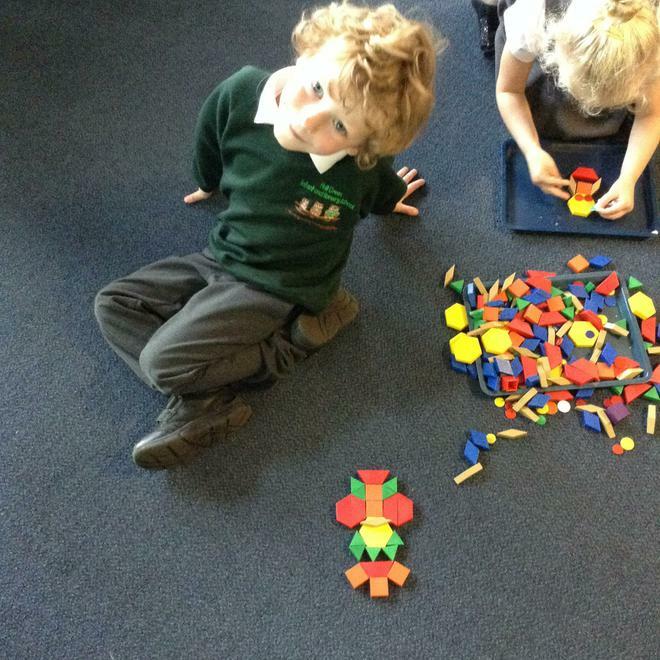 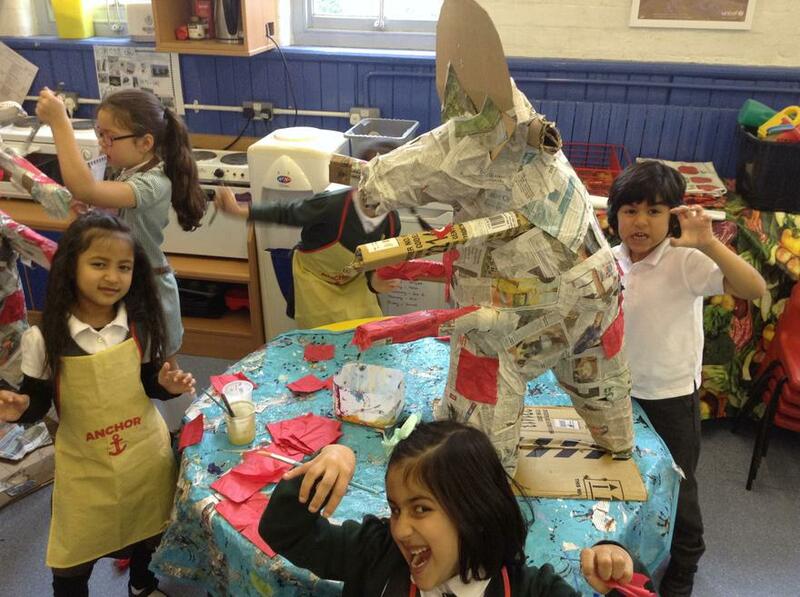 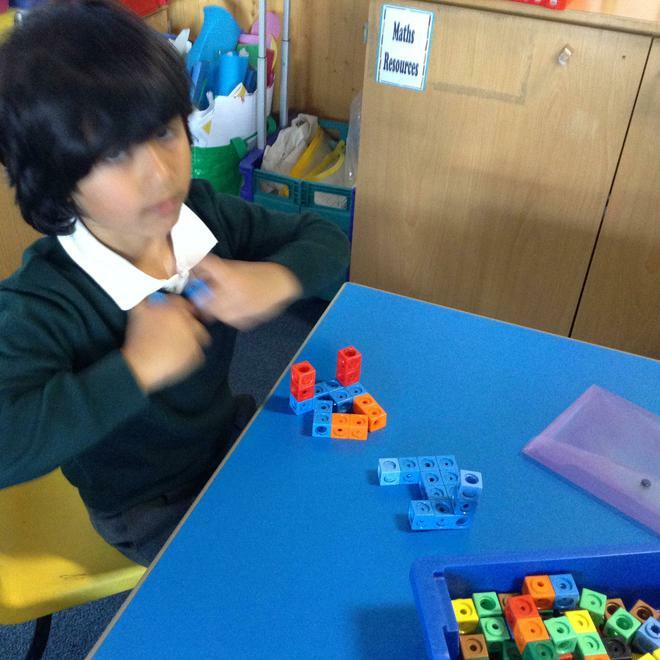 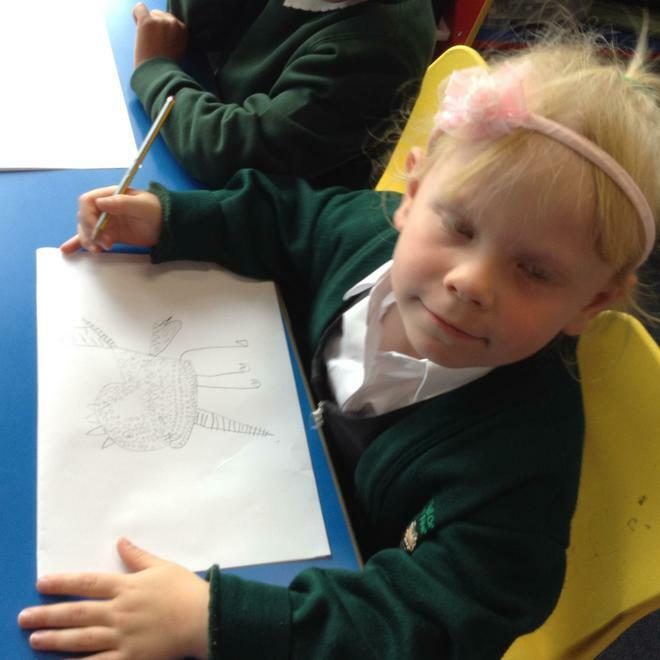 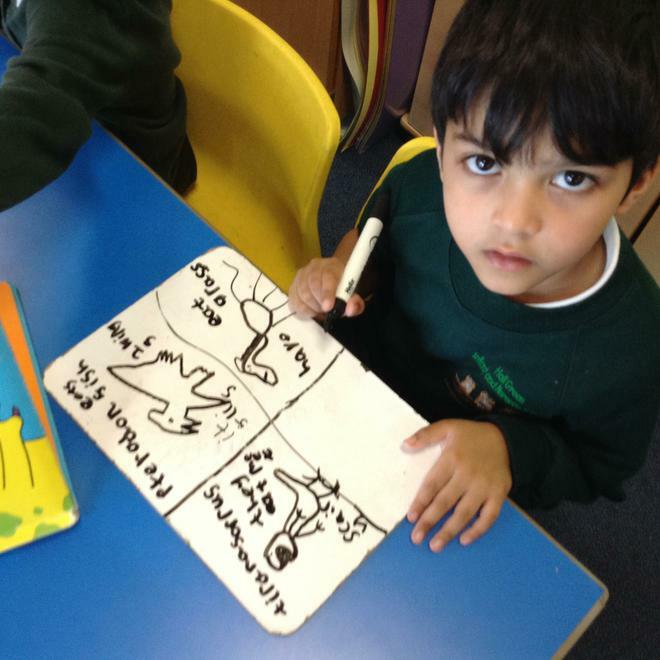 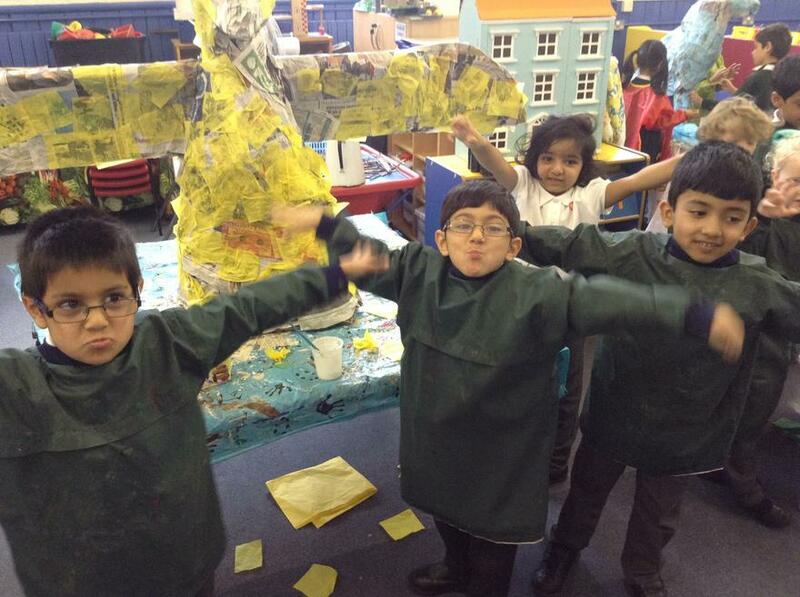 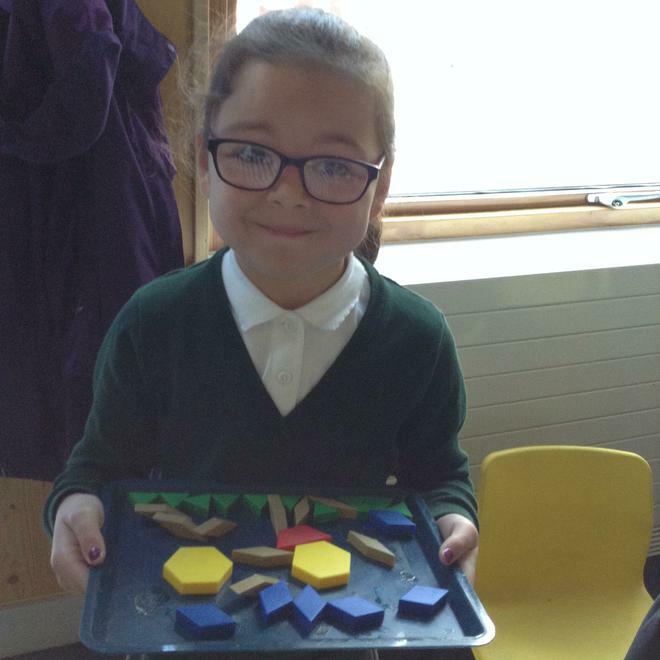 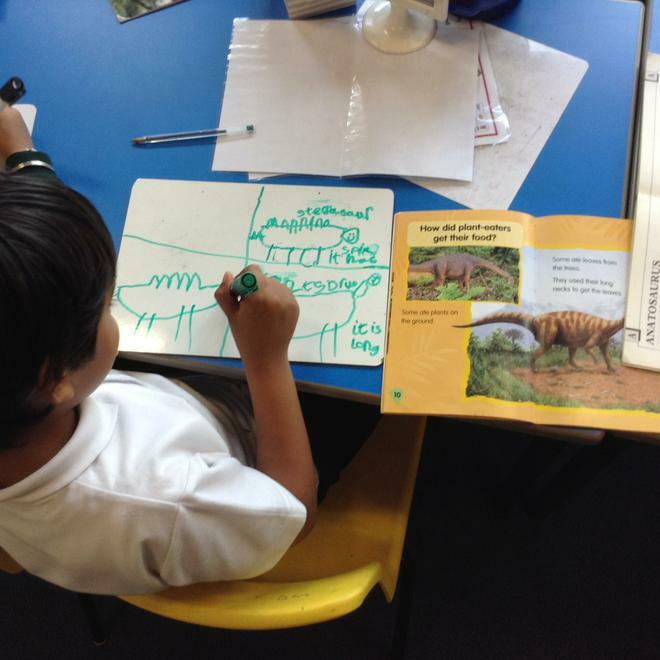 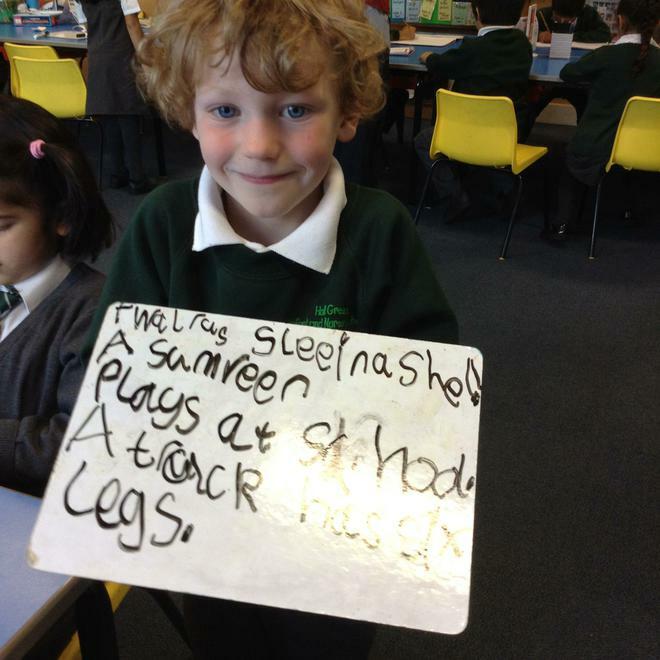 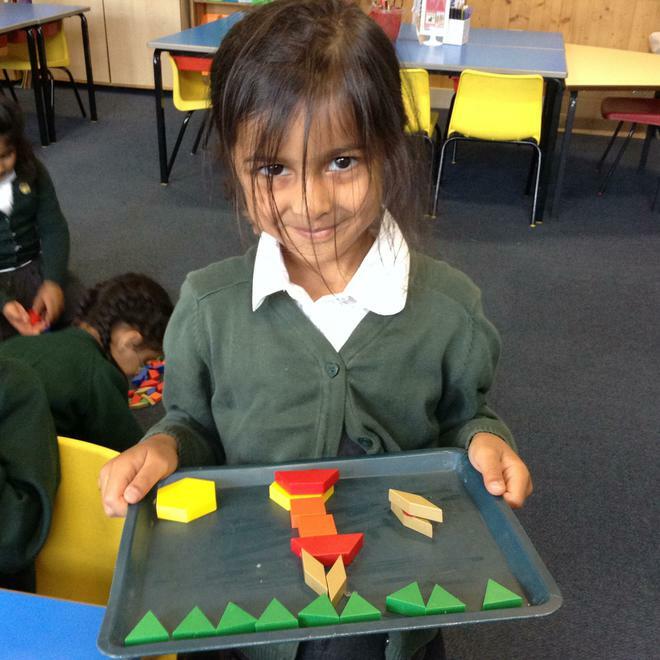 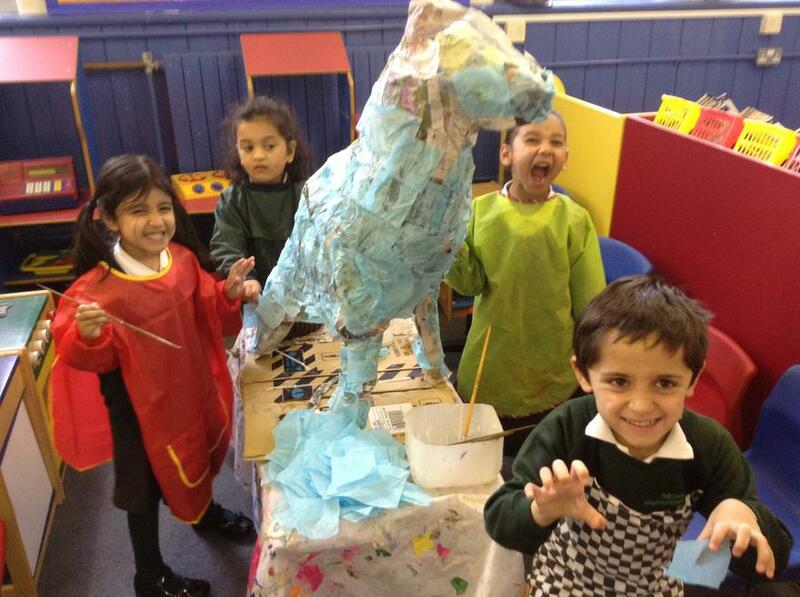 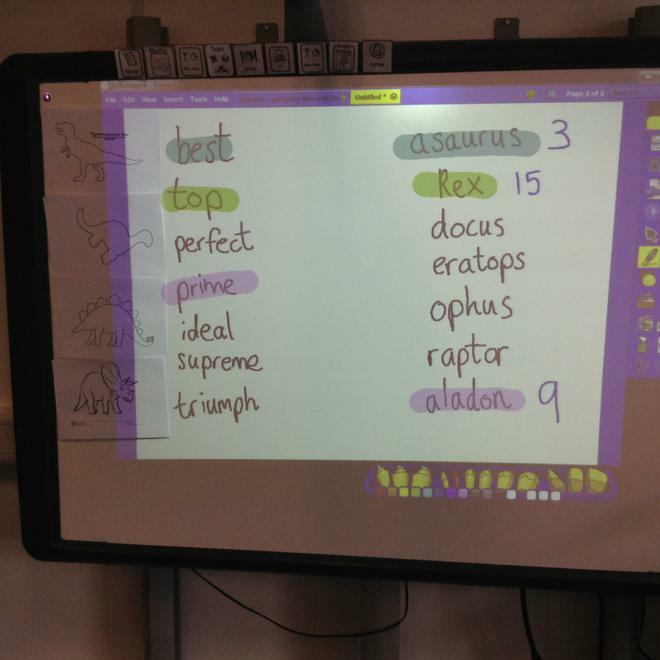 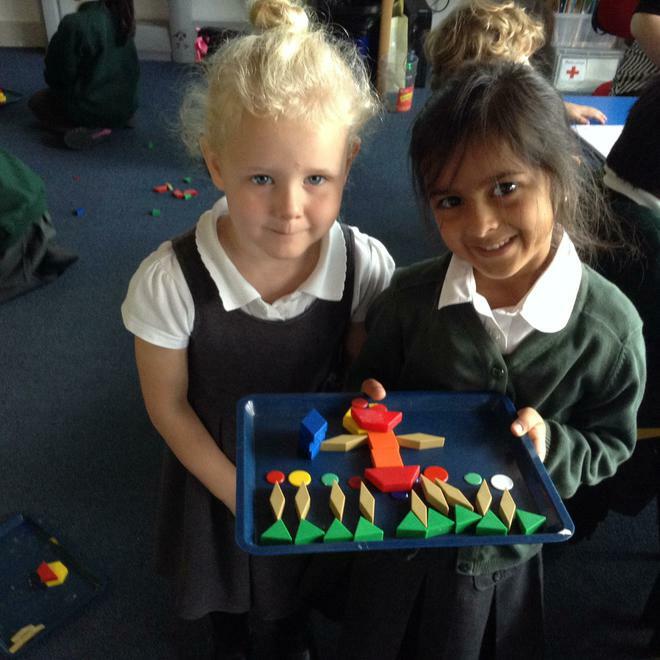 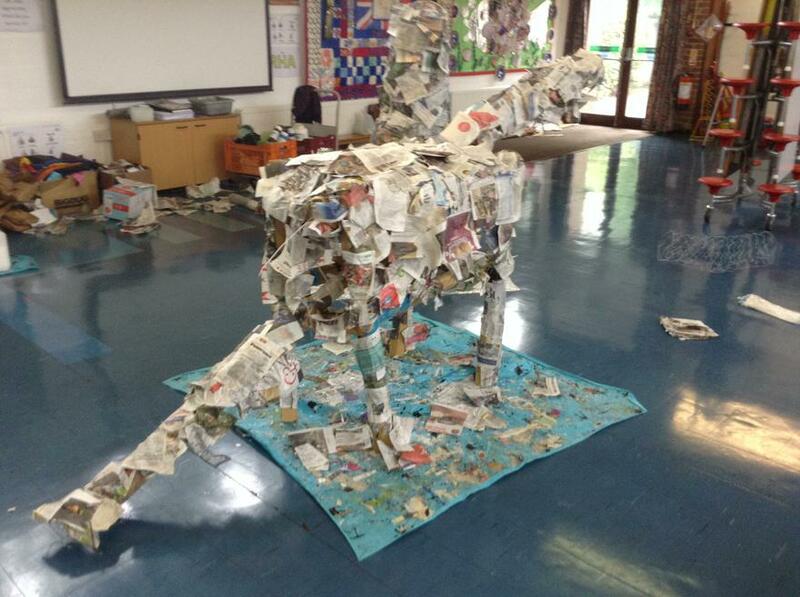 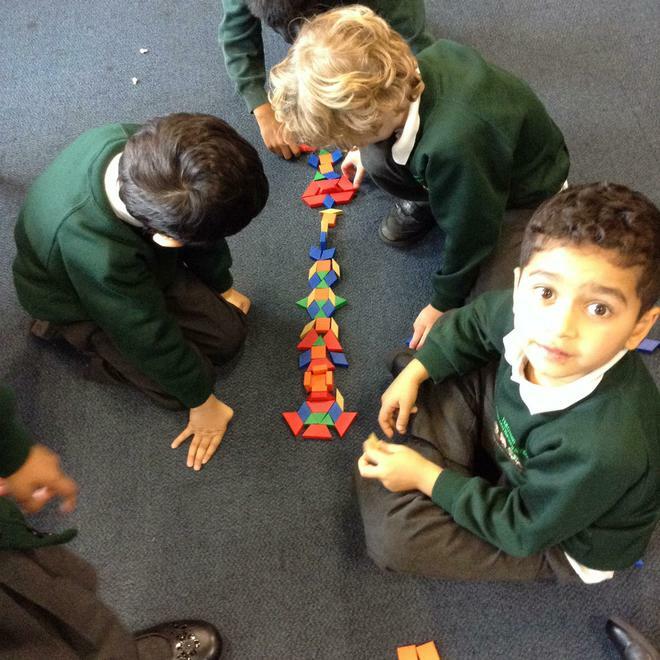 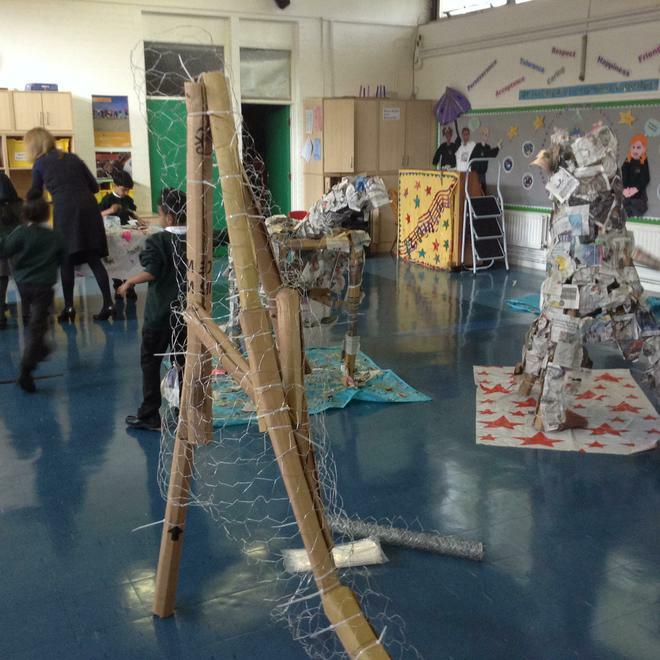 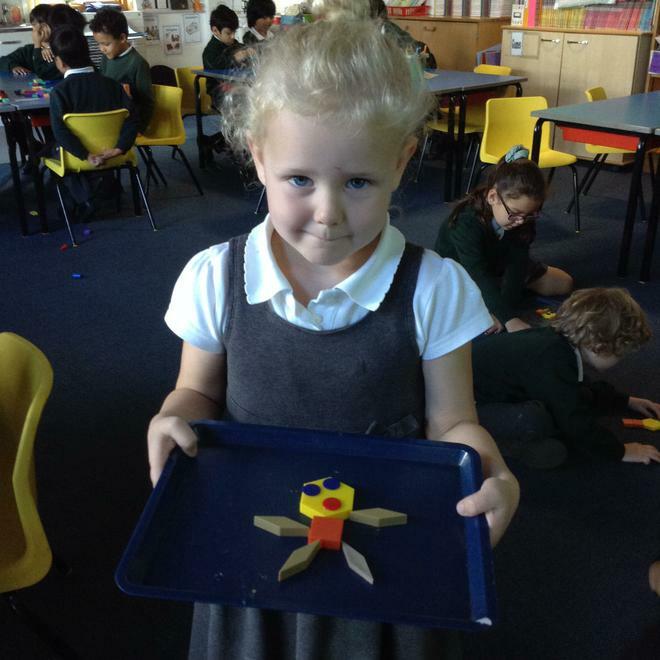 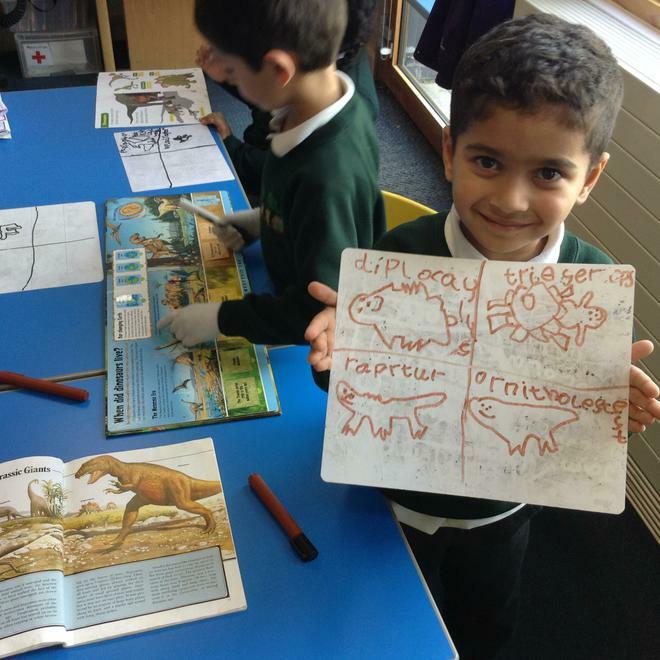 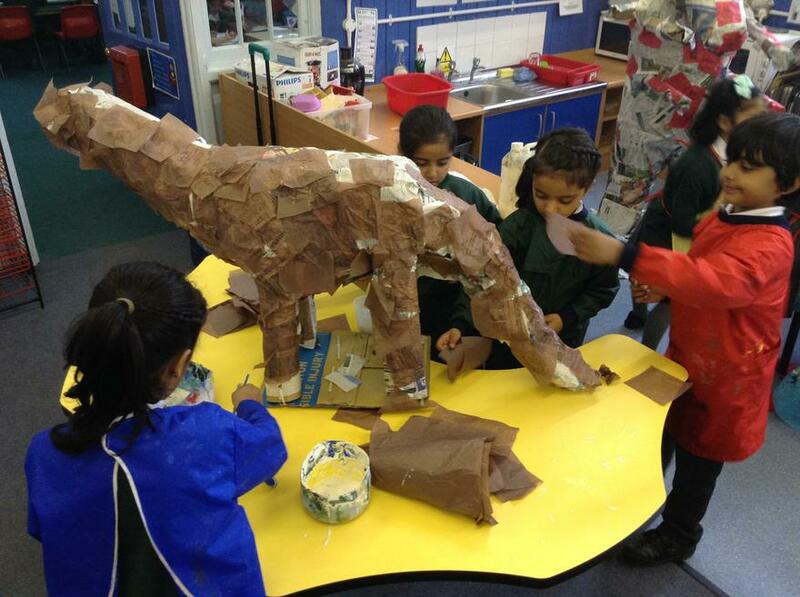 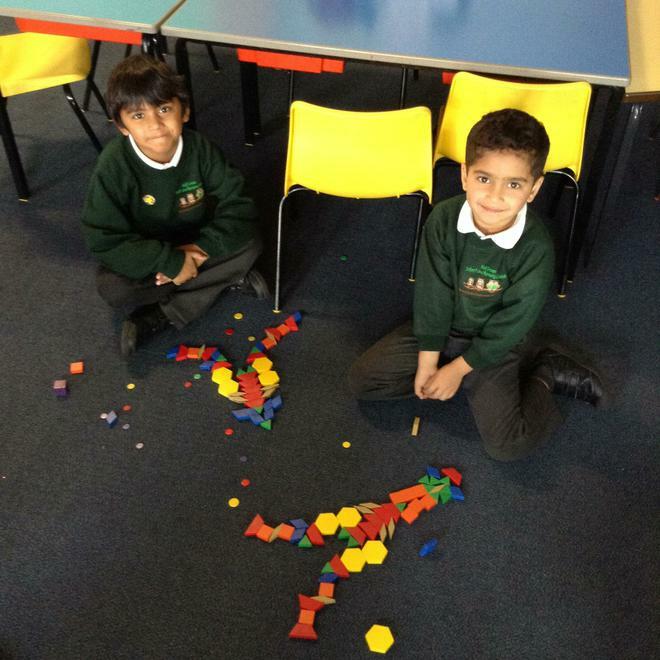 He helped us to make some huge dinosaurs to match with the learning behaviours we have been talking about. 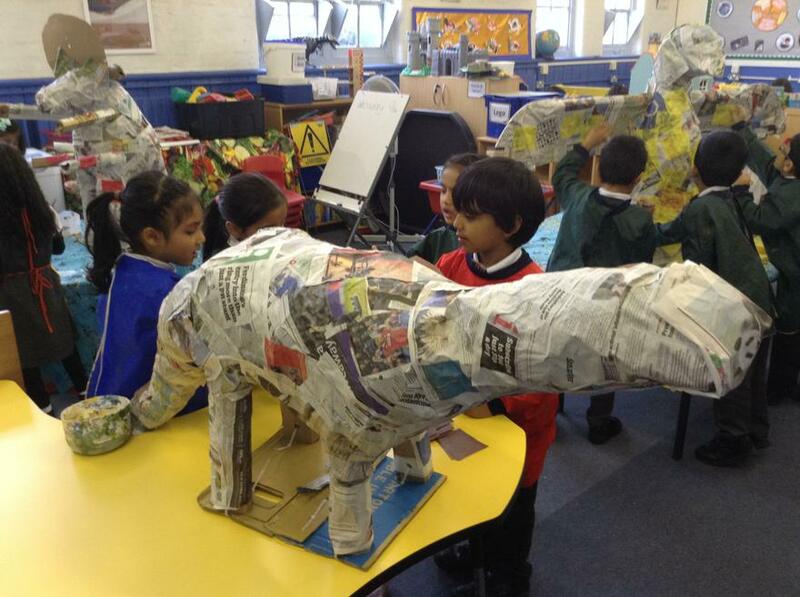 First we had to design what TOP REX might look like, the Steve helped us create a real one with cardboard, wires and newspaper. 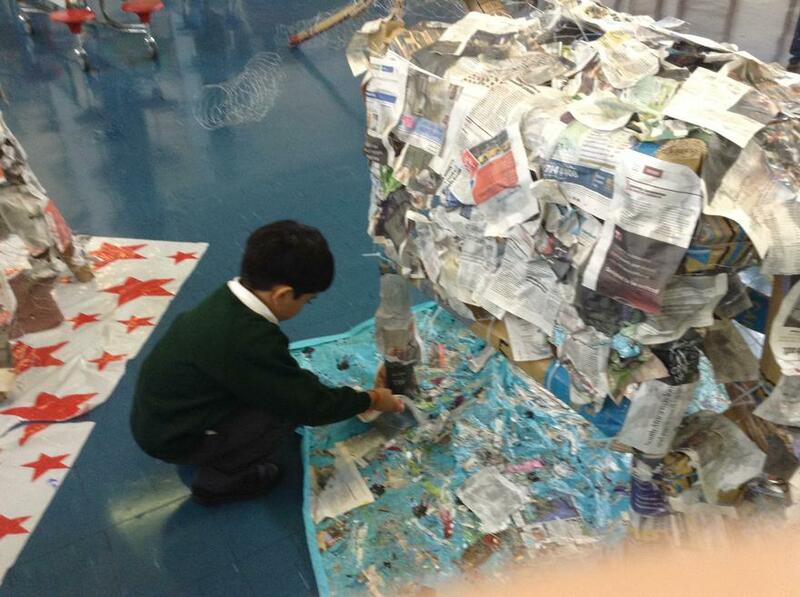 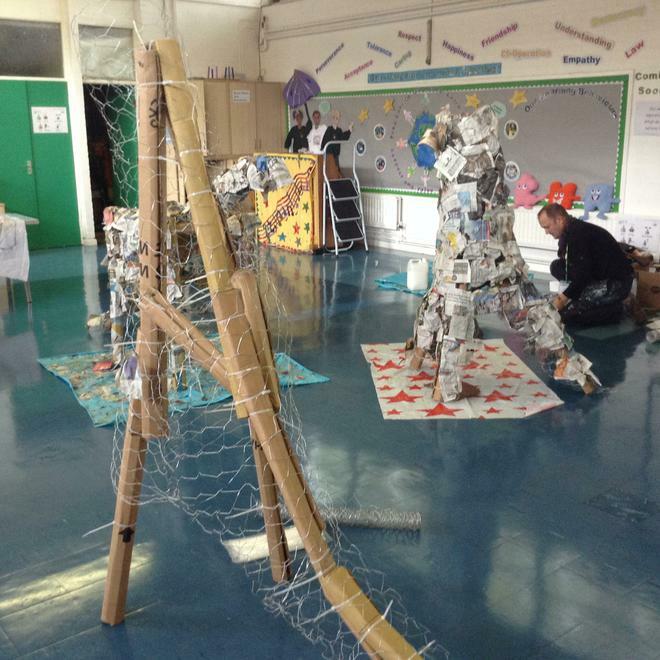 We got really sticky gluing it all together but we think it is starting to look amazing! 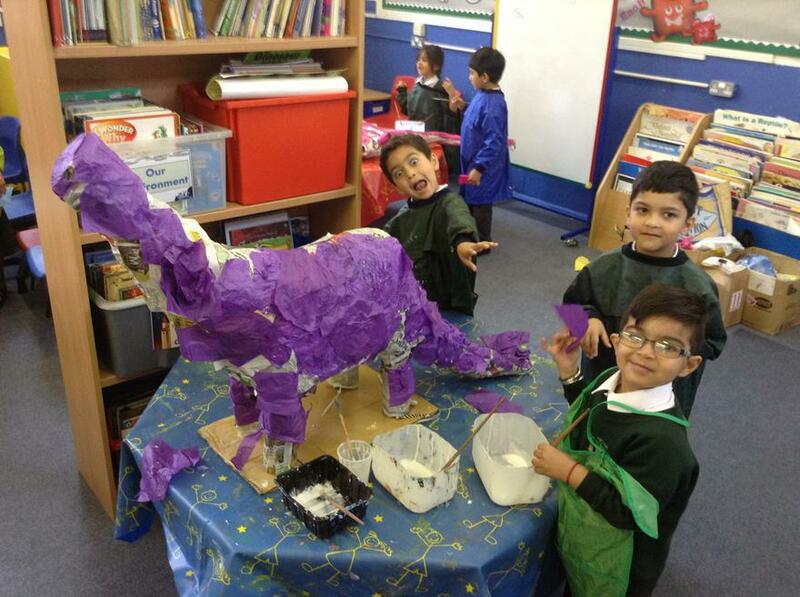 We can't wait to see what all the dinosaurs finally look like. 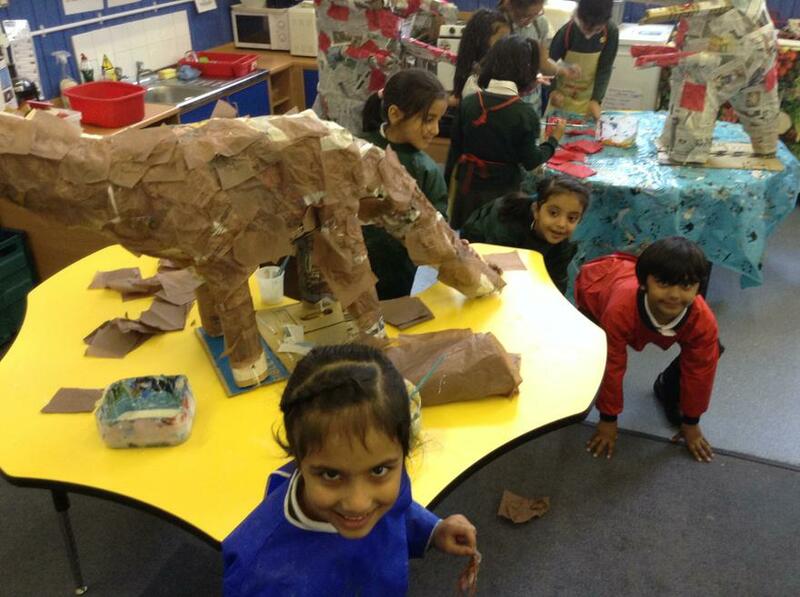 ROOOOAAARRRR! 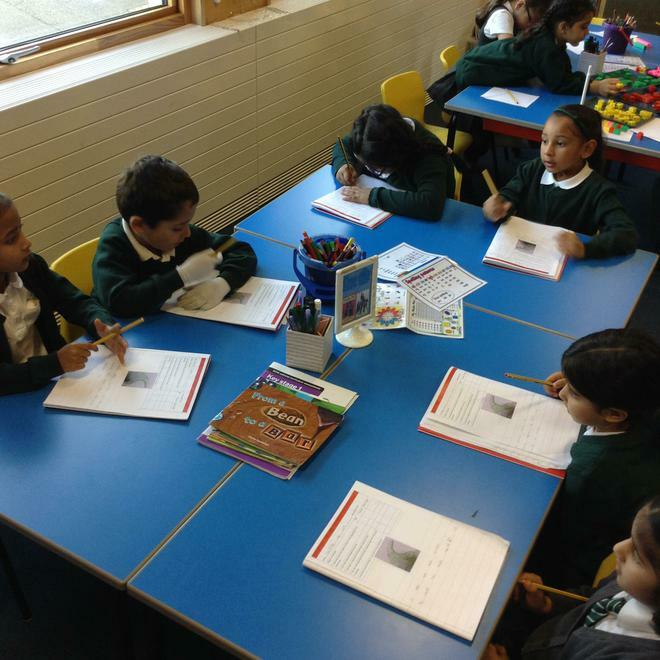 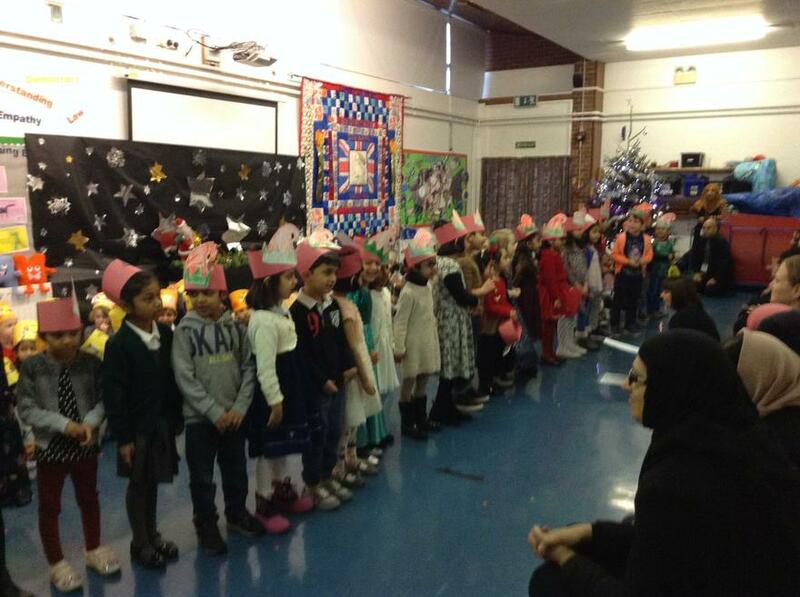 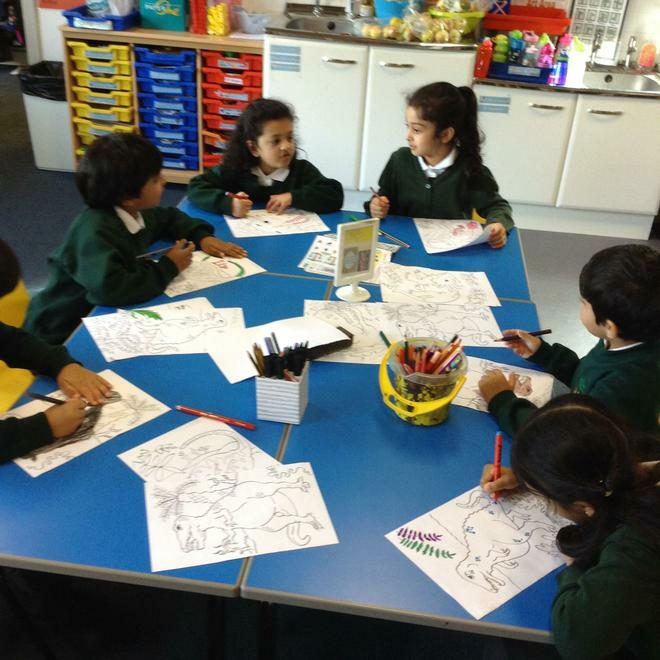 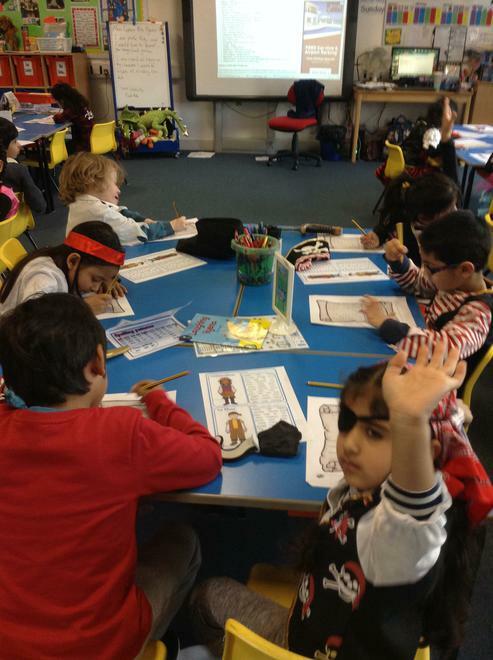 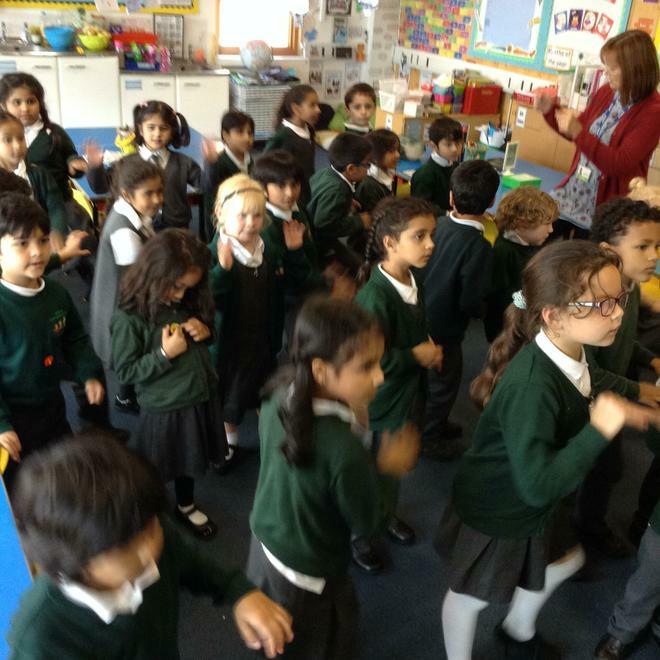 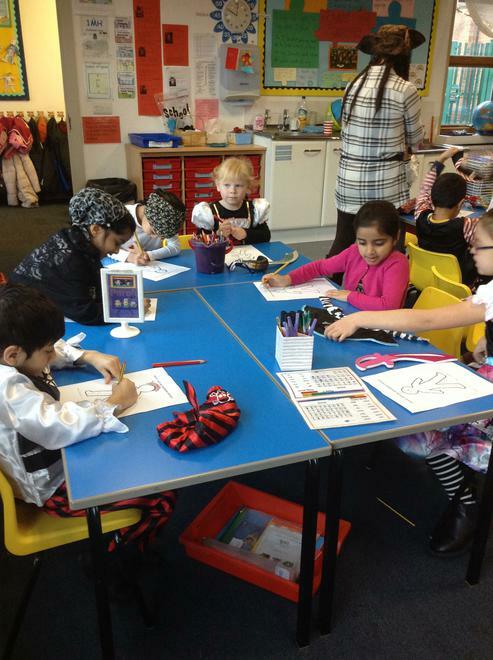 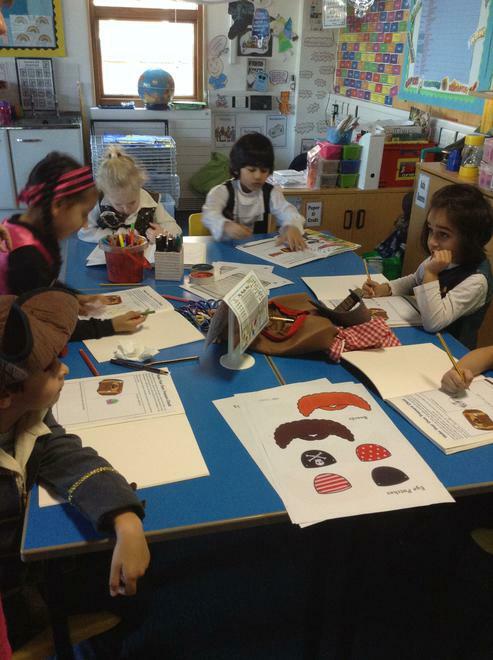 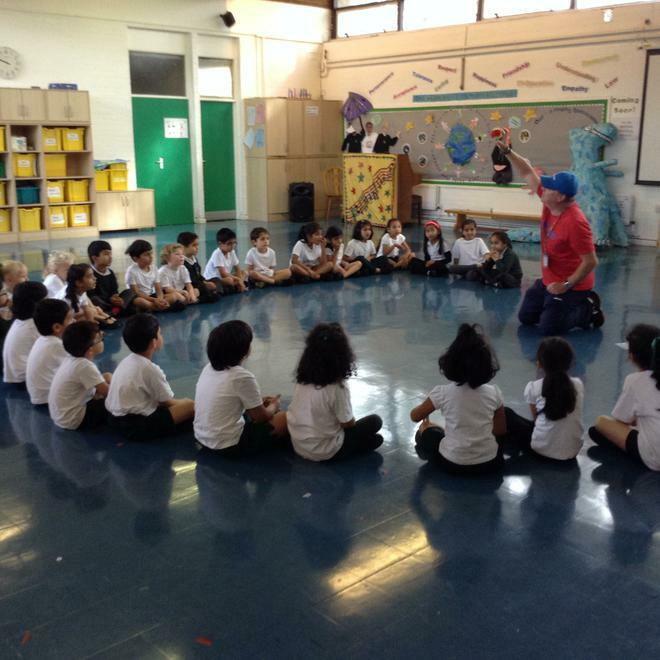 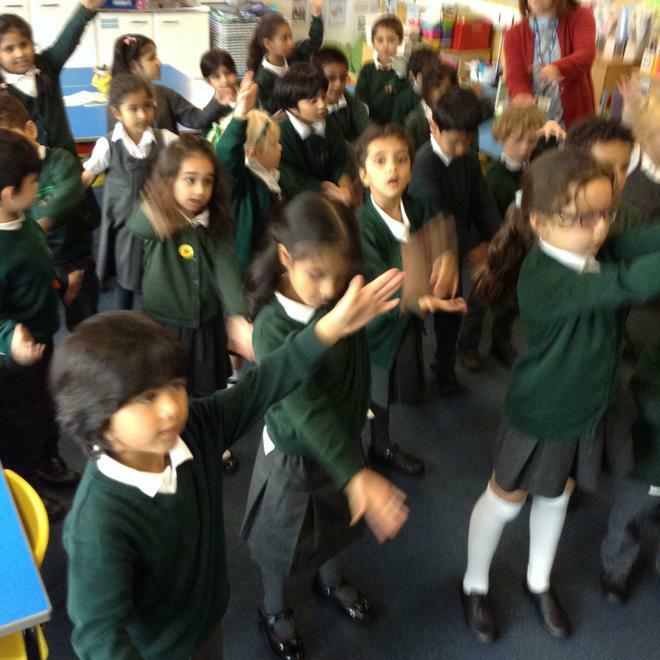 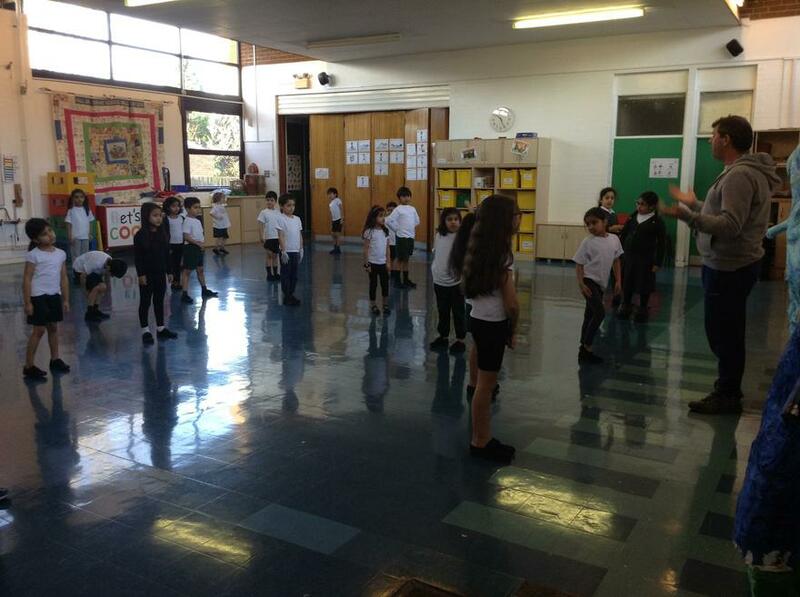 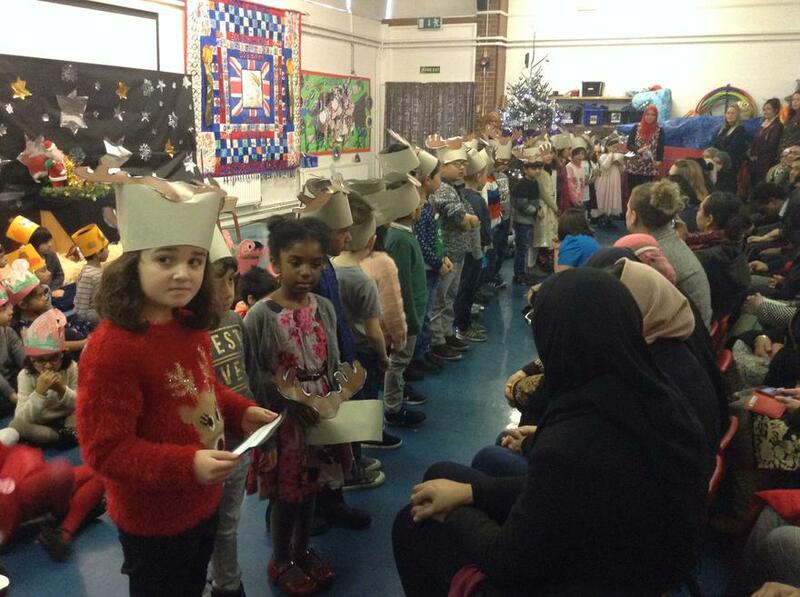 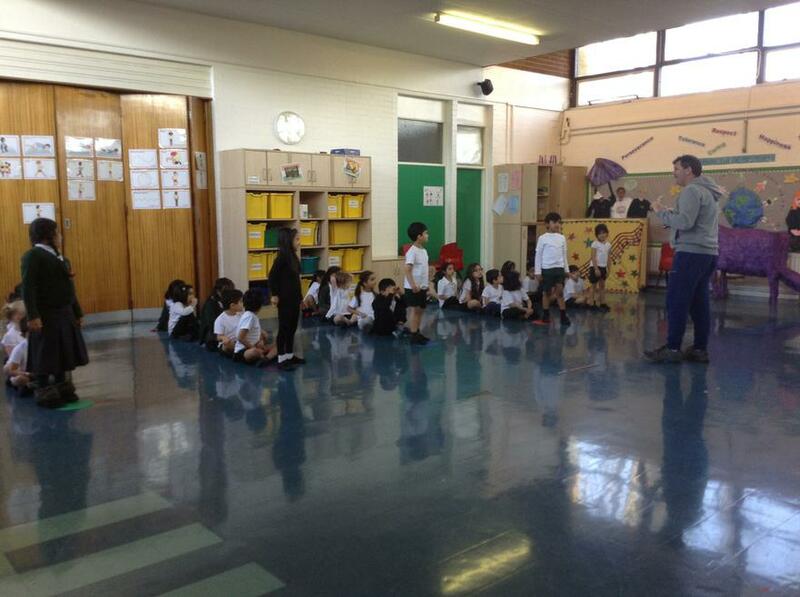 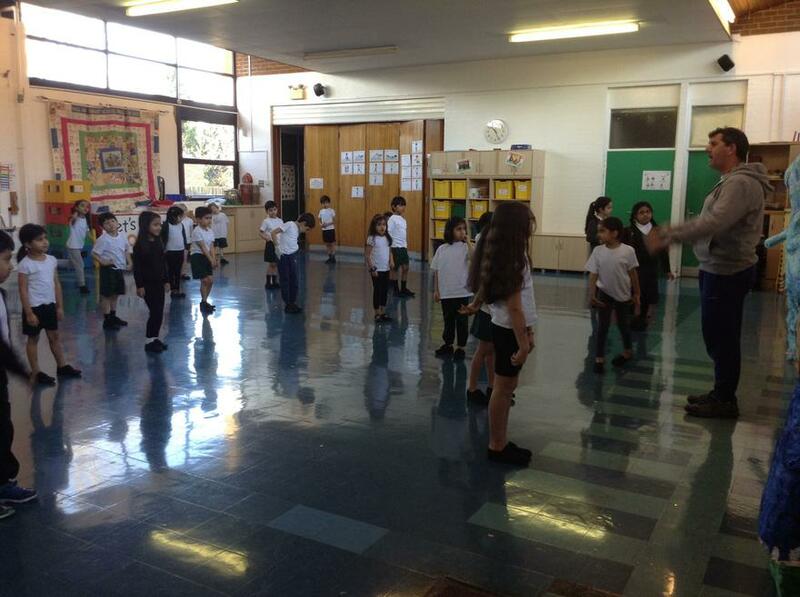 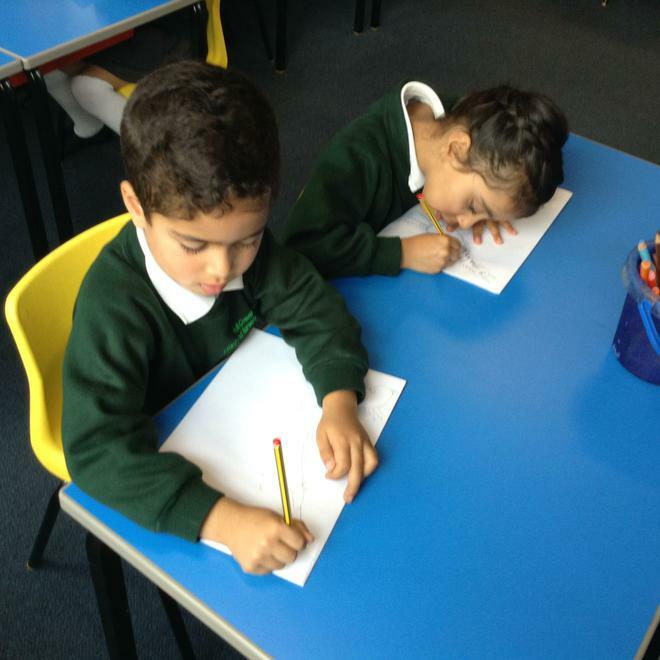 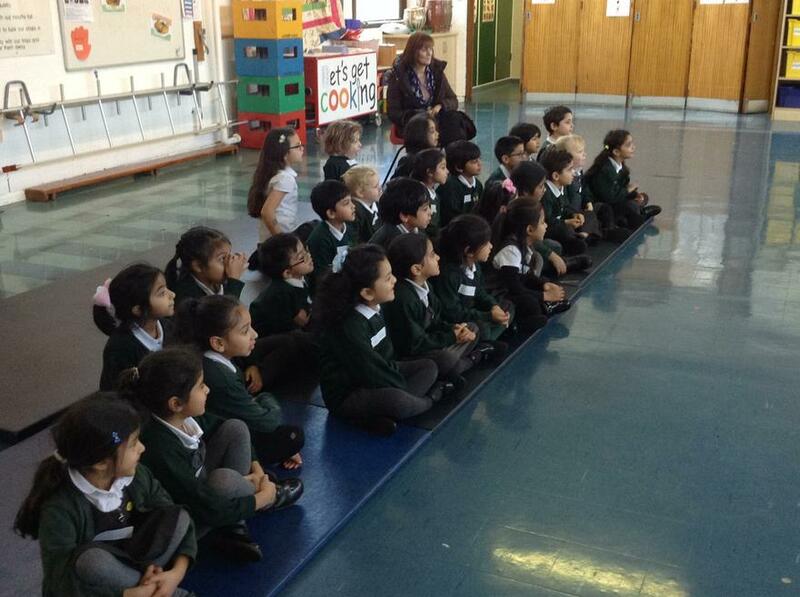 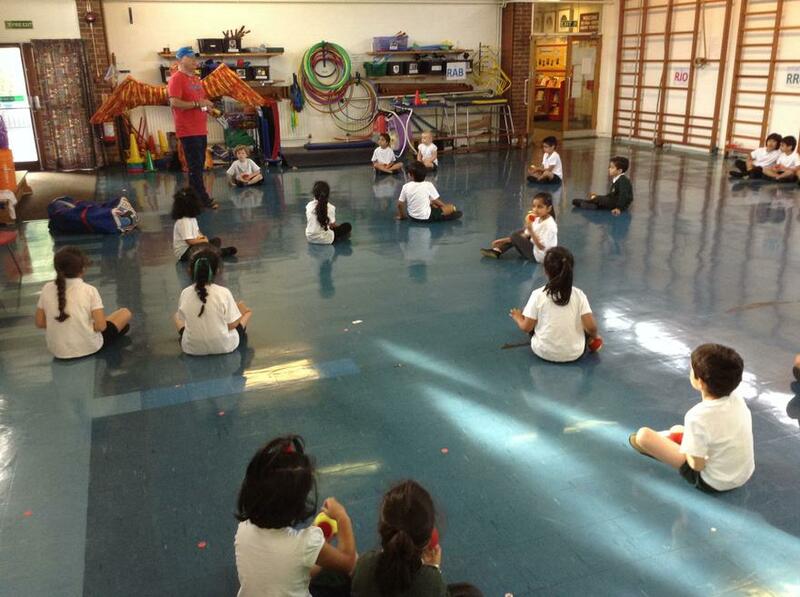 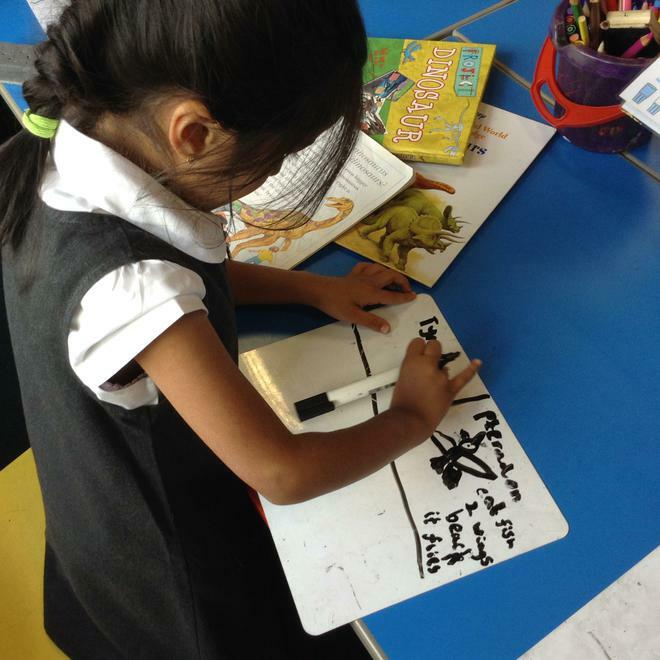 We have started to get to know each other and understand the rules and routines for Year 1. 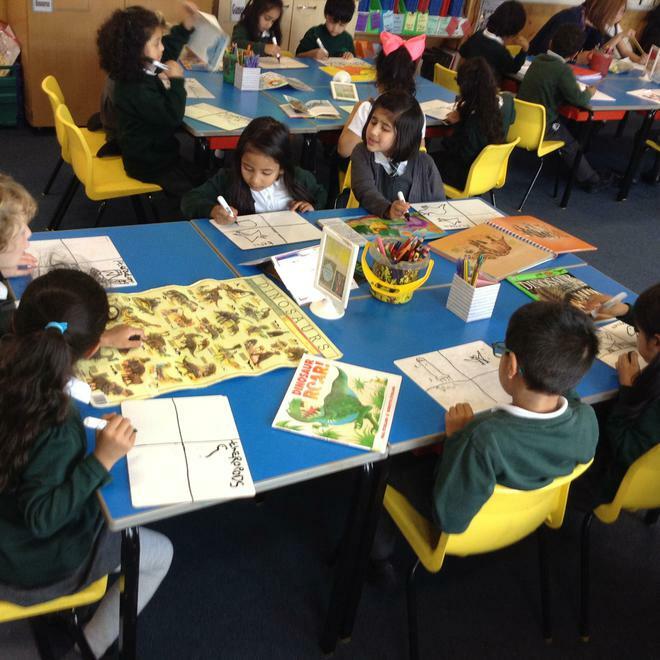 Mrs Dallaway and myself have had a super three days starting to get to know your children! 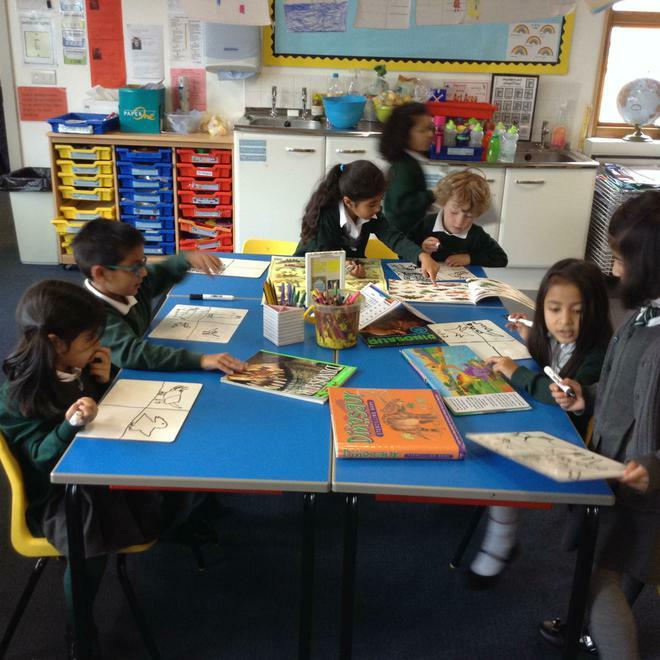 It has been a pleasure to read with them all and you must be so pleased with their fabulous phonic skills Miss O'Neill set them up with. 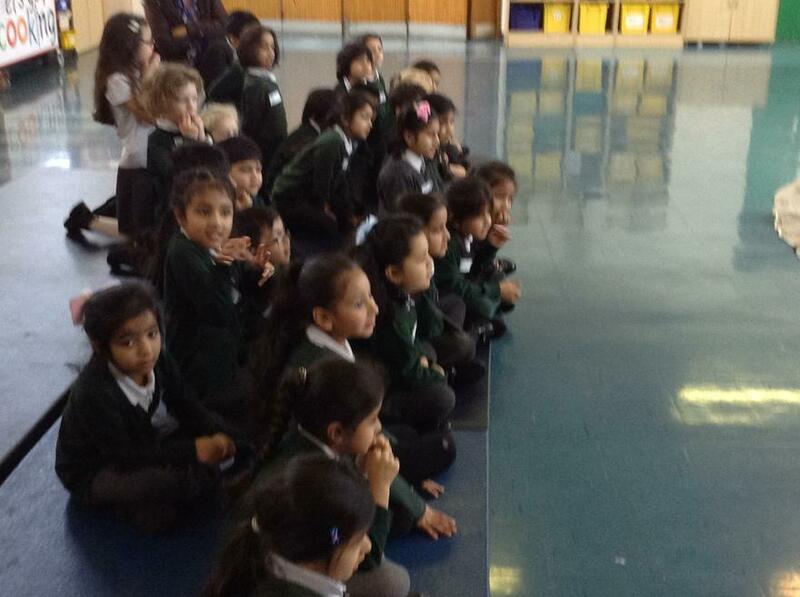 We look forward to seeing them all next week - and seeing you for the Welcome Meeting too! 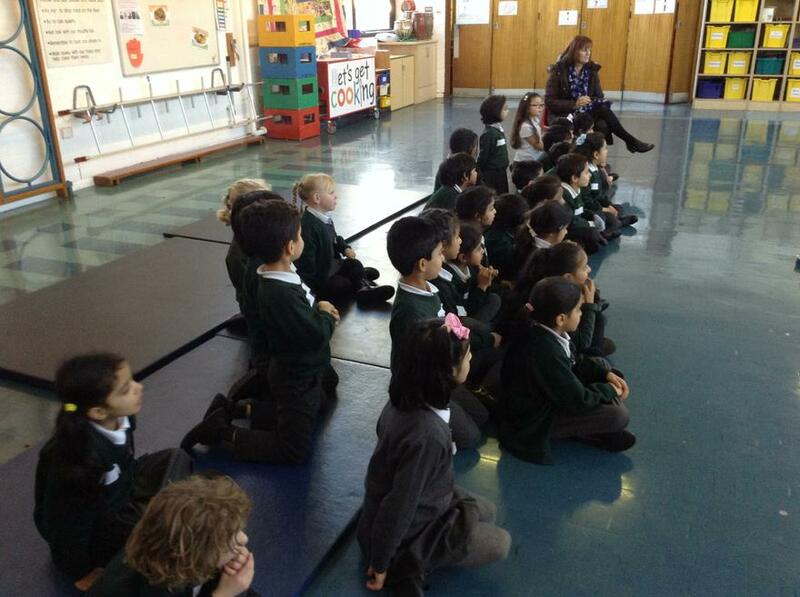 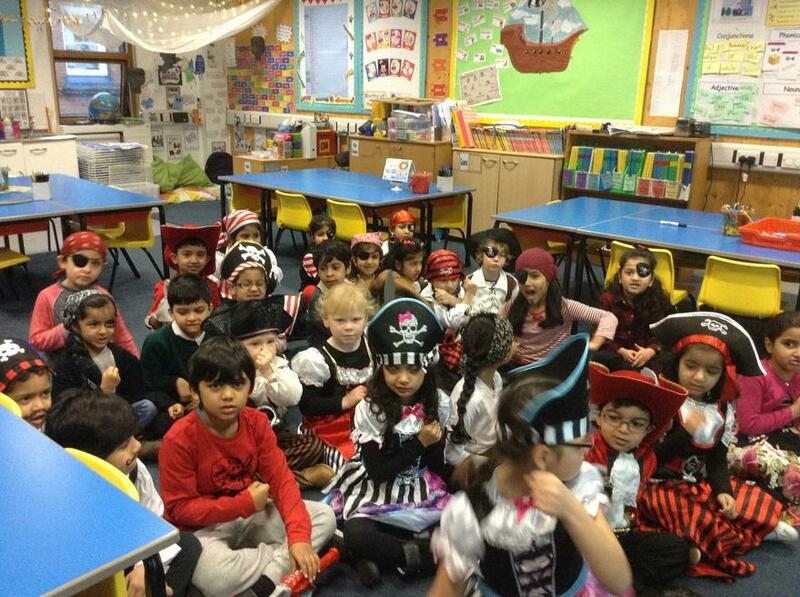 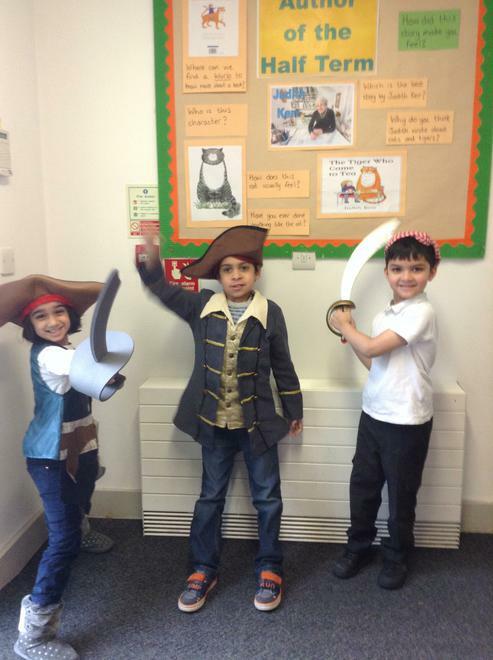 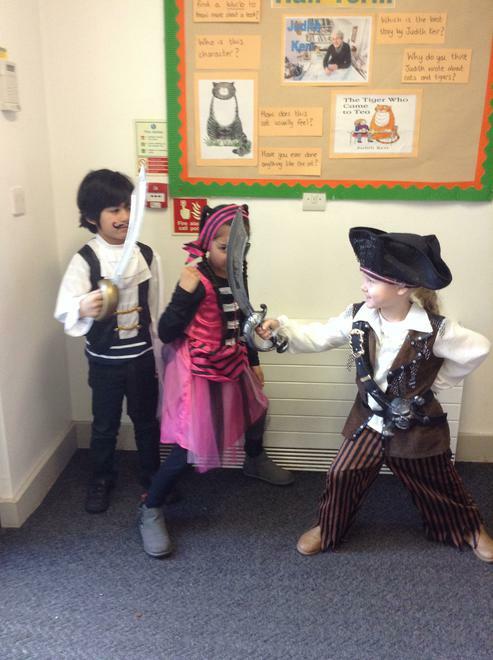 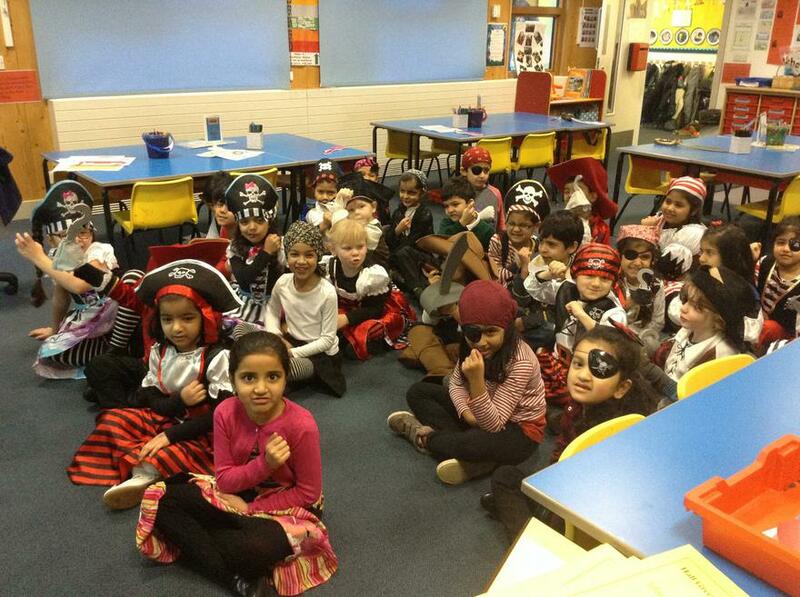 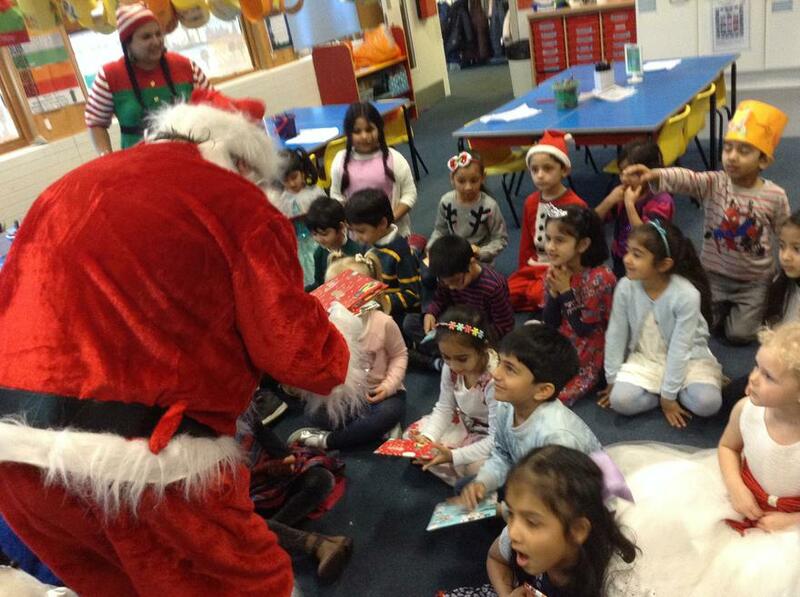 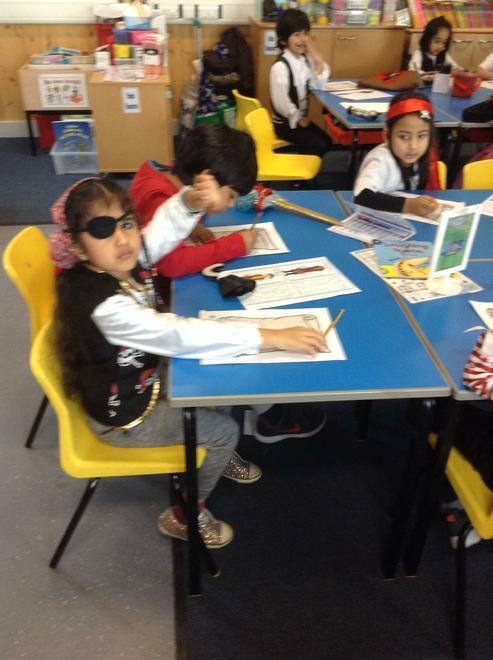 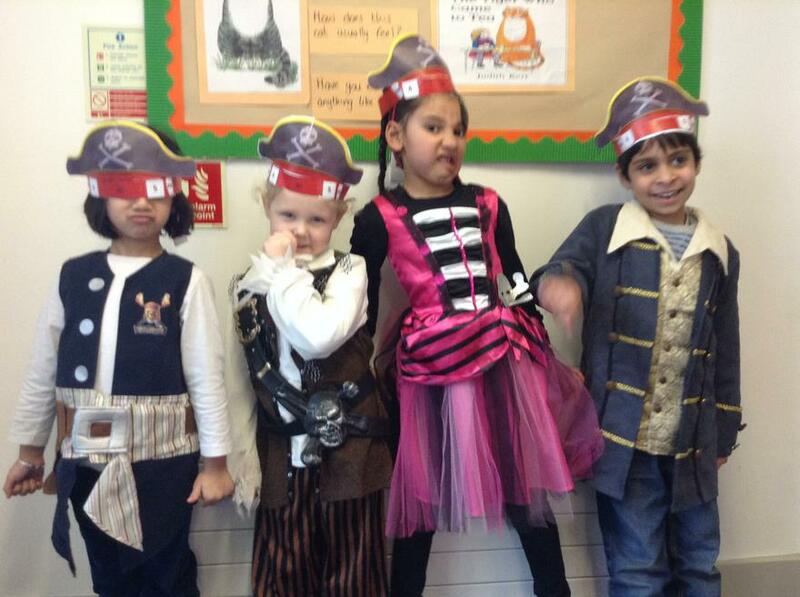 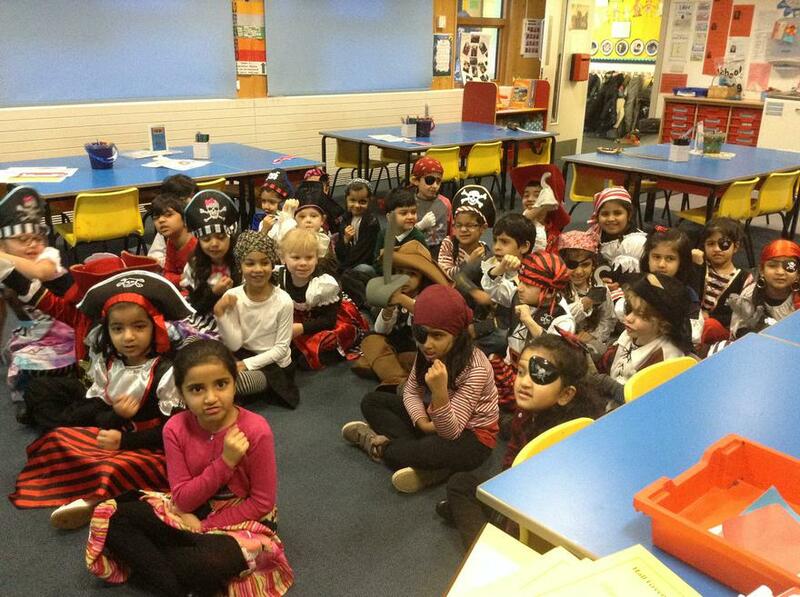 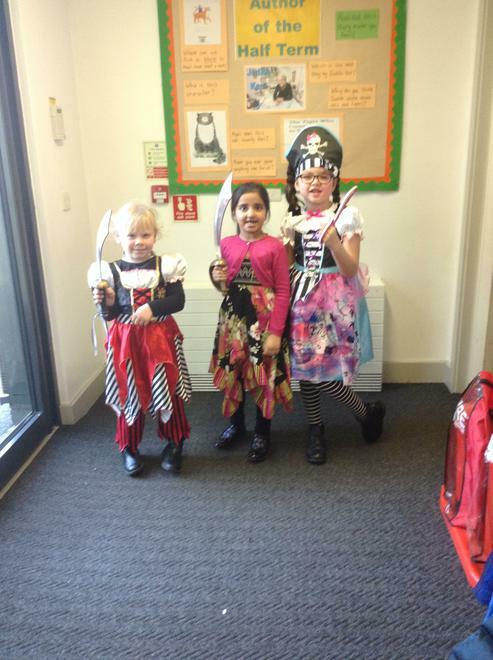 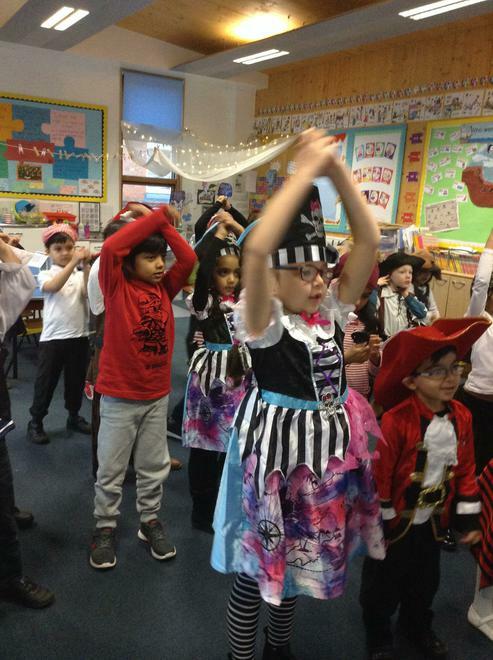 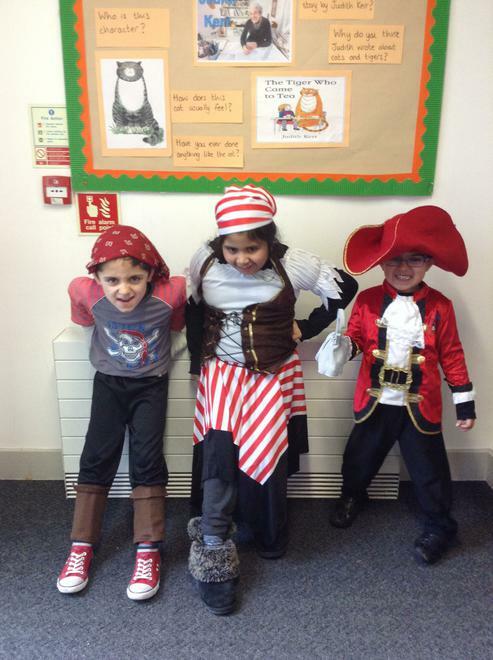 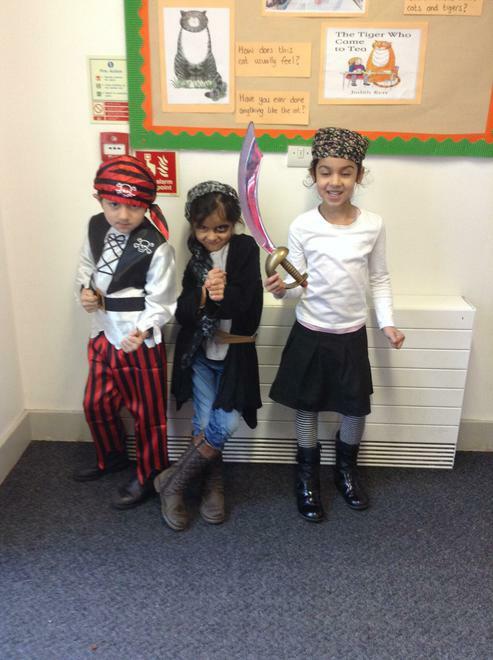 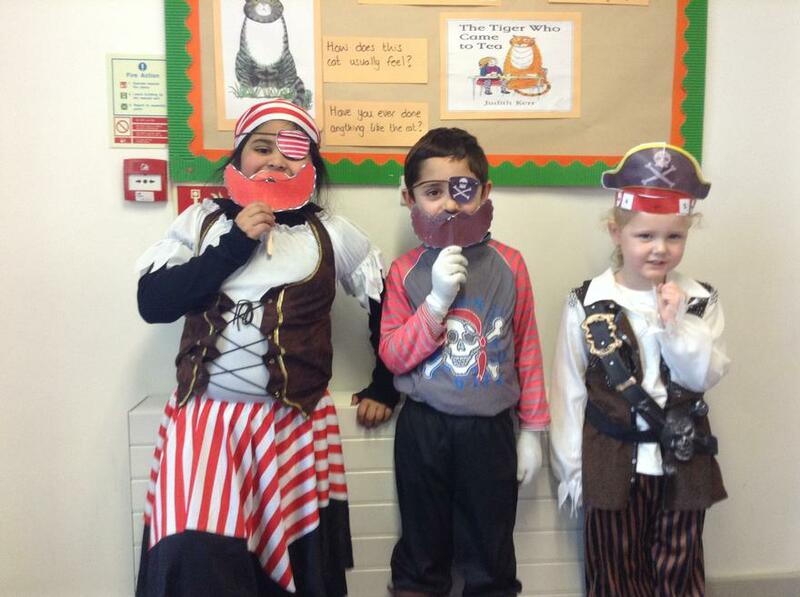 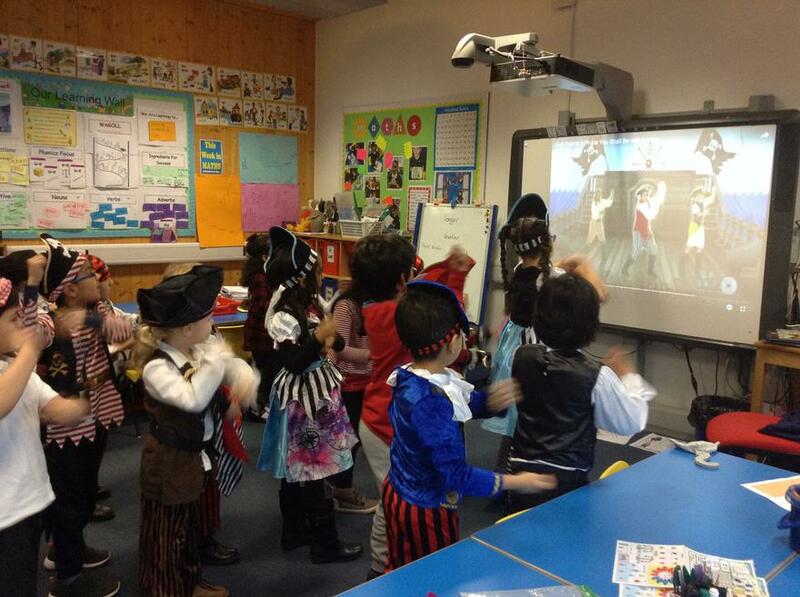 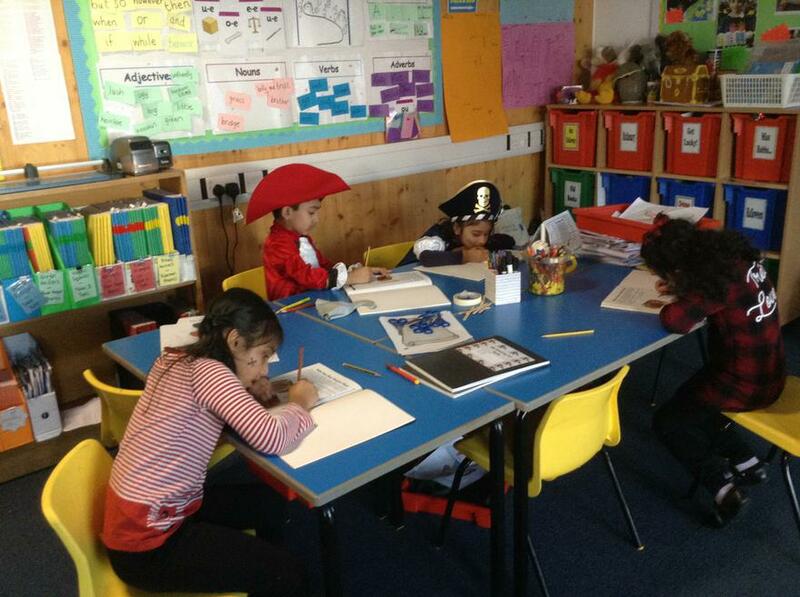 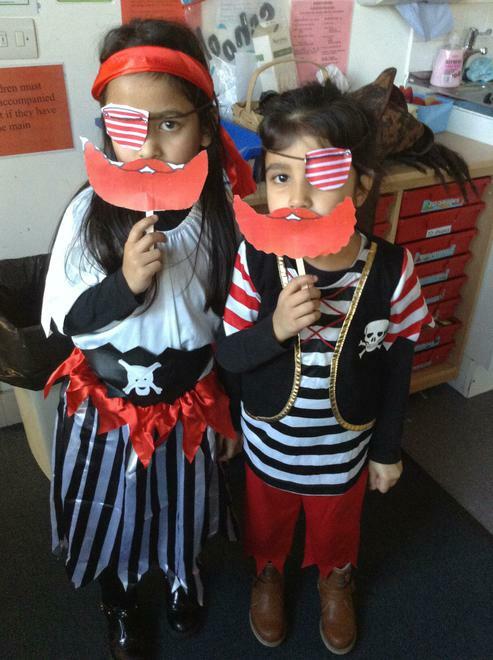 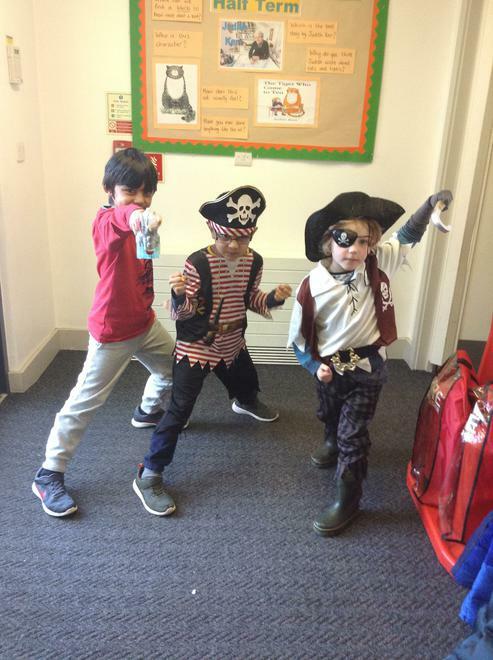 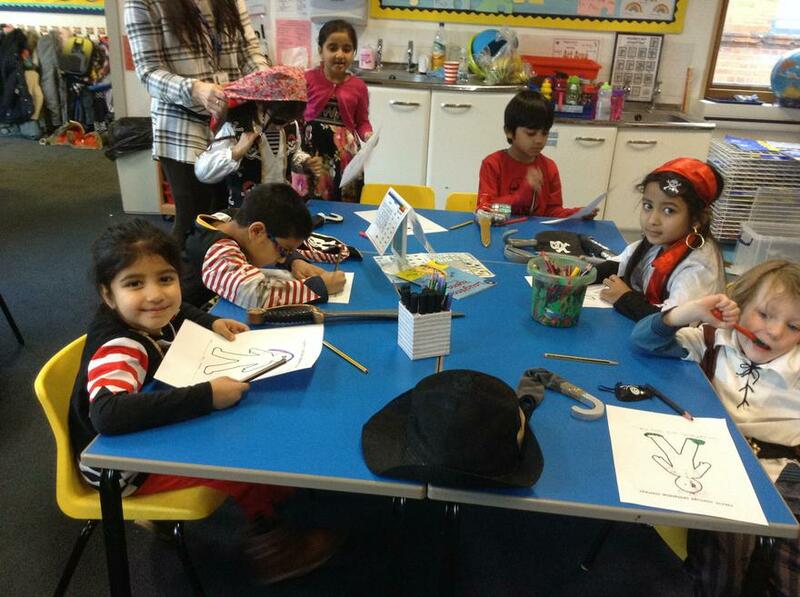 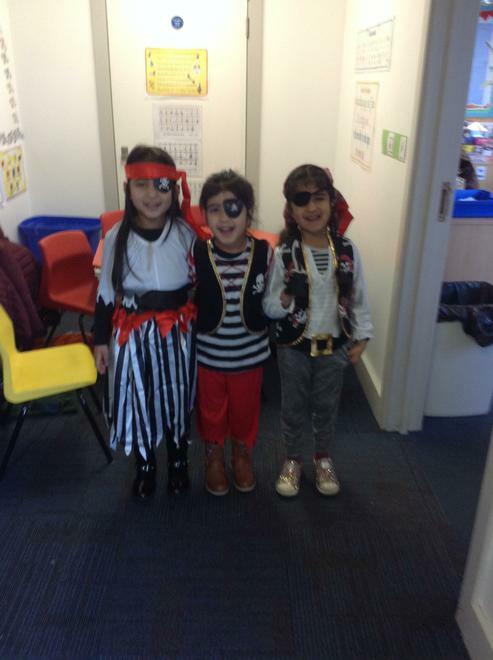 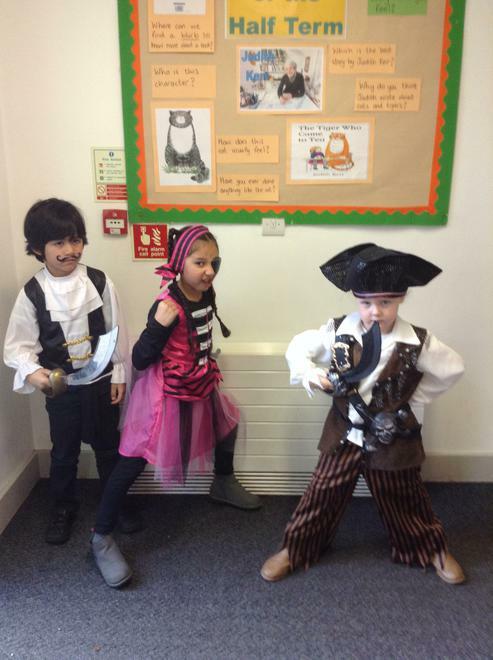 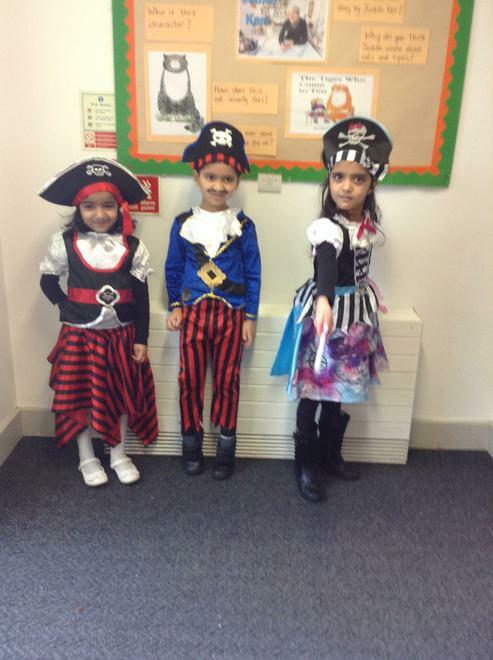 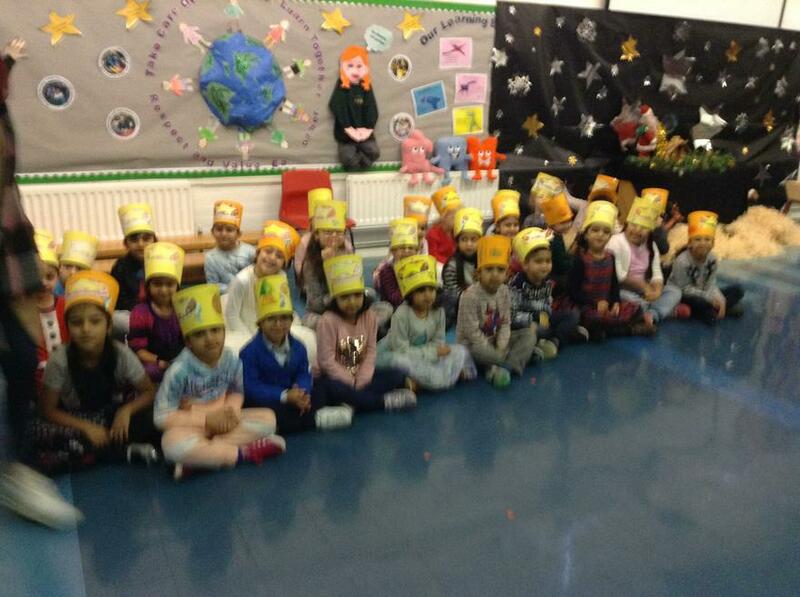 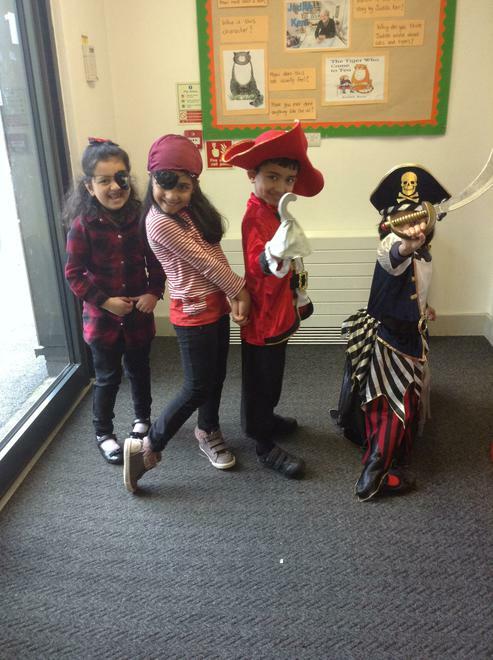 Keep an eye on our class page as I will be adding some photos of our adventures and activities for you.